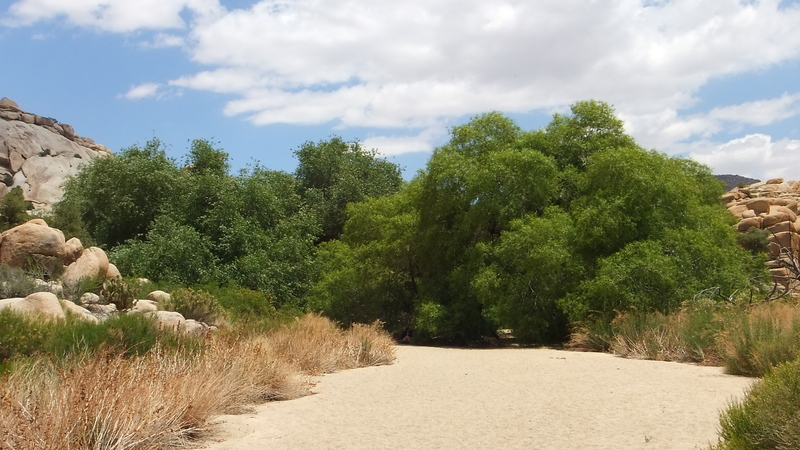 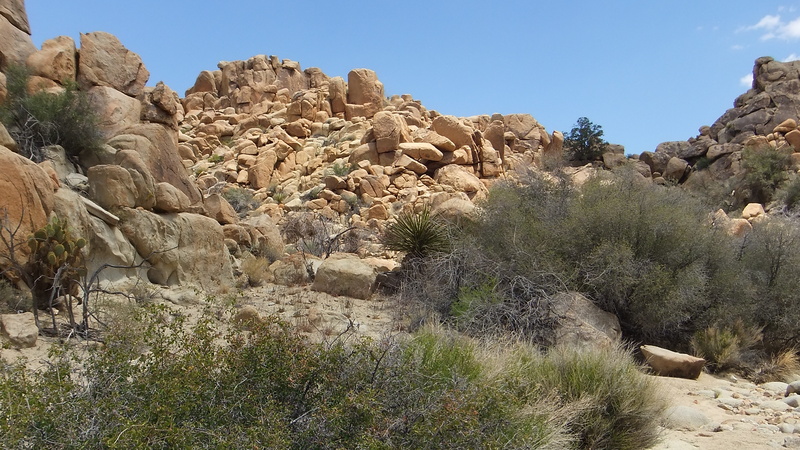 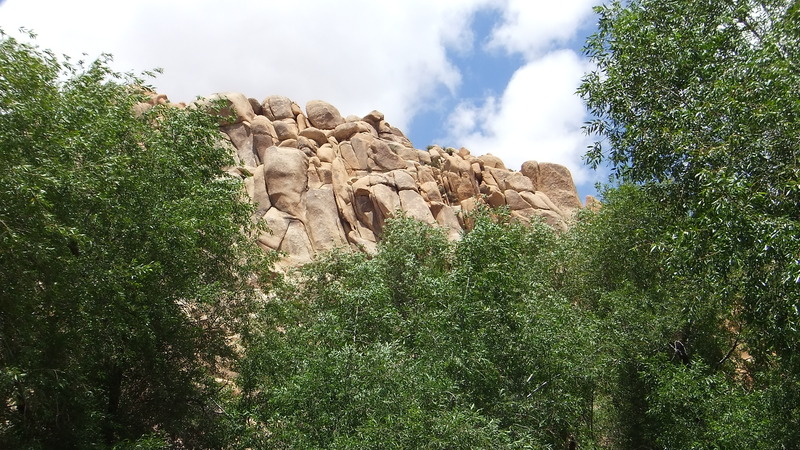 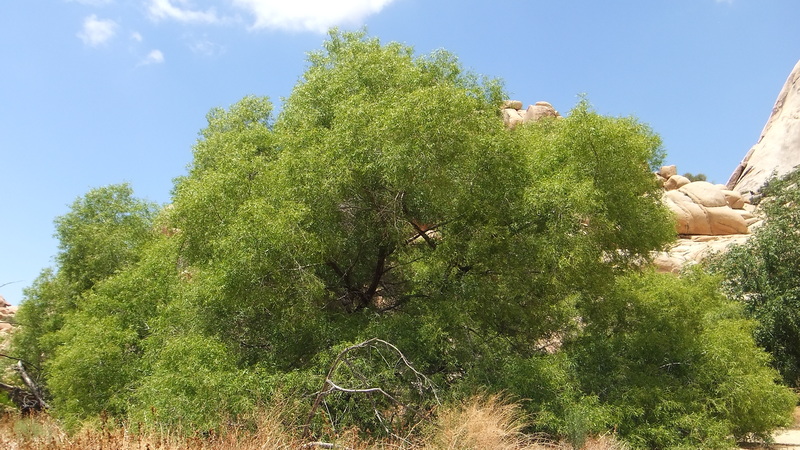 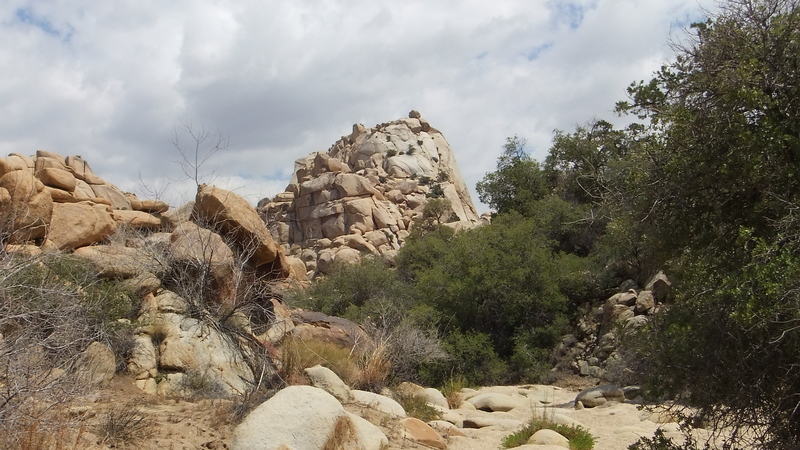 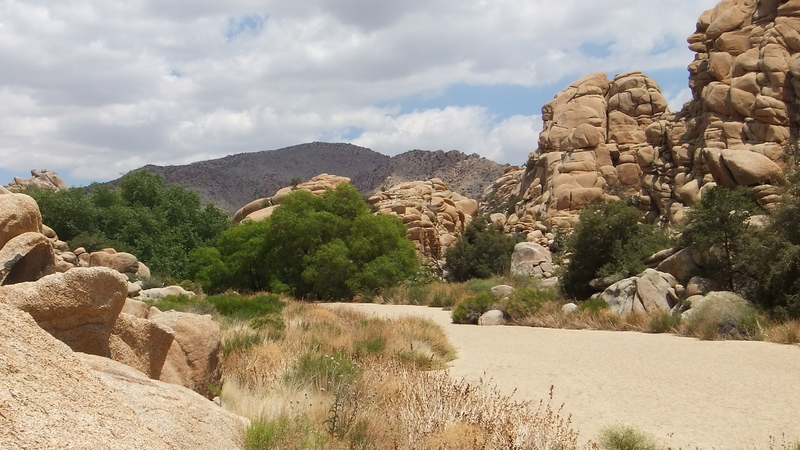 ON SATURDAY, MAY 16TH‘s hike to Willow Trail, I snapped over 350 photographs of the area. 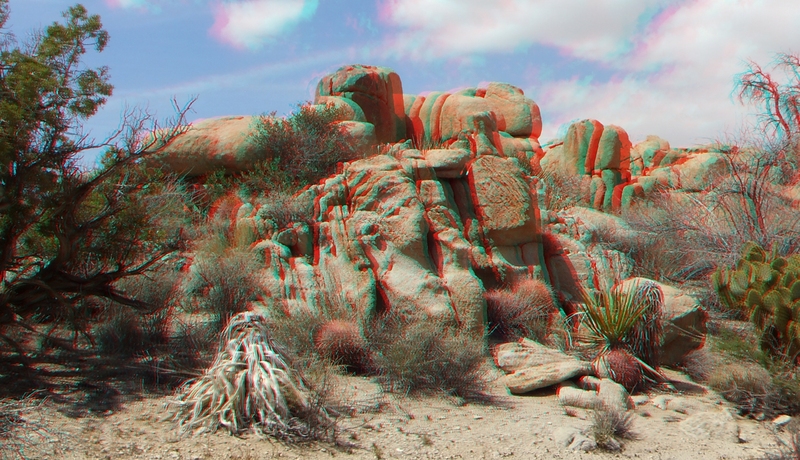 Only 80 or so 3D Anaglyphs will appear here (and the corresponding 2D and 3D Half Side-by-Side images for those who wish to view or download other formats). 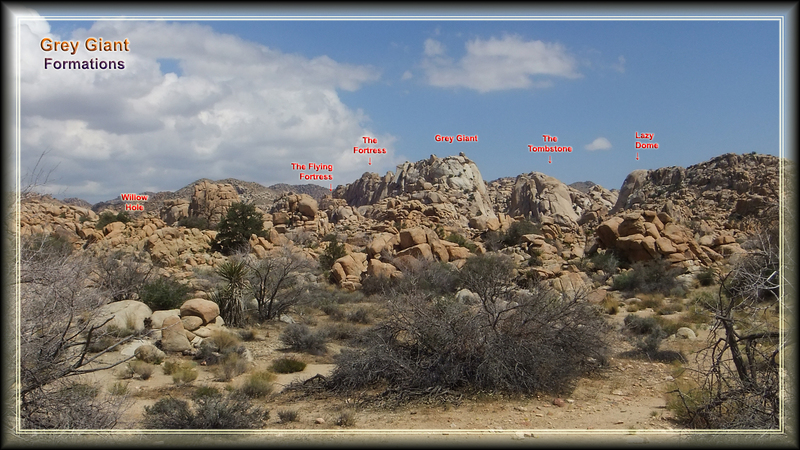 The entire set is available upon request. 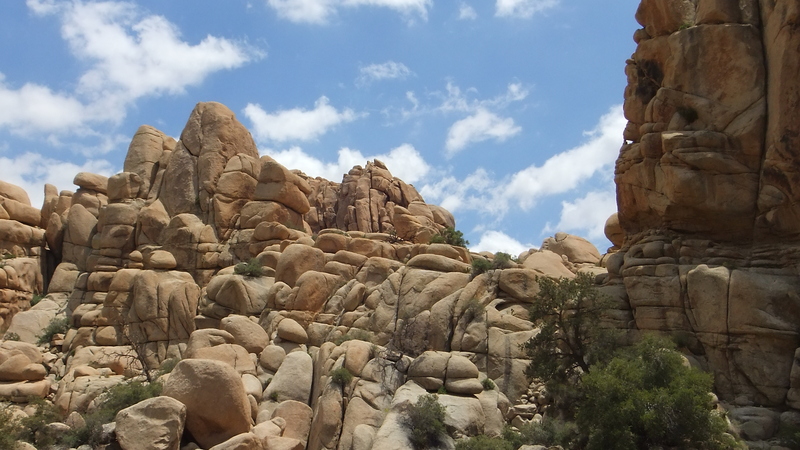 Arrangements can be made for you to mail me an 8gb or 16gb SD card to copy them on and return to you. 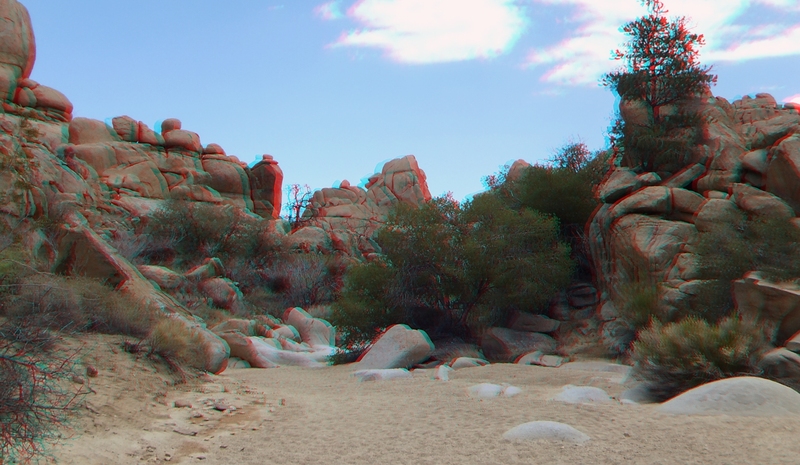 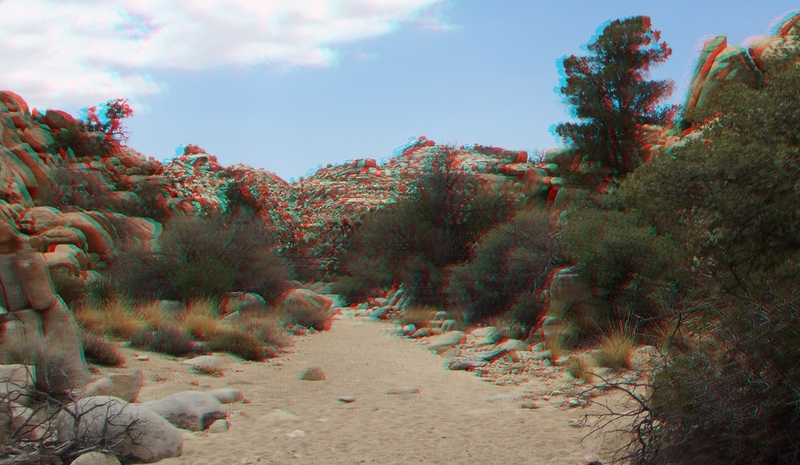 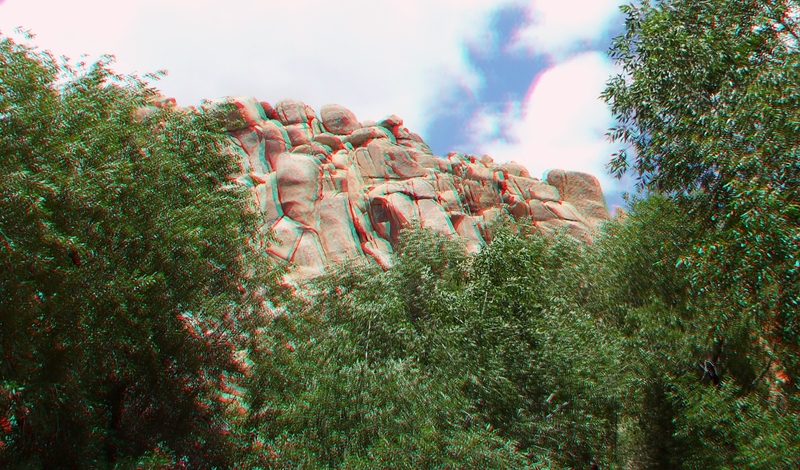 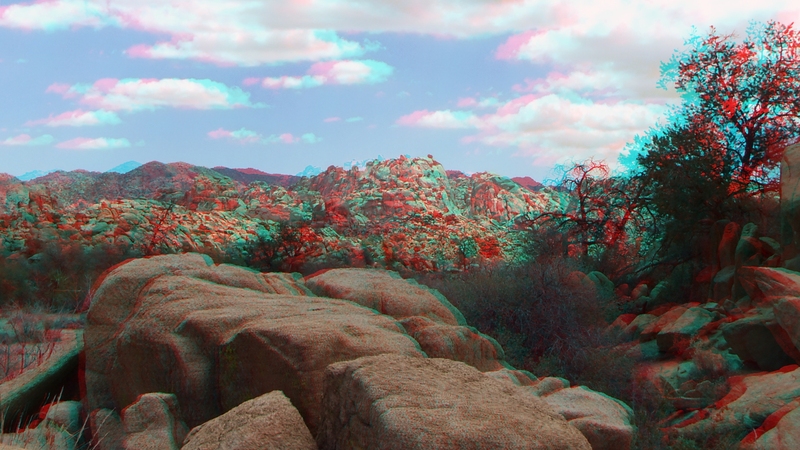 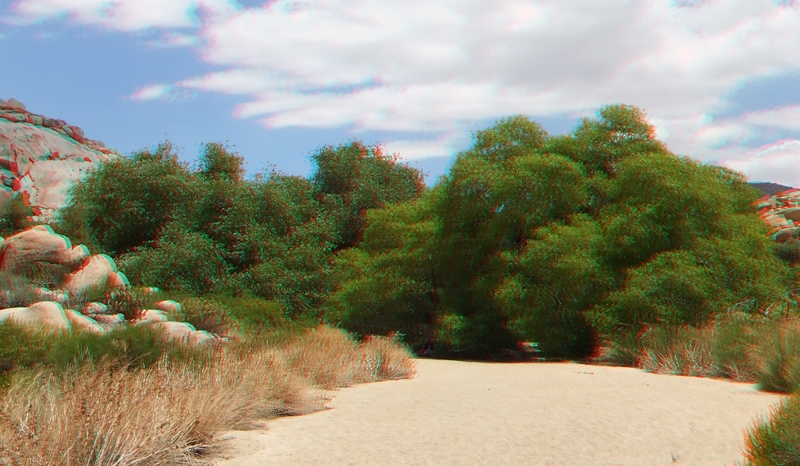 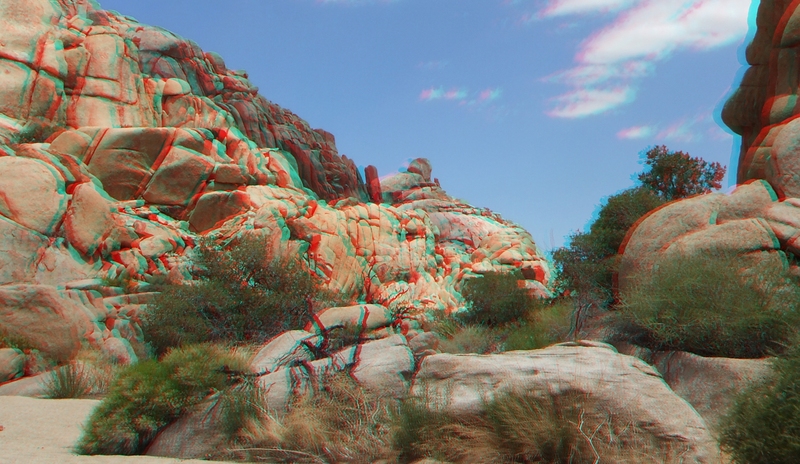 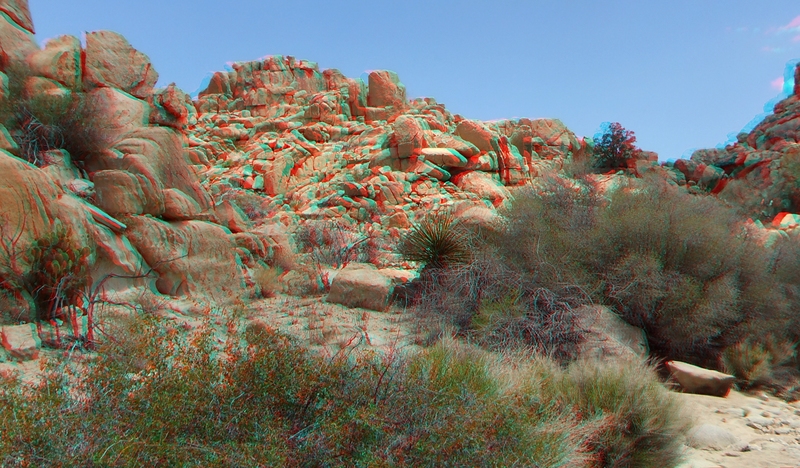 Please feel free to download as many of the 3D Anaglyph or 3D Half Side-by-Side photographs as you wish. 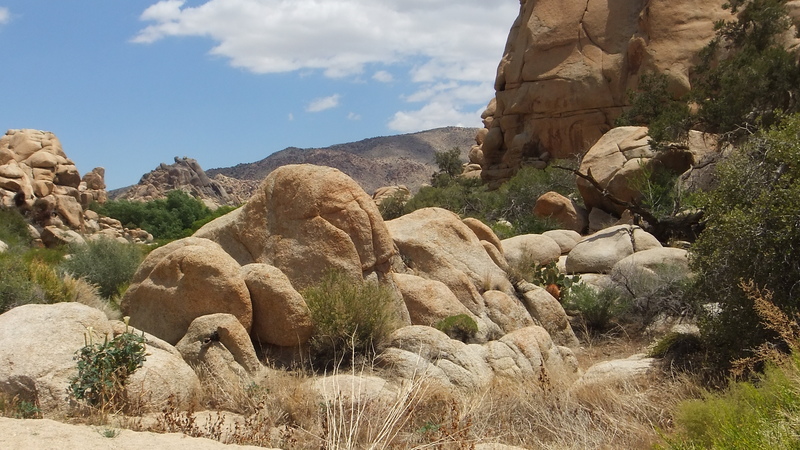 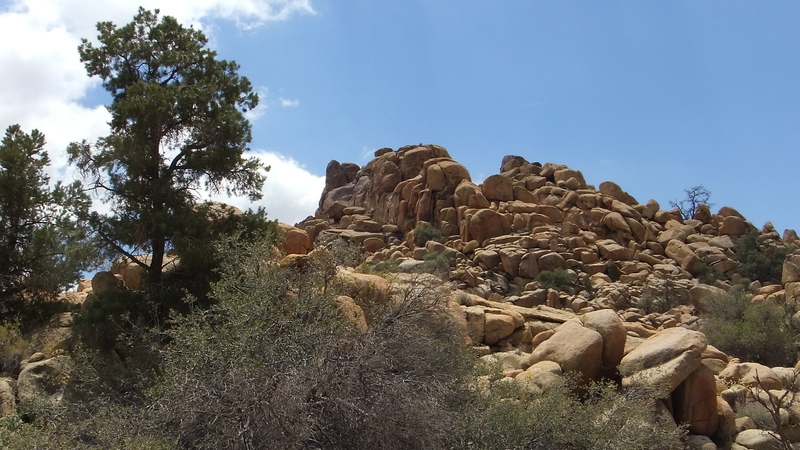 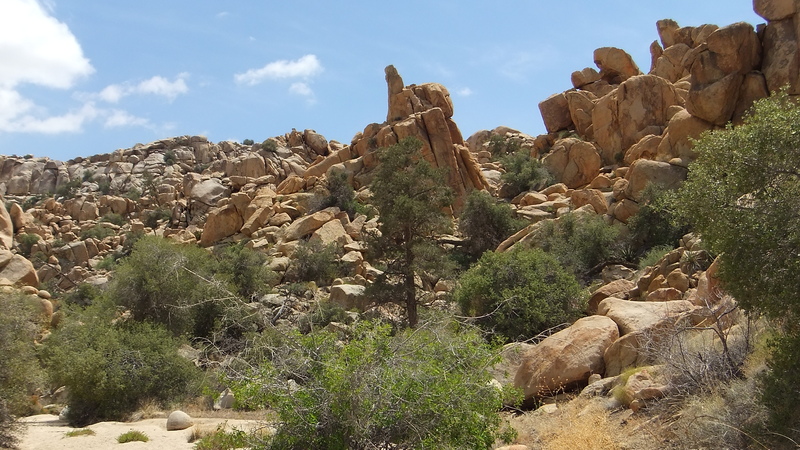 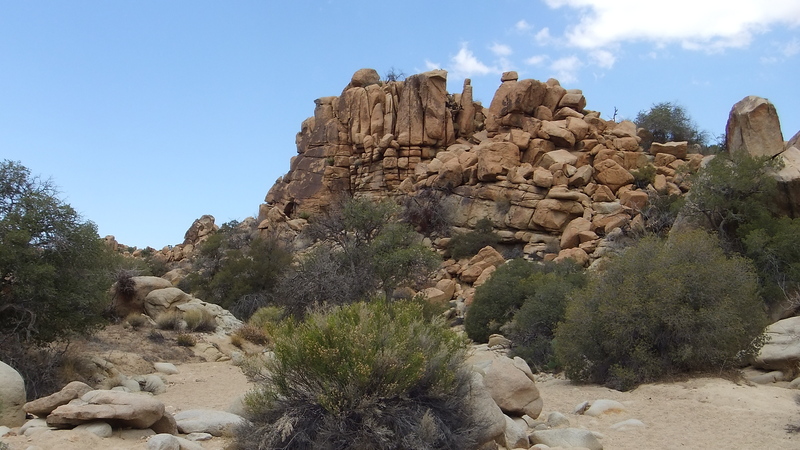 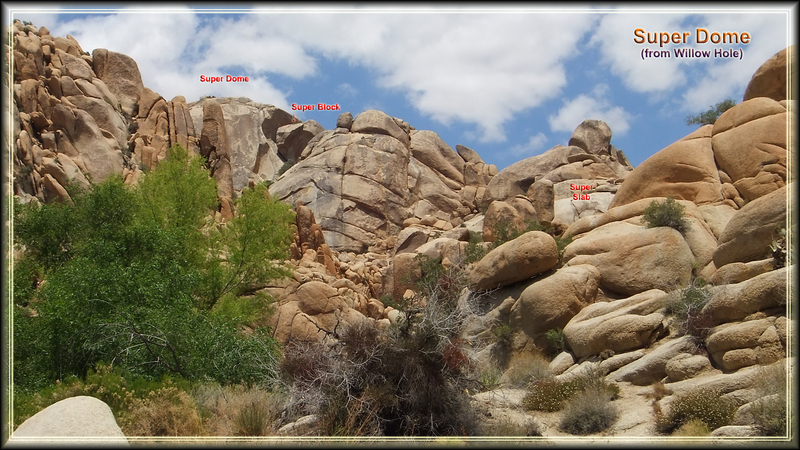 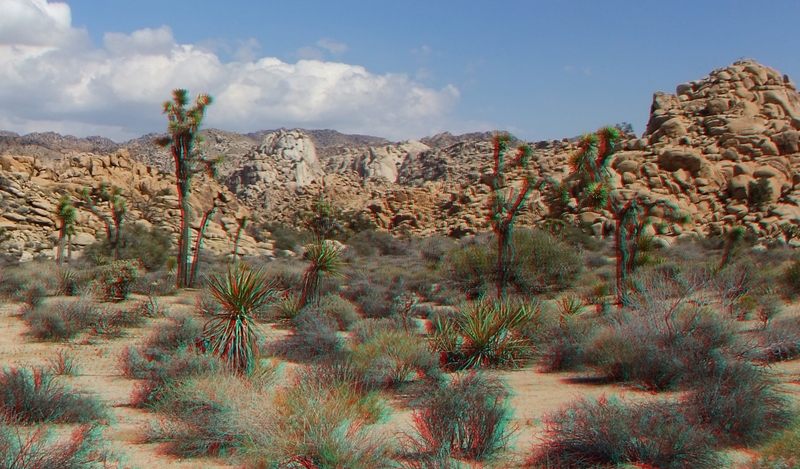 Let others know about Joshuatree3D and what is offered here. 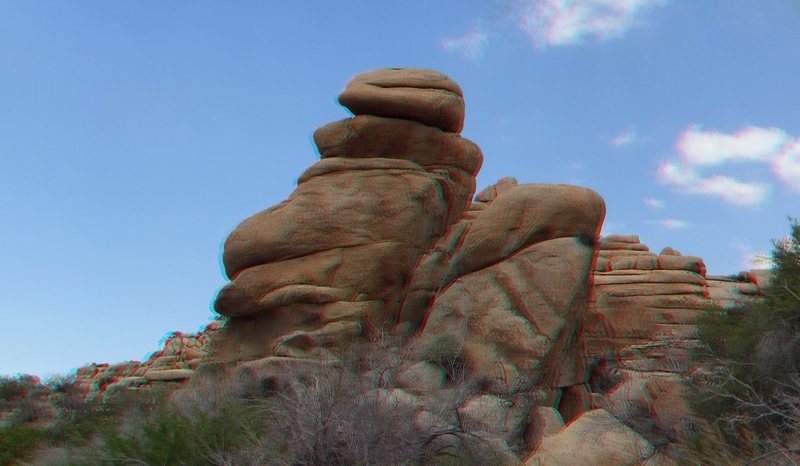 FYI: 3D H-SBS images can be viewed on a 3D TV. 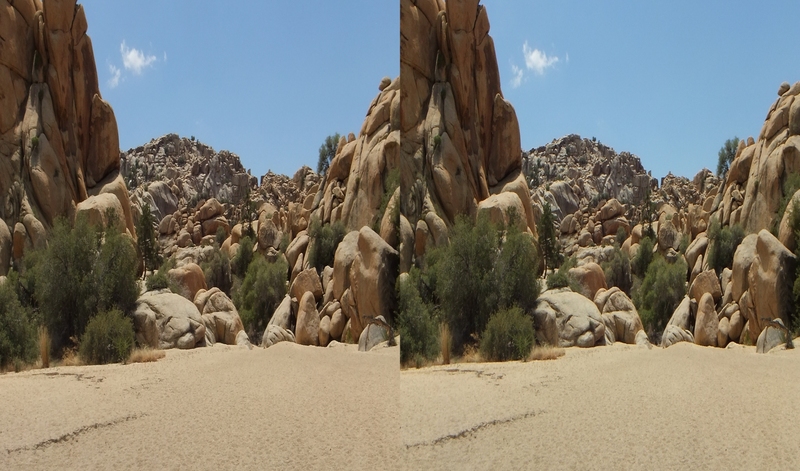 All shots are in widescreen, 16×9 format, since I feel this displays best on today’s widescreen TVs. 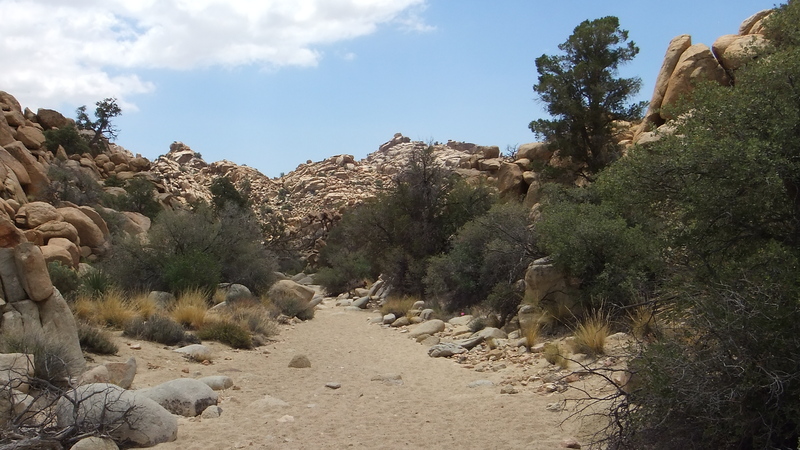 The 3½-mile hike to Willow Hole increasingly overwhelms the eye and senses once you head down the curving wash to your destination. 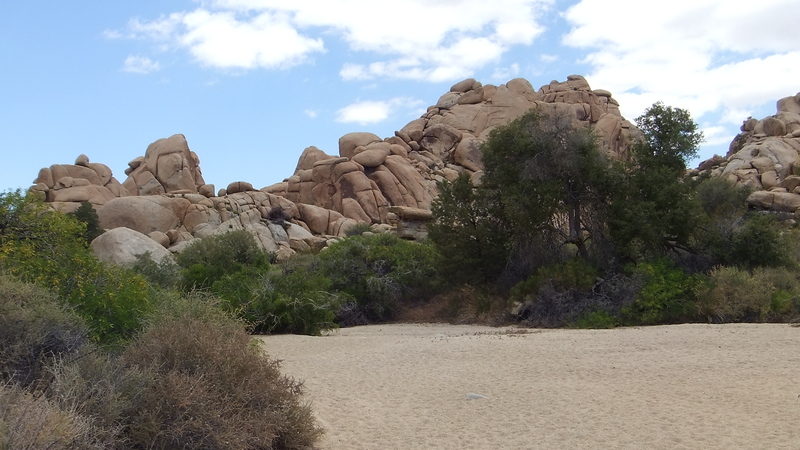 My visit took place on a brisk 60F spring day in mid-May. 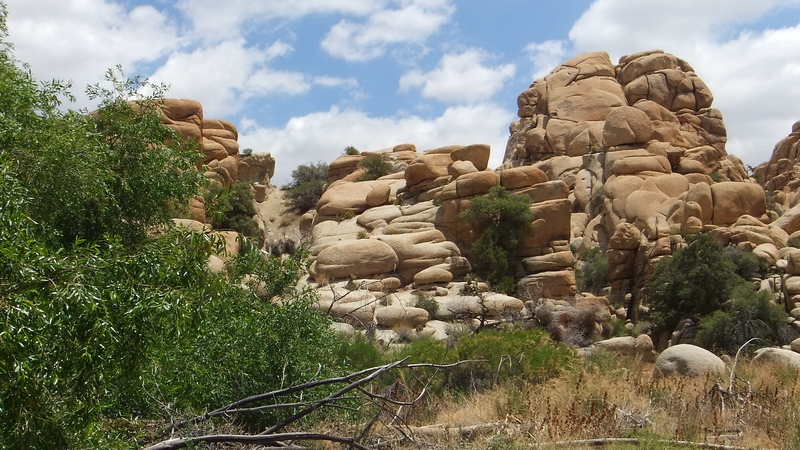 There was a gentle breeze wafting through the canyons, the skies overhead intermittently clouded while letting plenty of sun dance upon the rock formations, endlessly changing their mood and appearance. 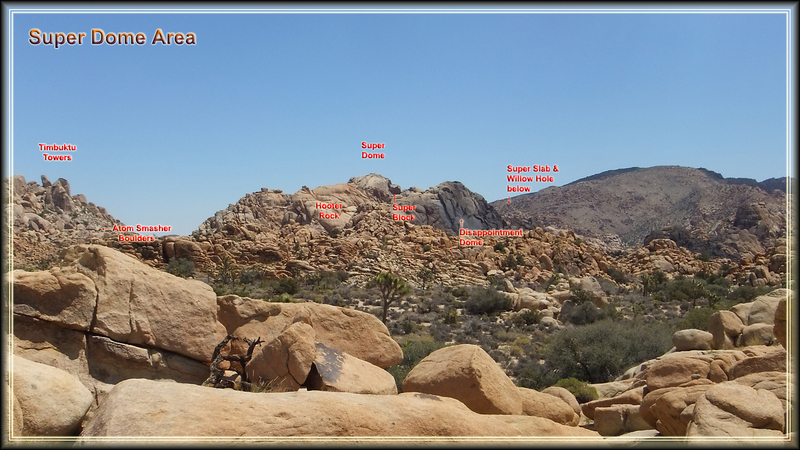 At about the halfway mark, a much less heavily traveled wash heads east .25 mile to the Grey Giant formations. 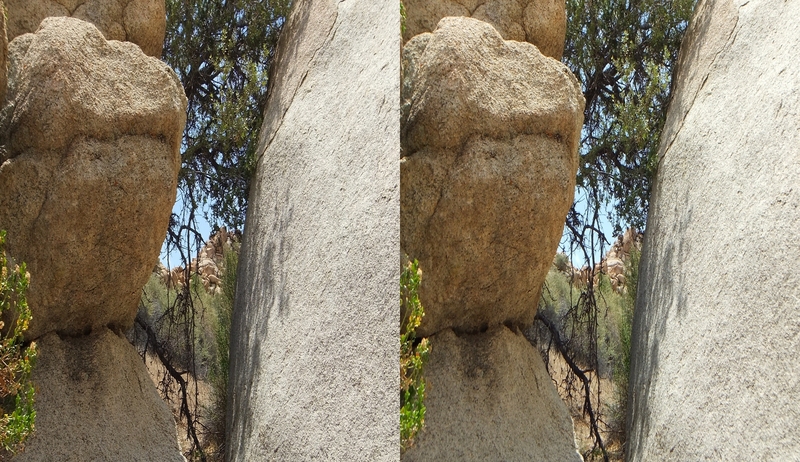 A handy trail post placed here guides the uncertain Willow Hole hiker in the correct direction. 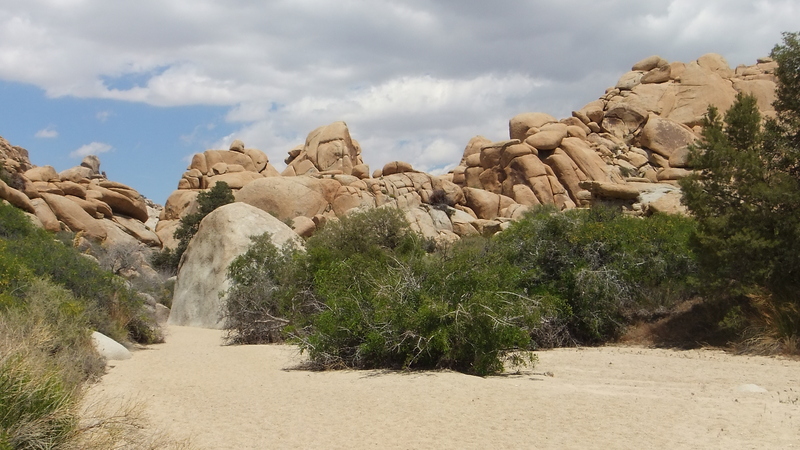 Deep sand on the final half-mile stretch to Willow Hole really exercises the calf muscles. 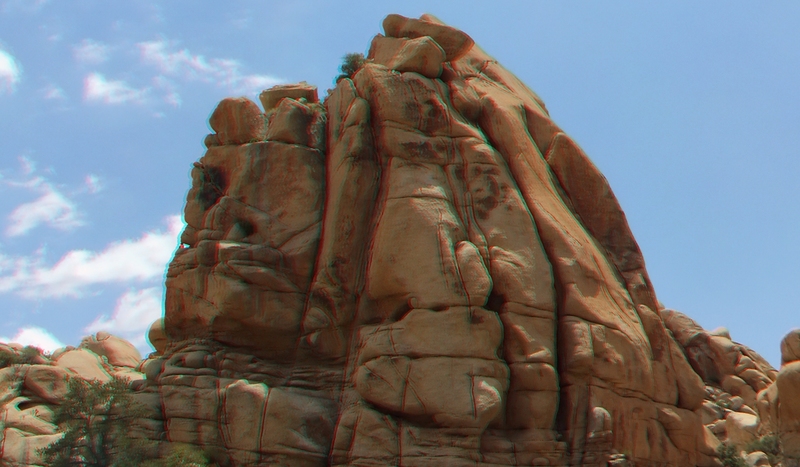 Be prepared. 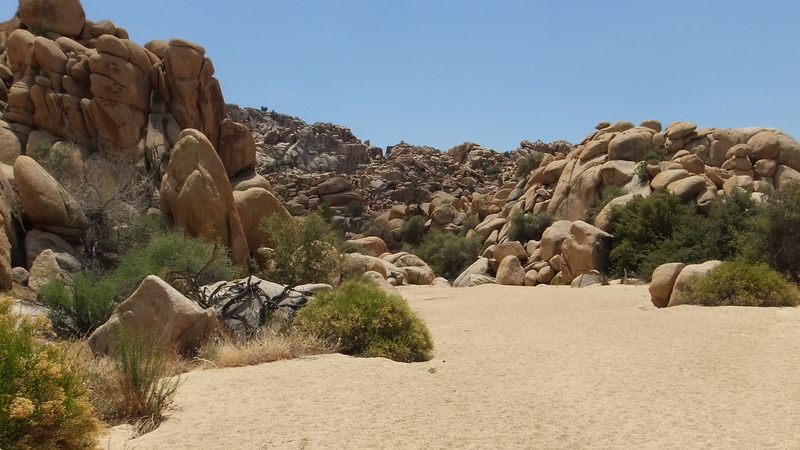 A young woman carrying her sandals scrunched passed me barefoot. 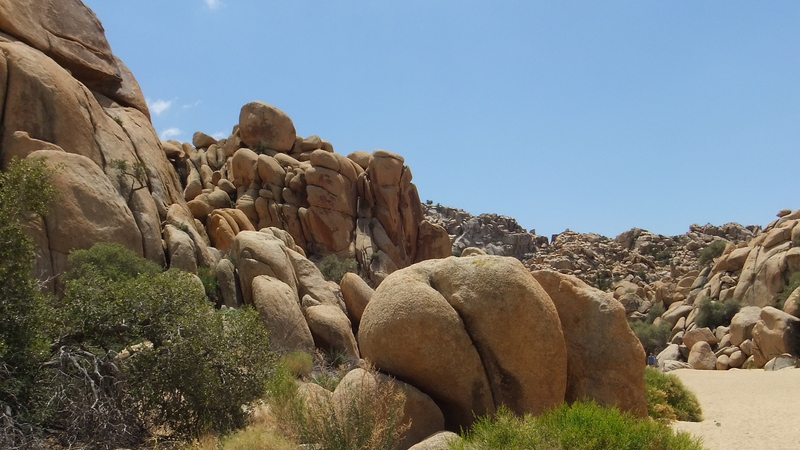 I am sure her tootsies would be quite sore by the time she finished her 7-mile round-trip journey. 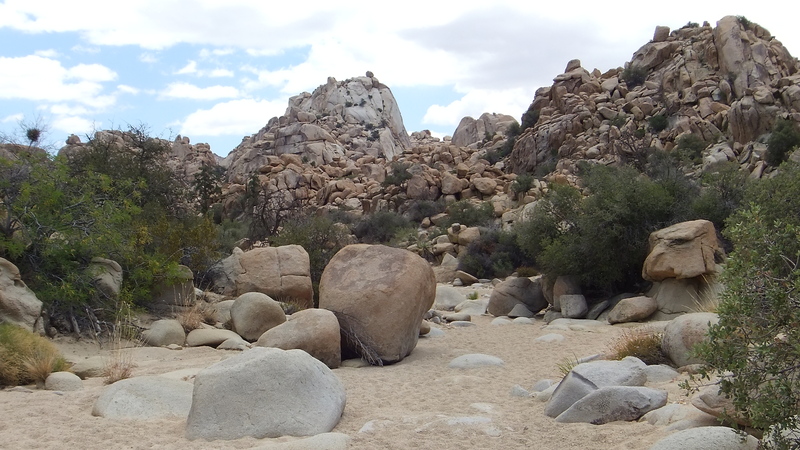 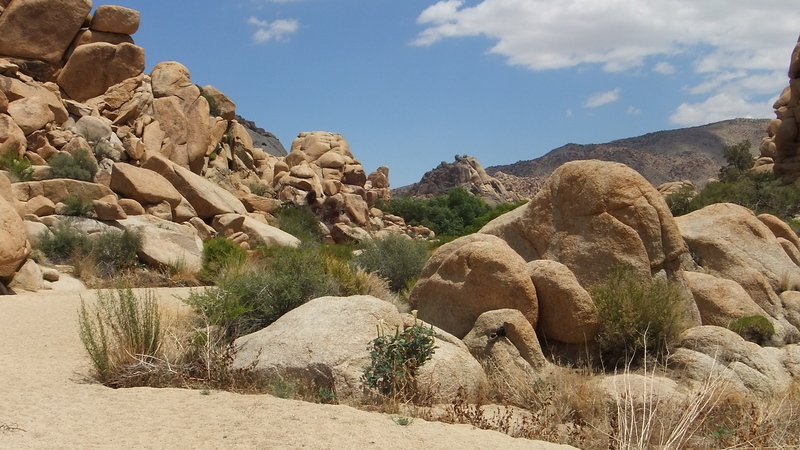 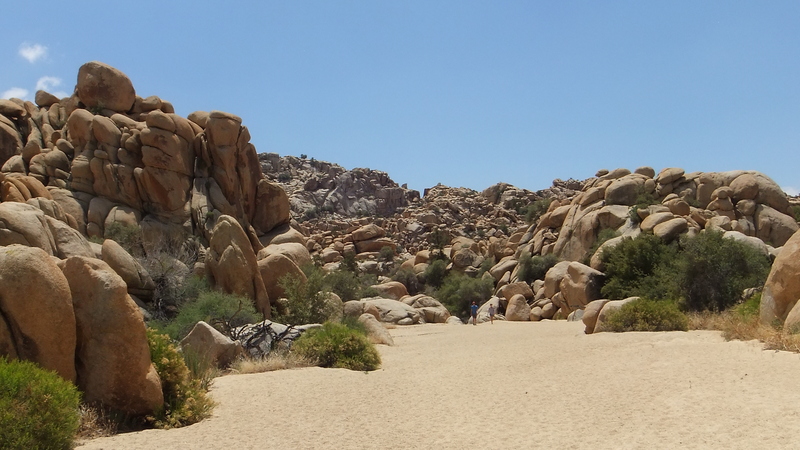 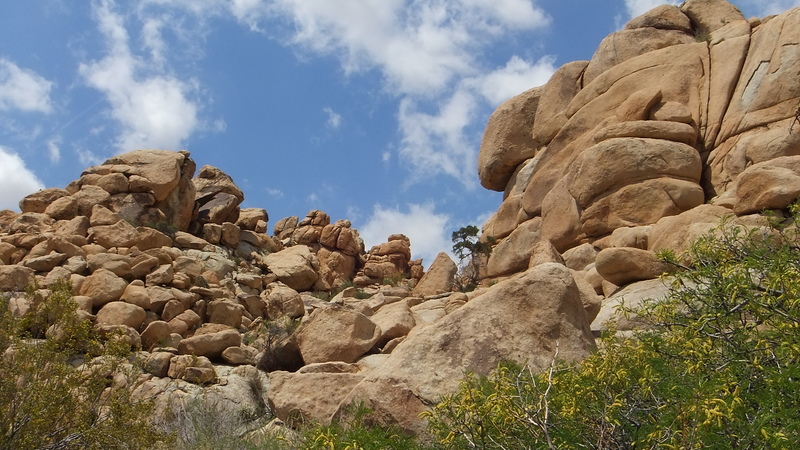 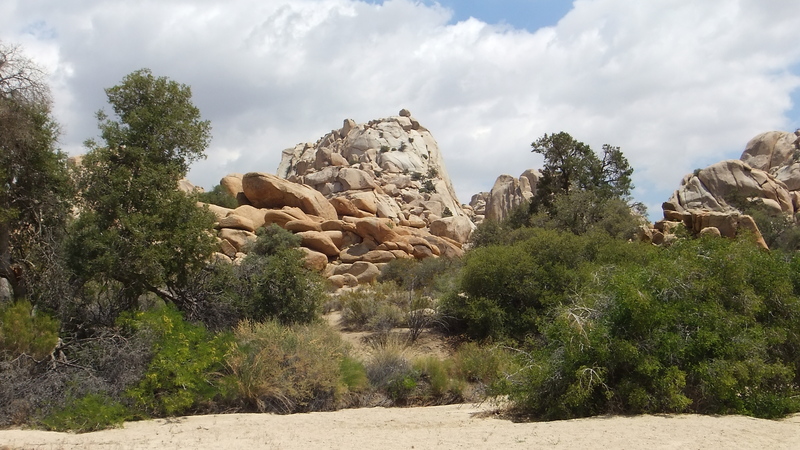 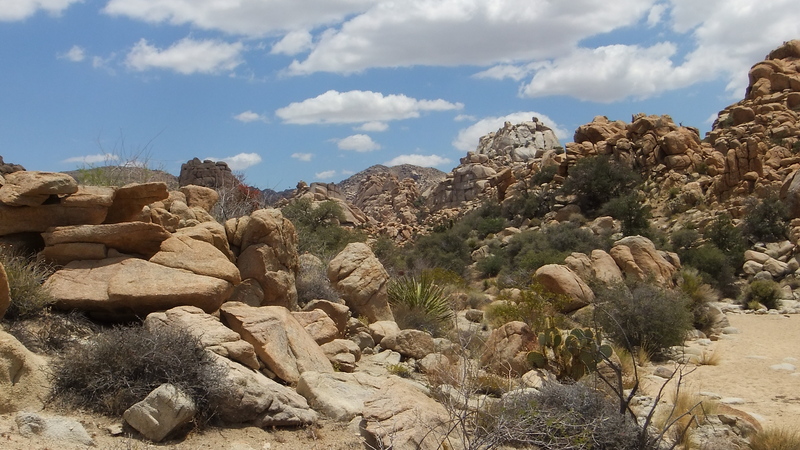 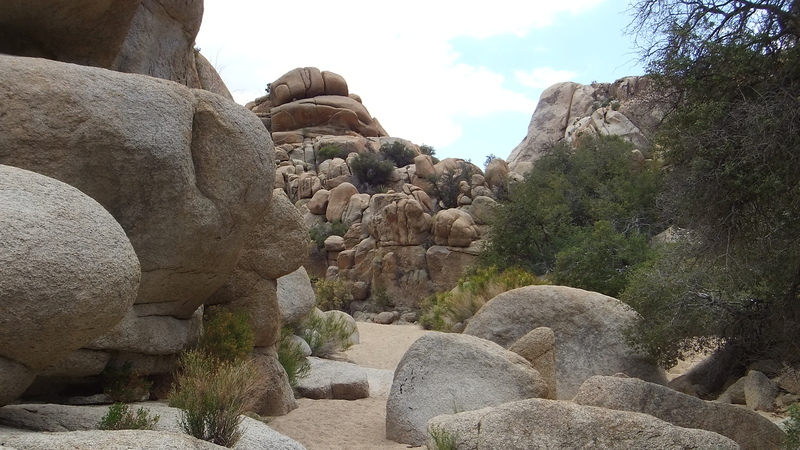 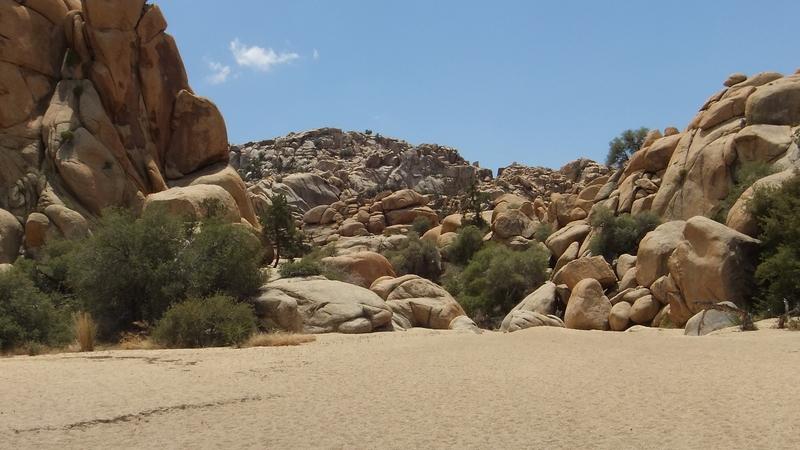 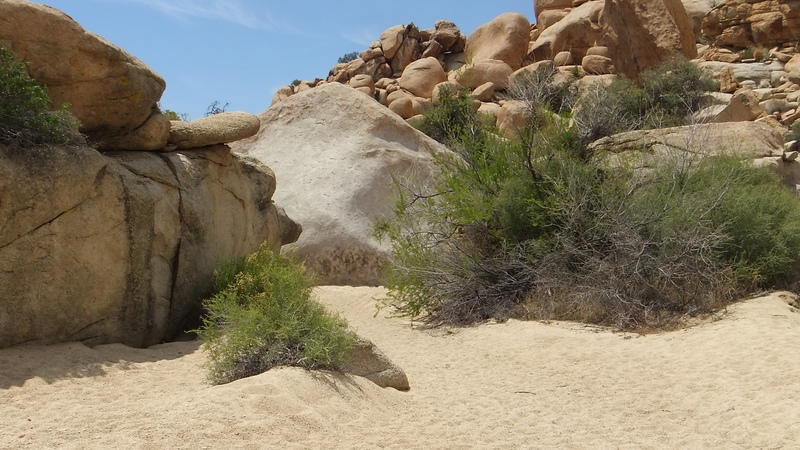 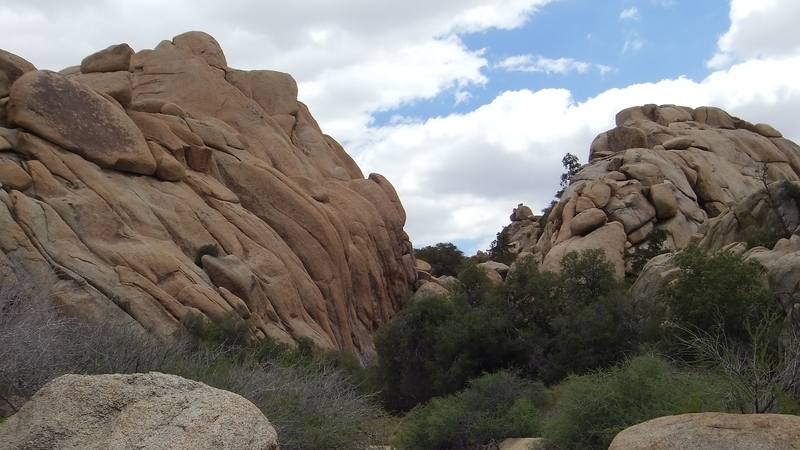 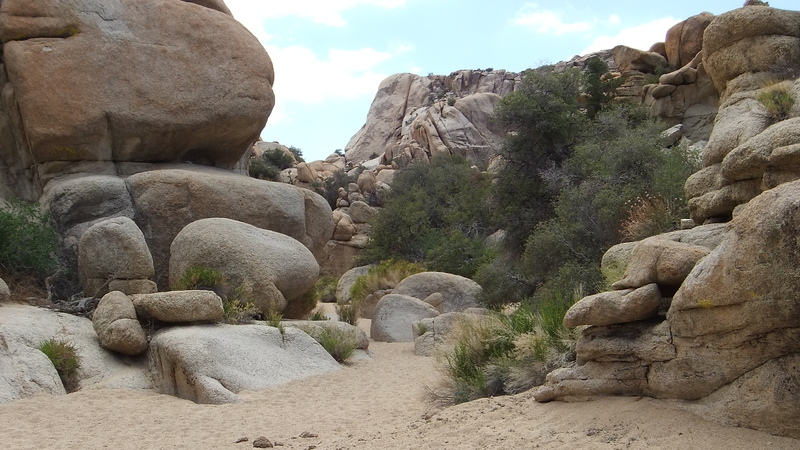 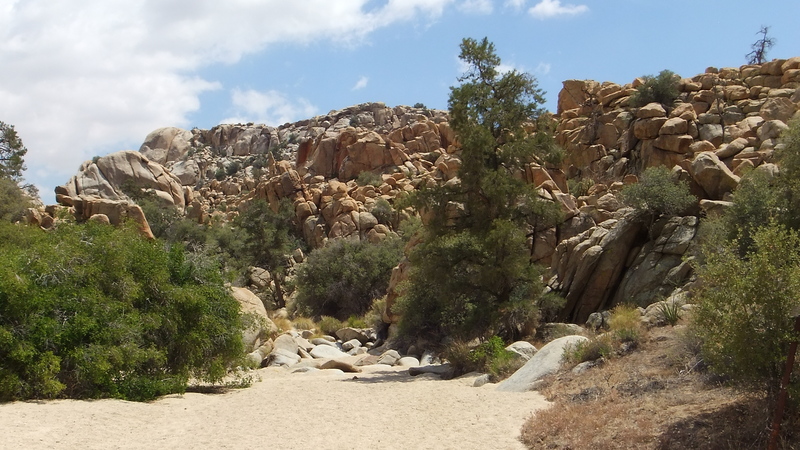 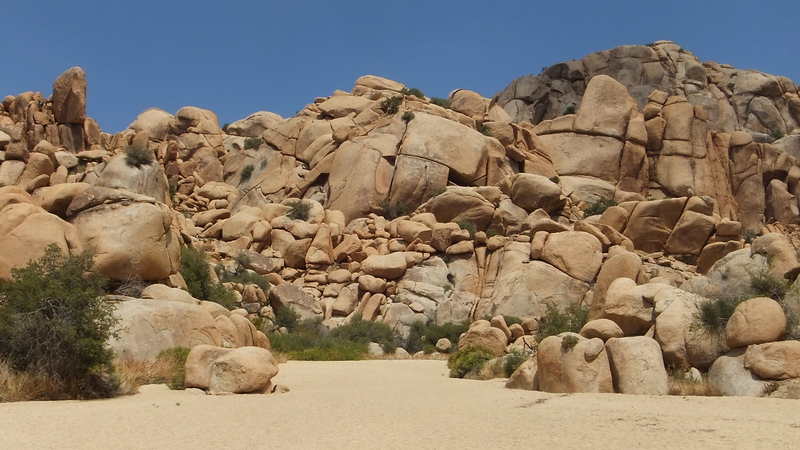 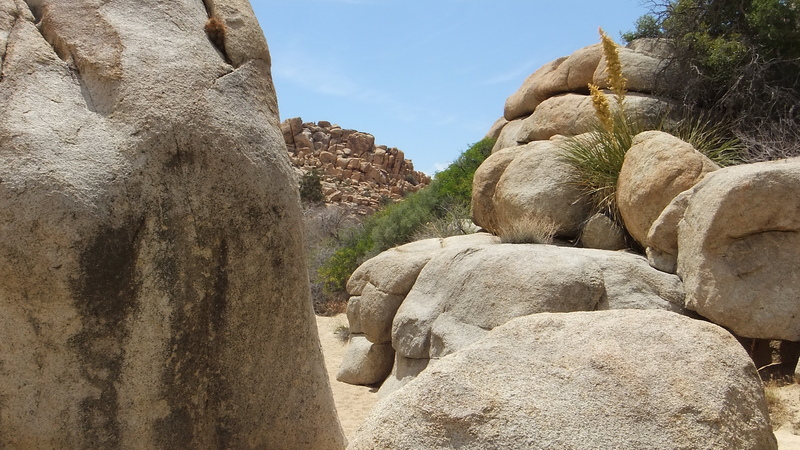 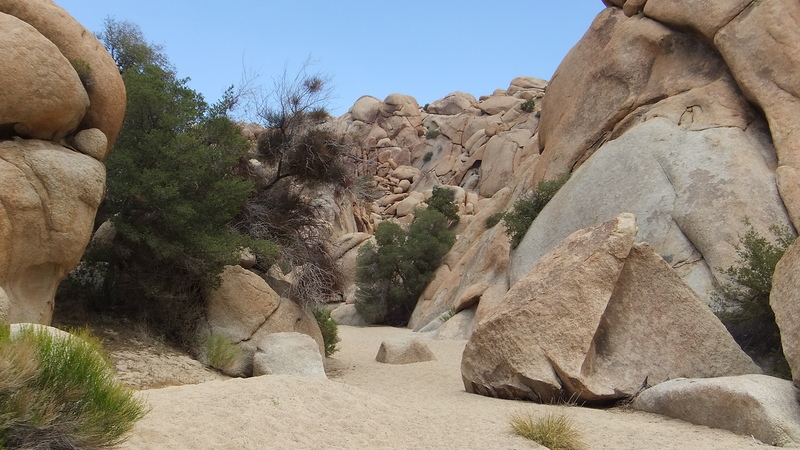 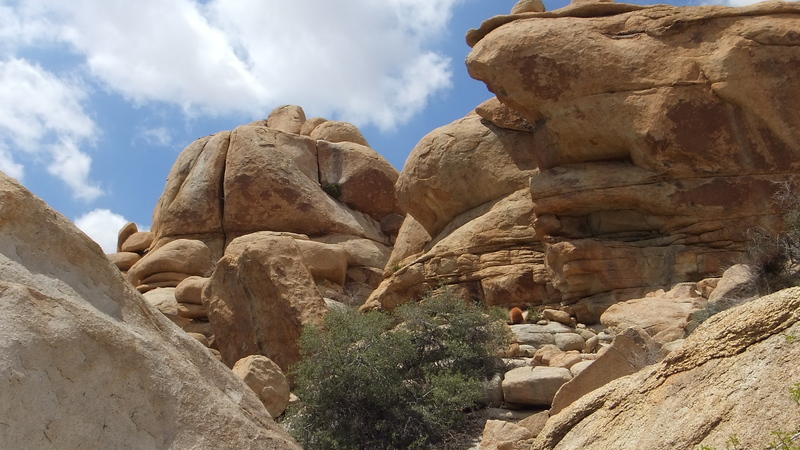 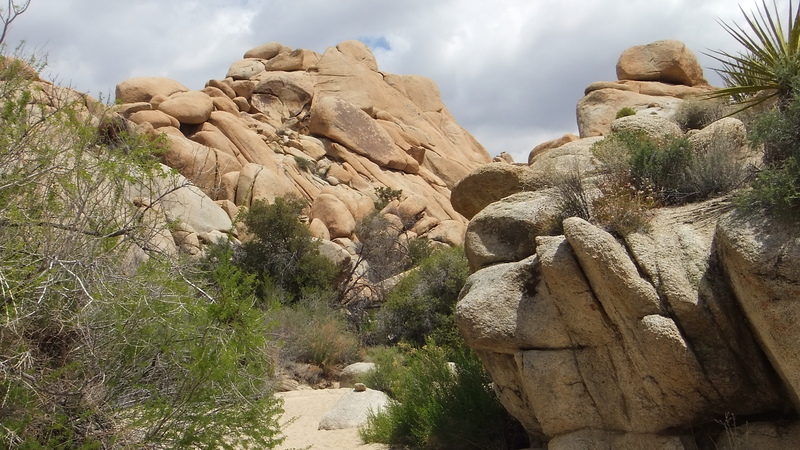 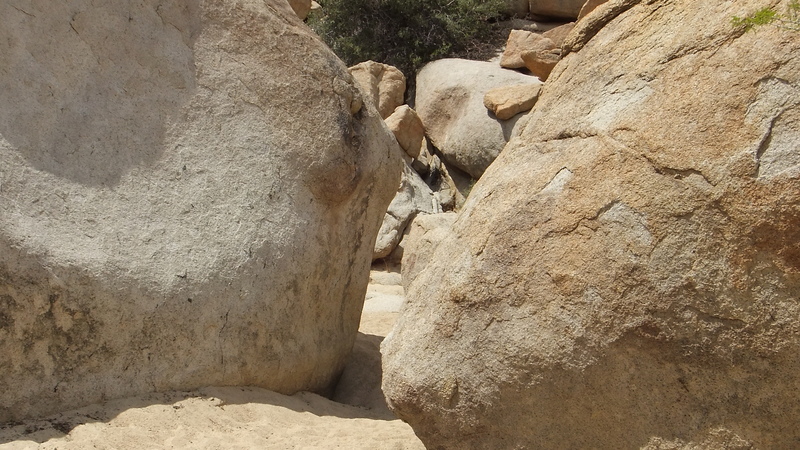 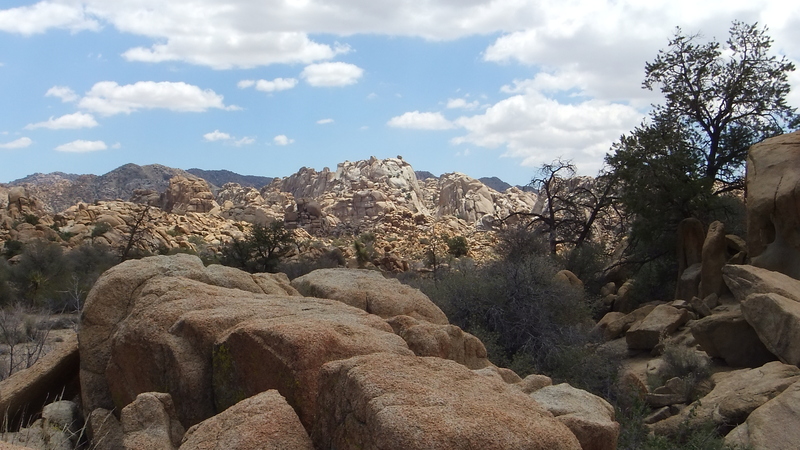 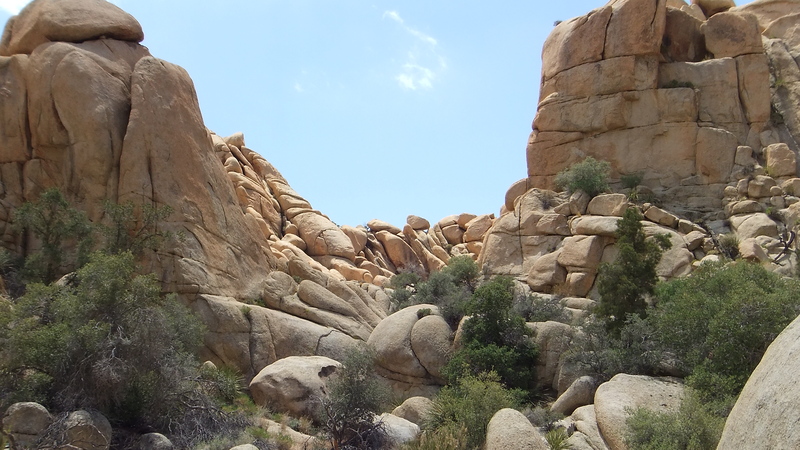 A few dozen paces beyond the Grey Giant wash, the main trail to Willow Hole tightens until you confront a gigantic boulder stuck in the sand, which seems to block further advancement. 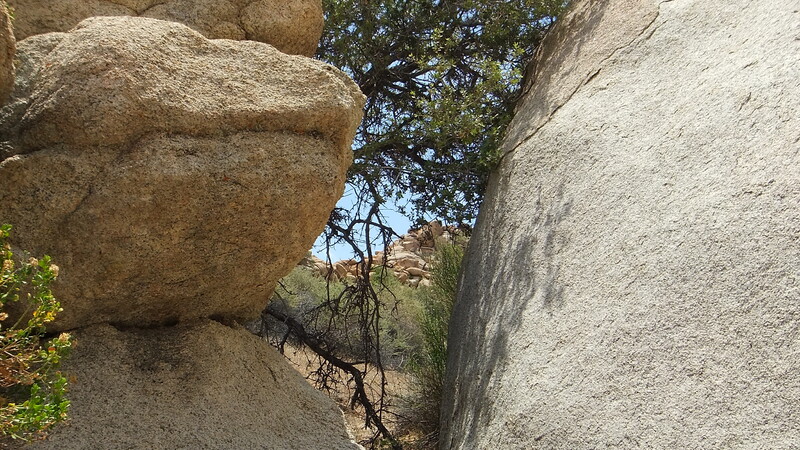 Once senses an impediment, How can this be? 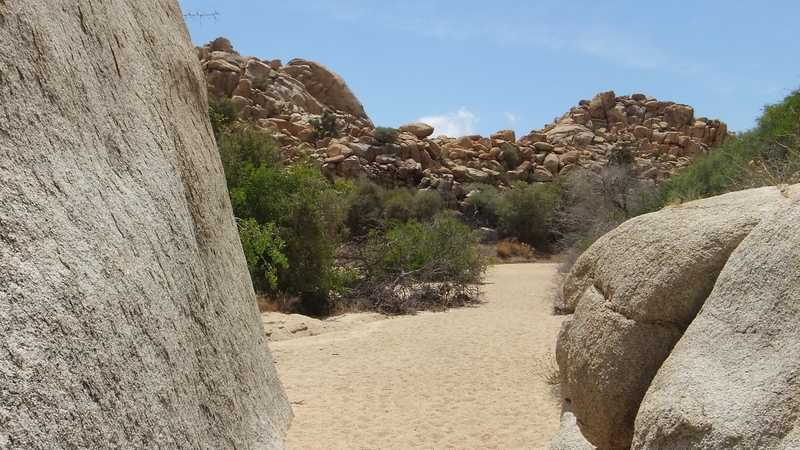 Yet, inspection reveals the sandy wash still contains its hundreds of prior footsteps guiding you; the way curls around behind the boulder, and the path goes on its merry way, snaking down a sometimes rock-strewn path. 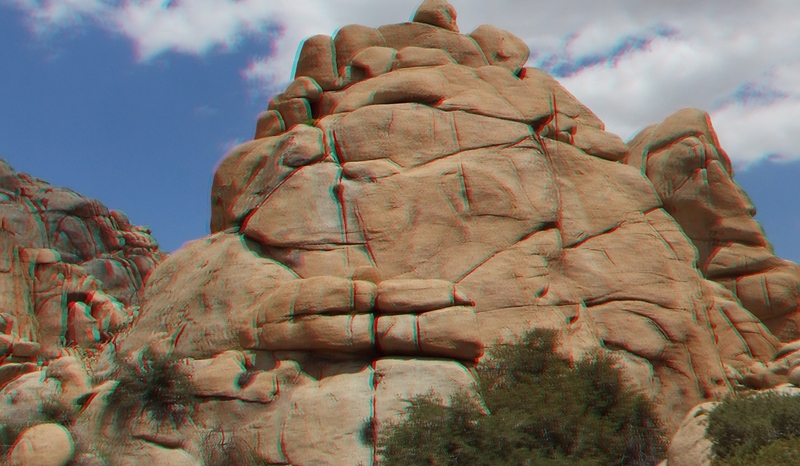 It is here in the narrow confines that I found many memorable 3D photo opportunities presenting themselves (as if they haven’t already up to this point). 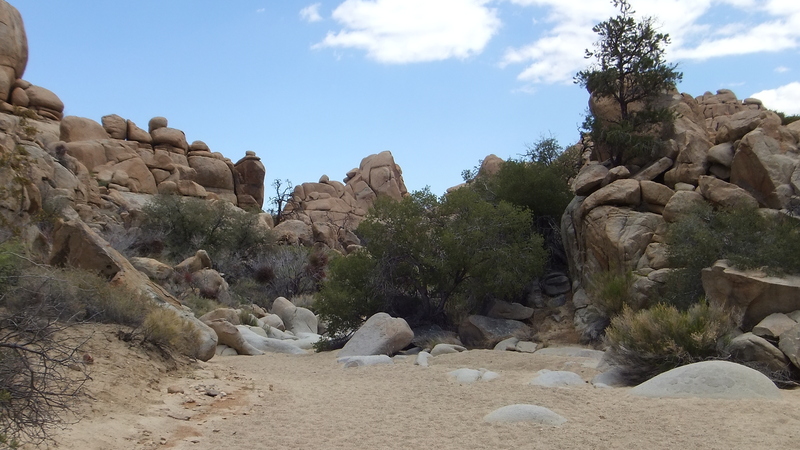 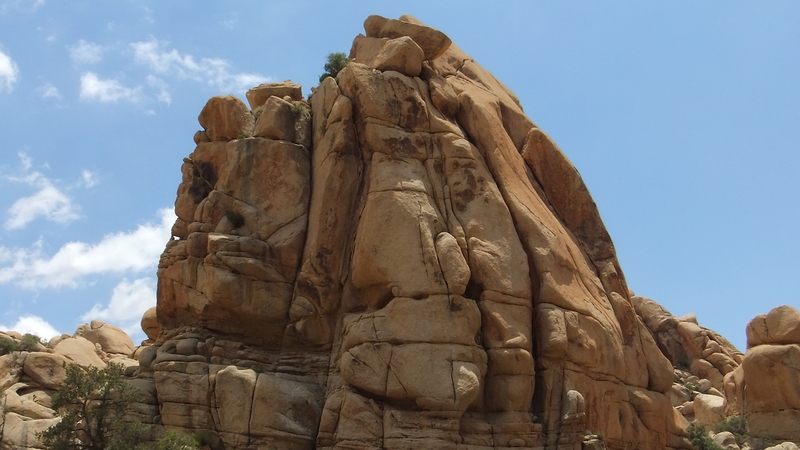 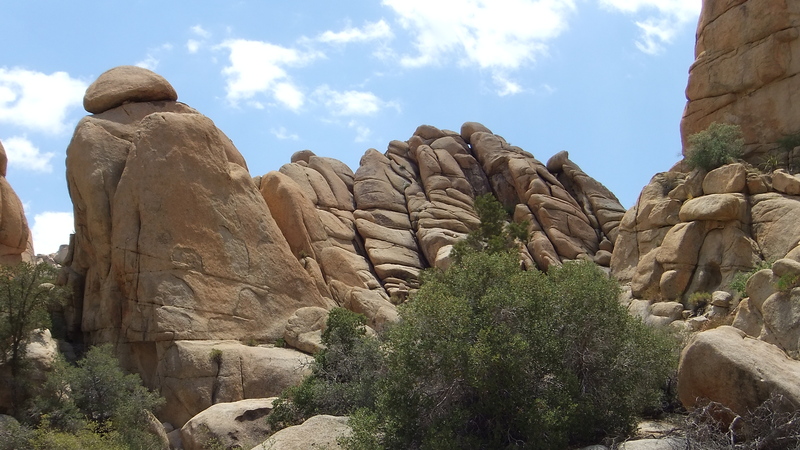 The hike meanders through the tight canyon with trees and brush dotting either side, and incredible rock formations looming high overhead 30, 50, sometimes 100 feet or higher. 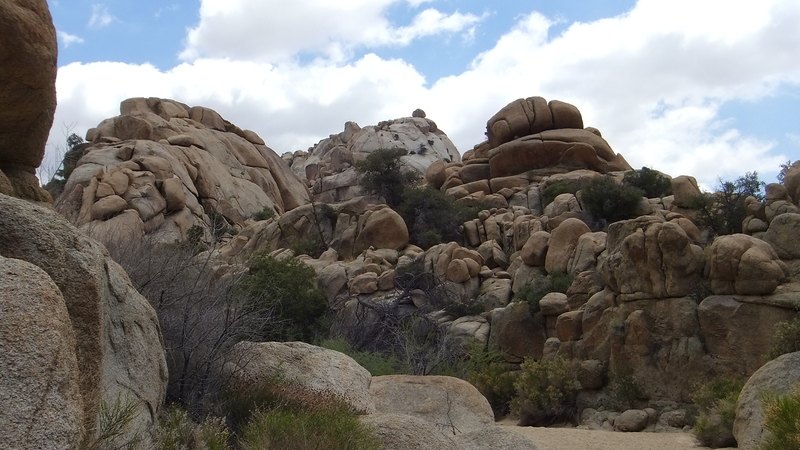 You will get glimpses of the Grey Giant and Lazy Dome, but only for a few moments before the canyon trail compresses once again. 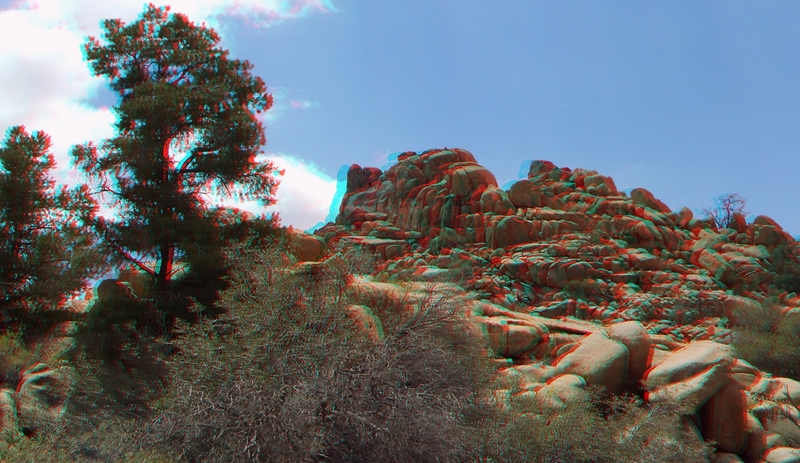 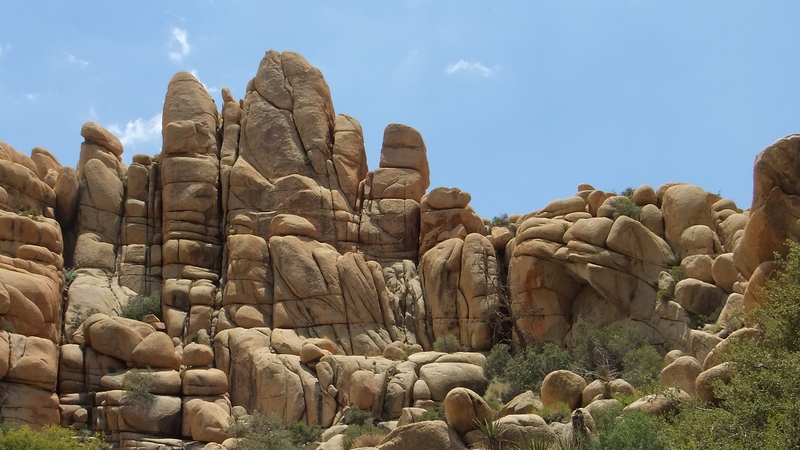 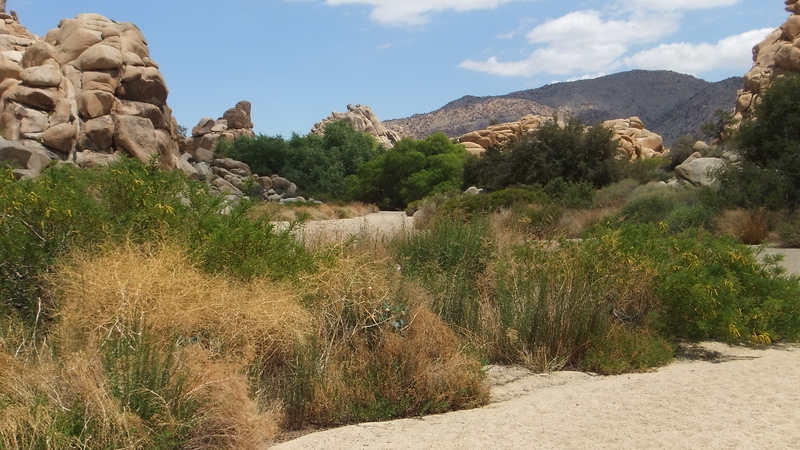 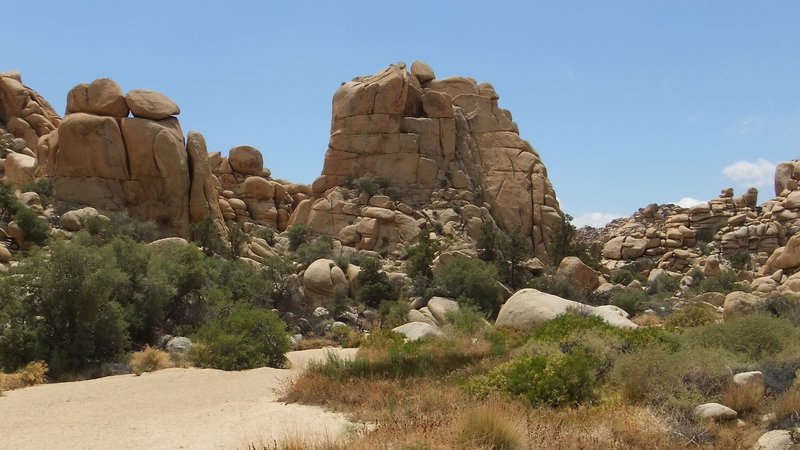 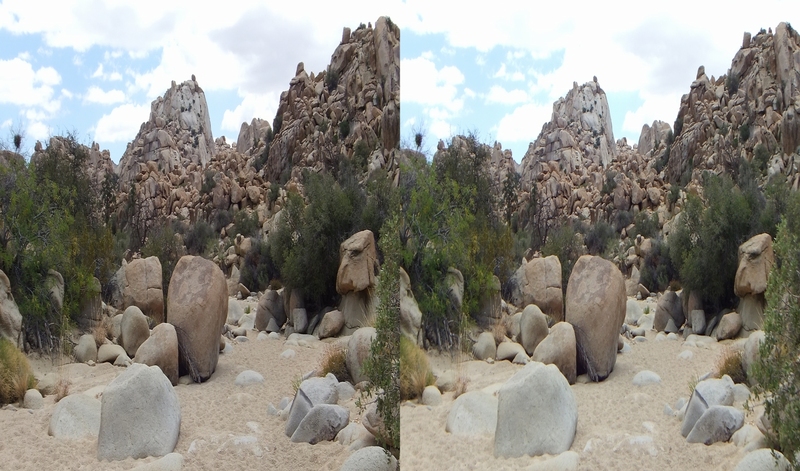 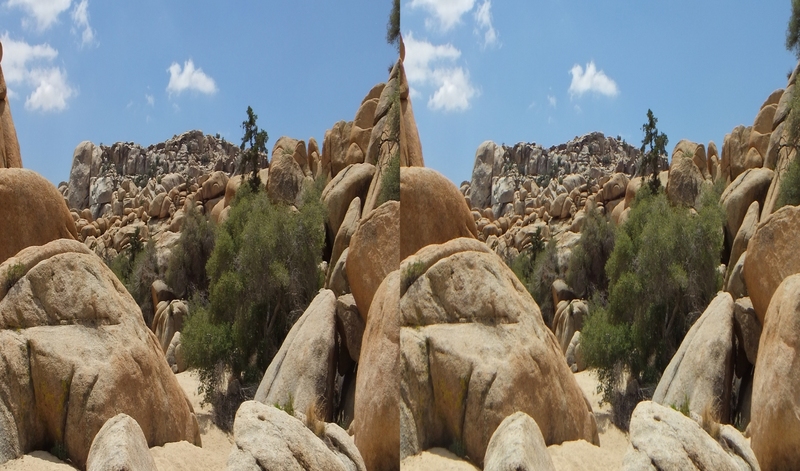 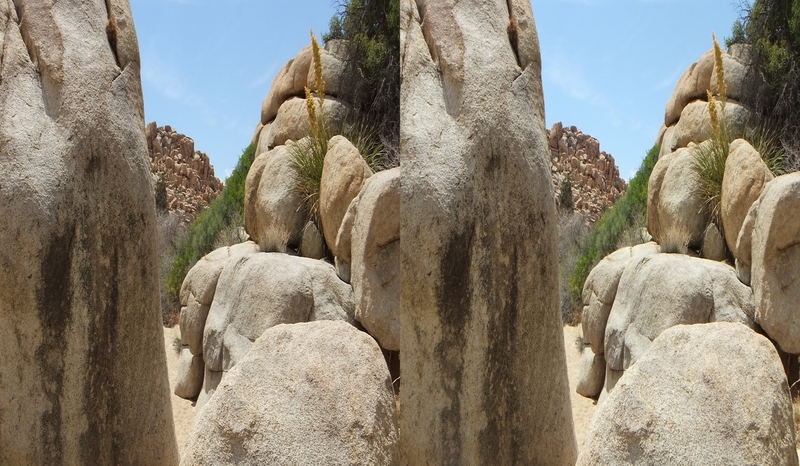 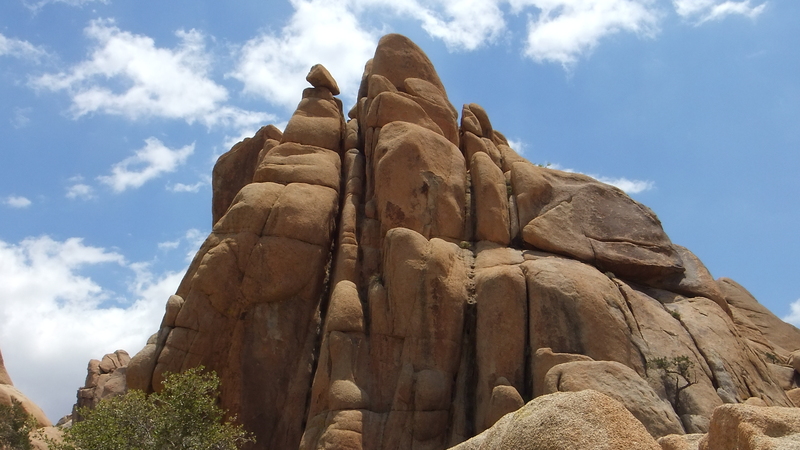 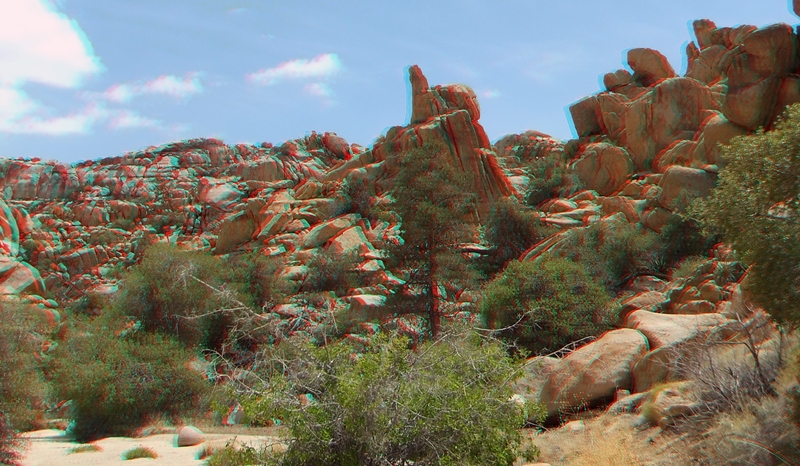 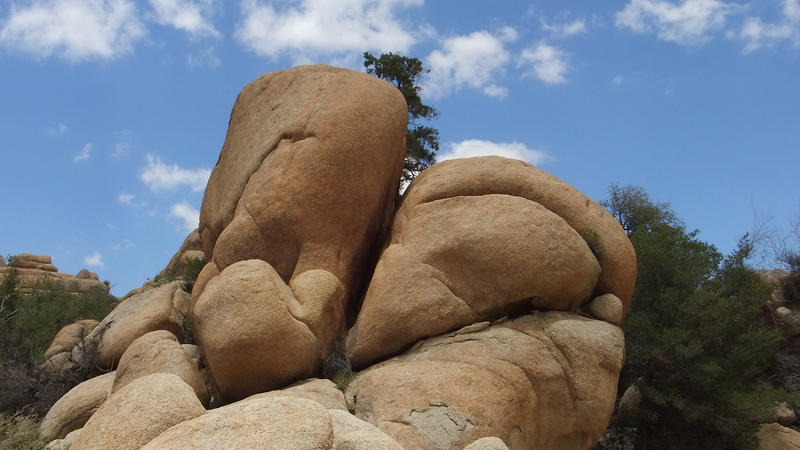 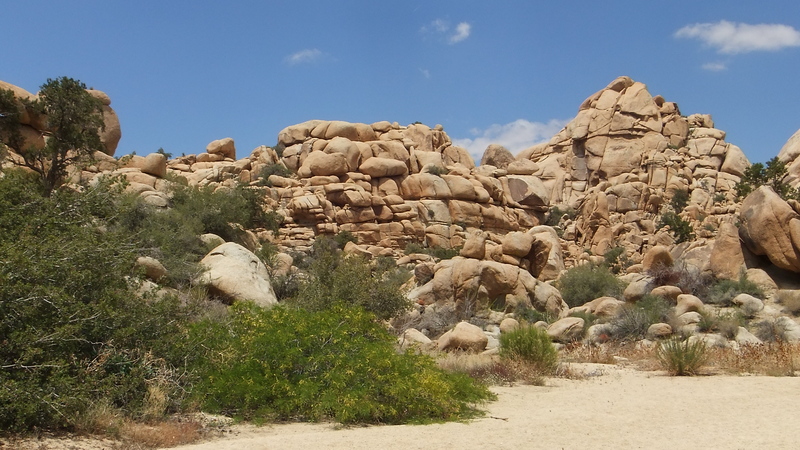 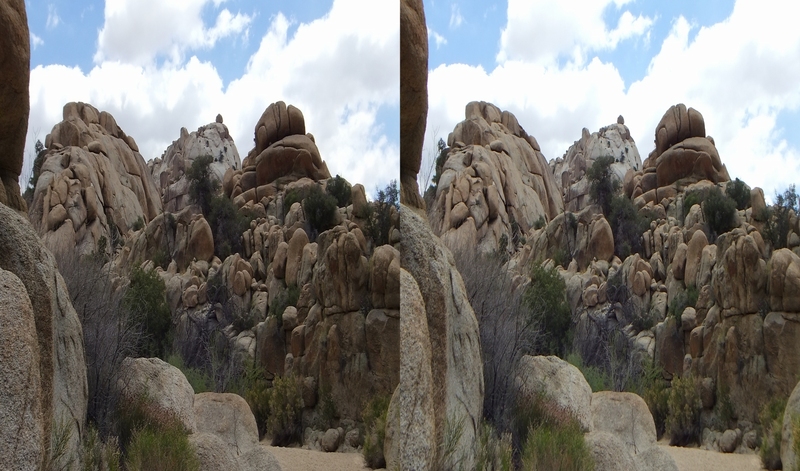 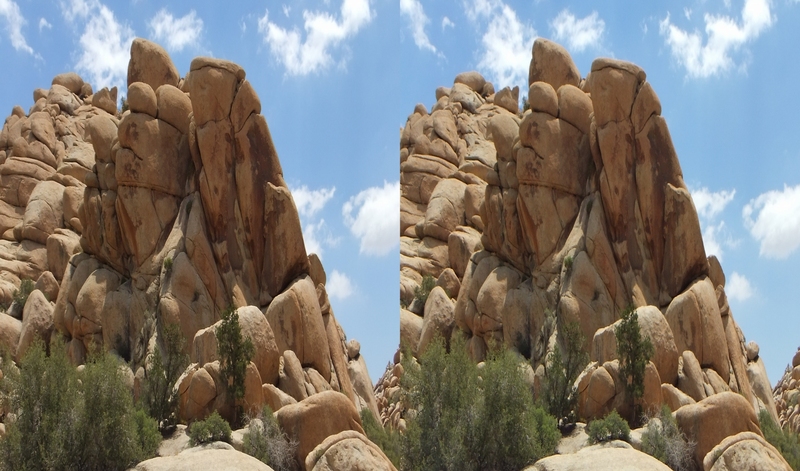 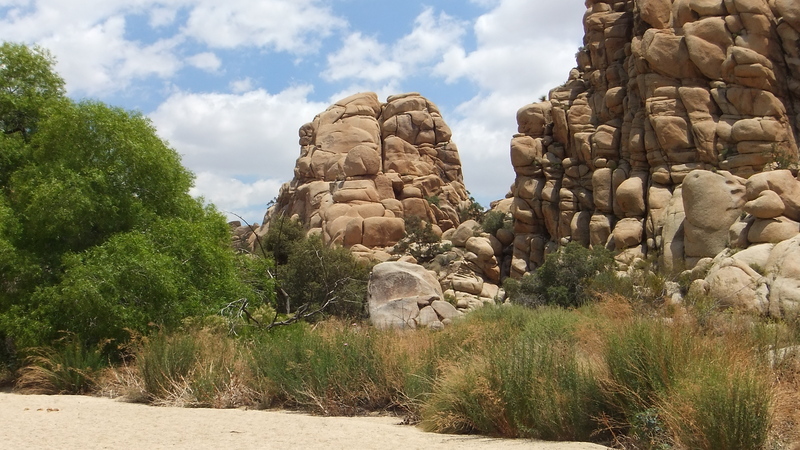 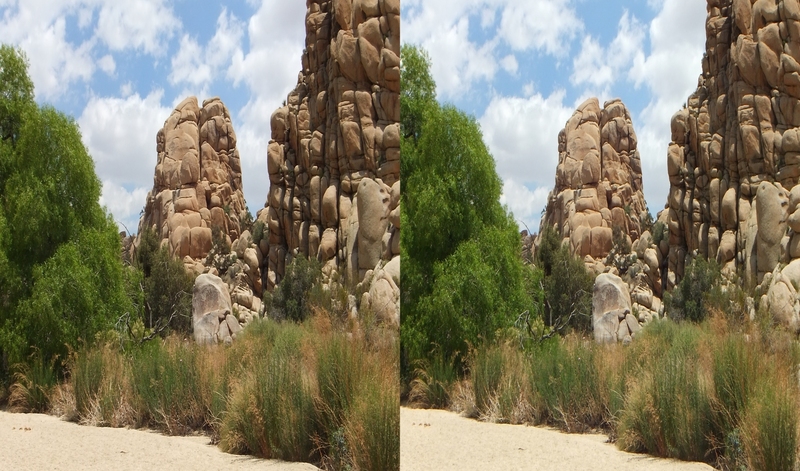 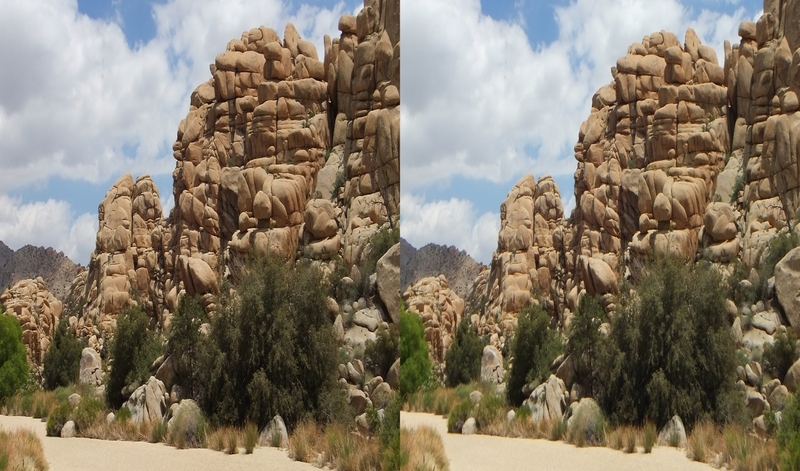 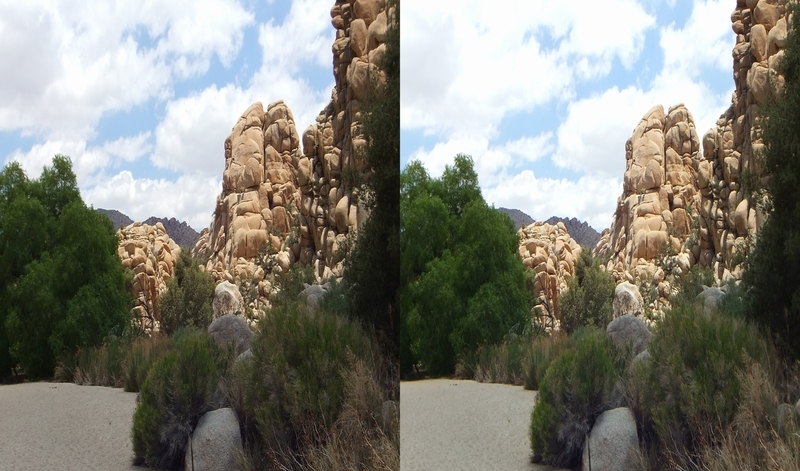 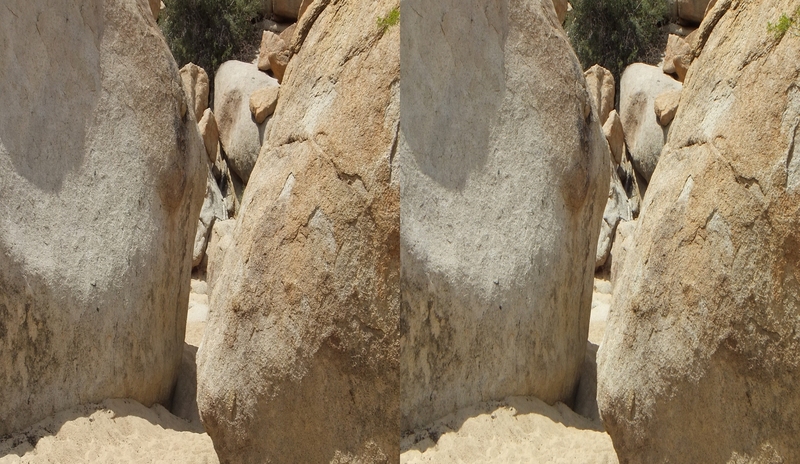 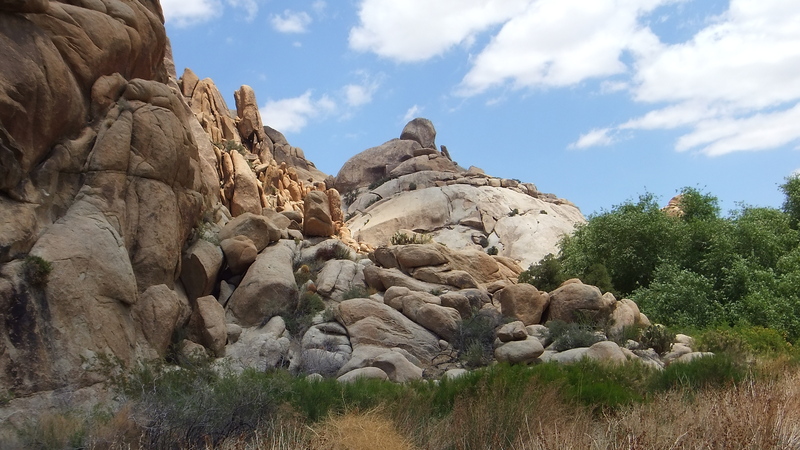 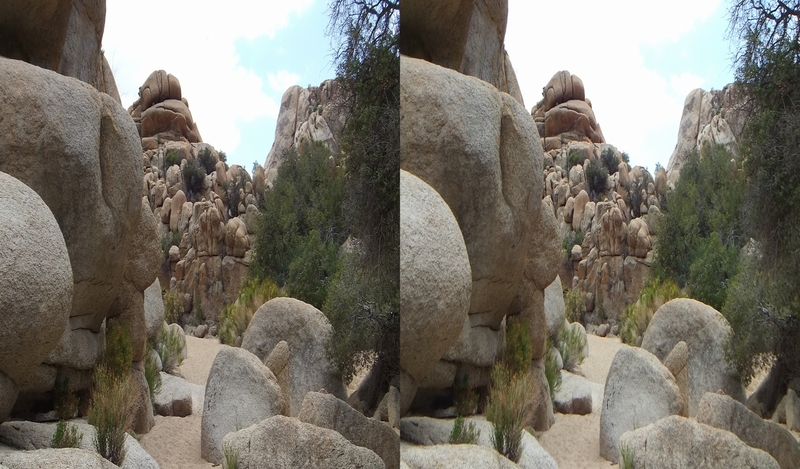 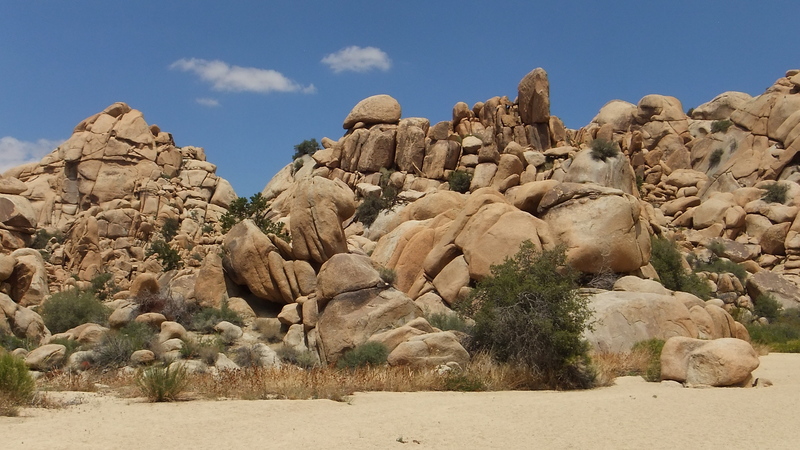 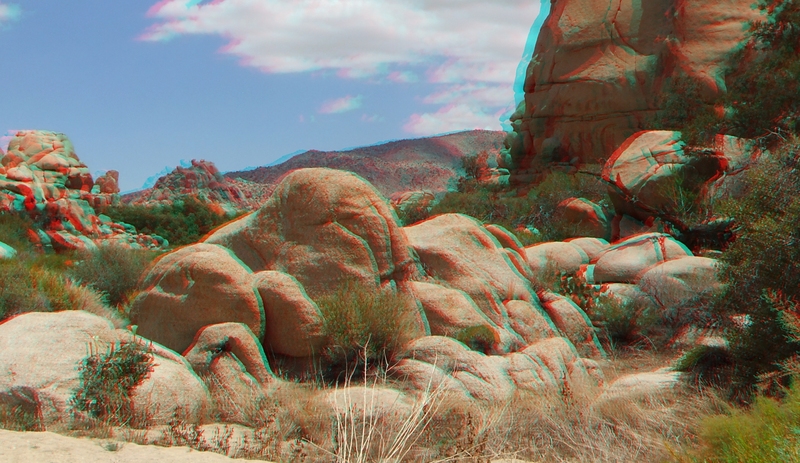 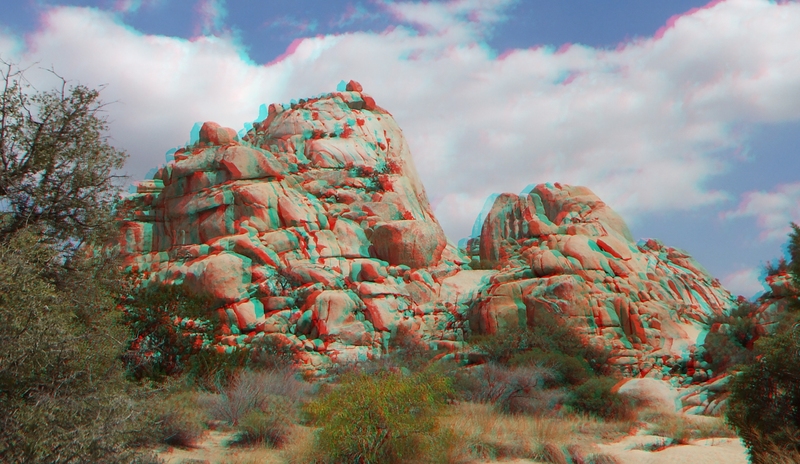 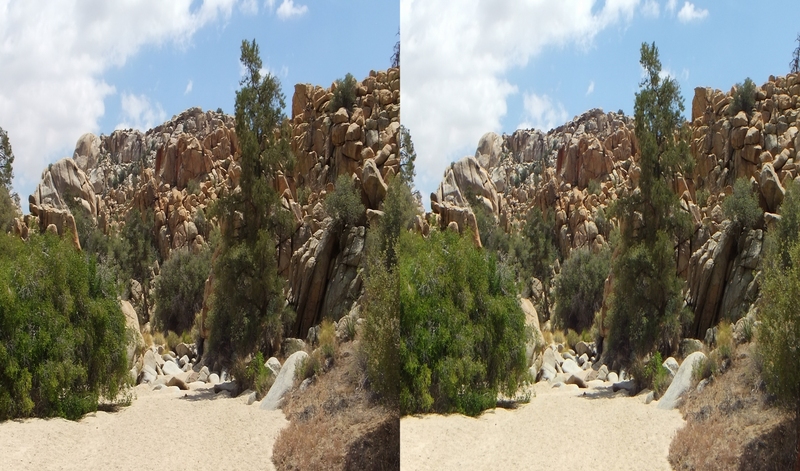 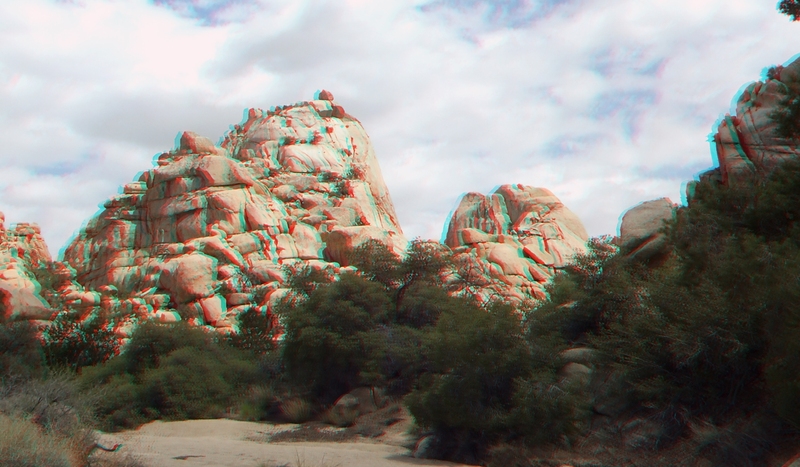 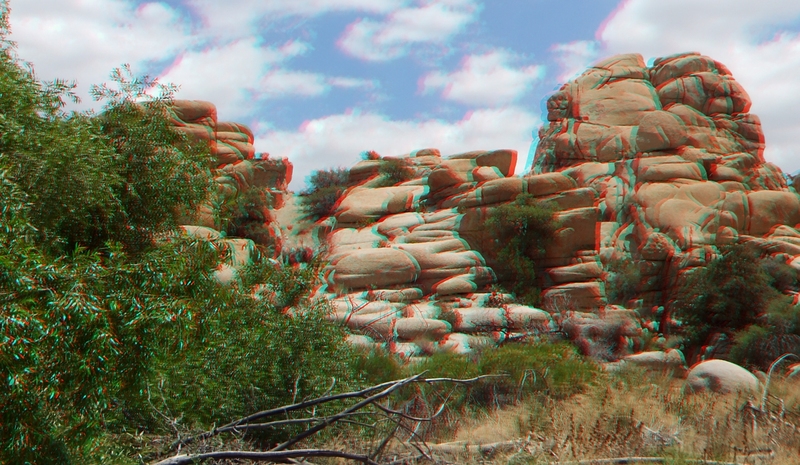 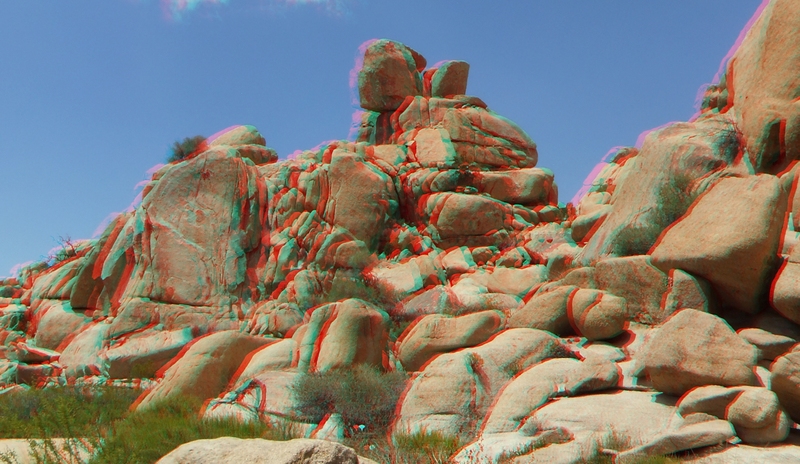 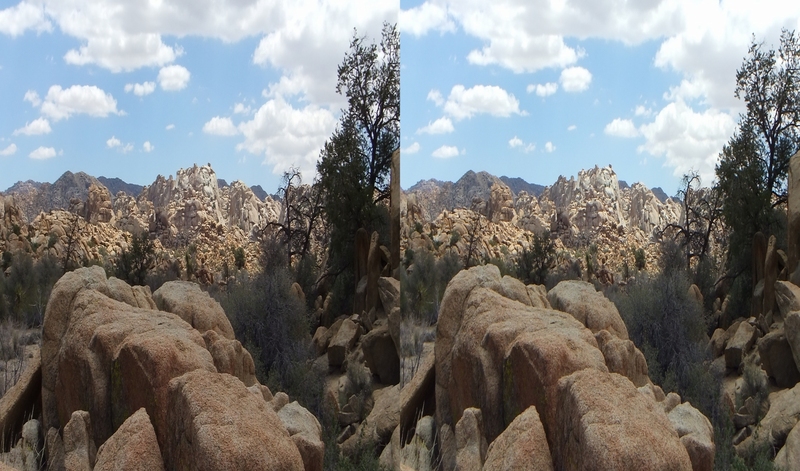 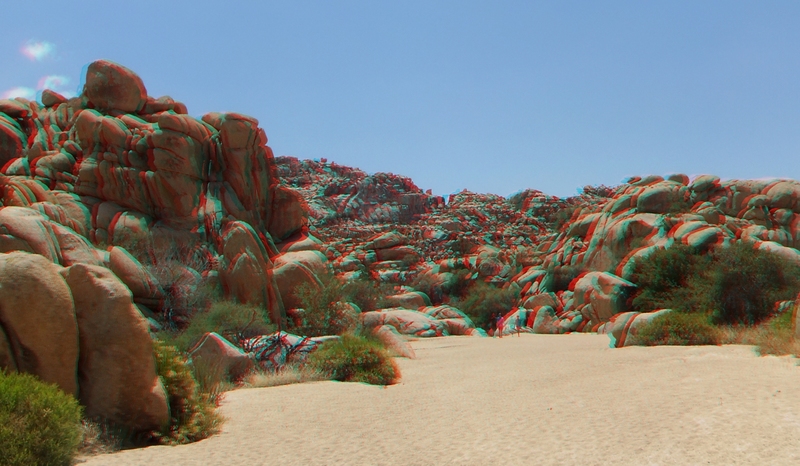 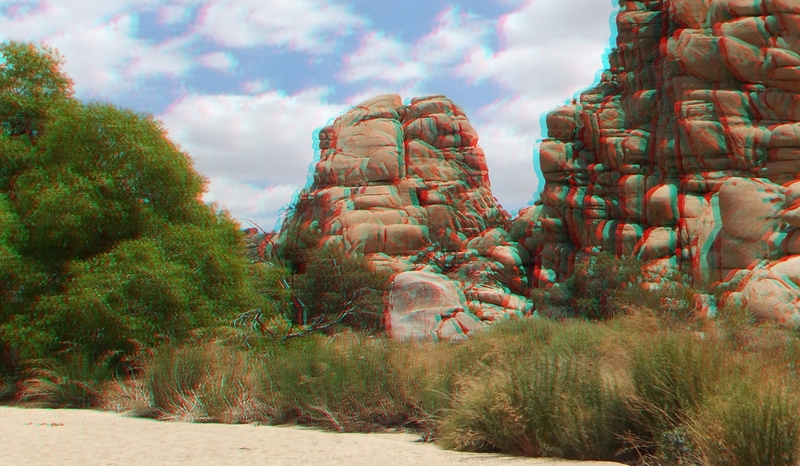 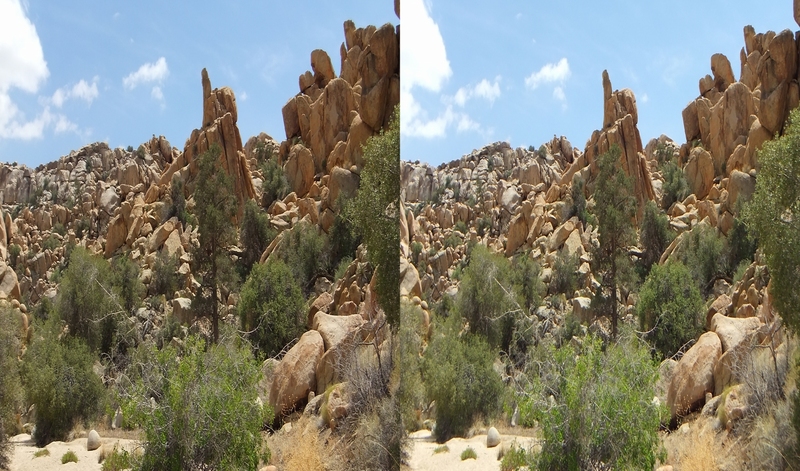 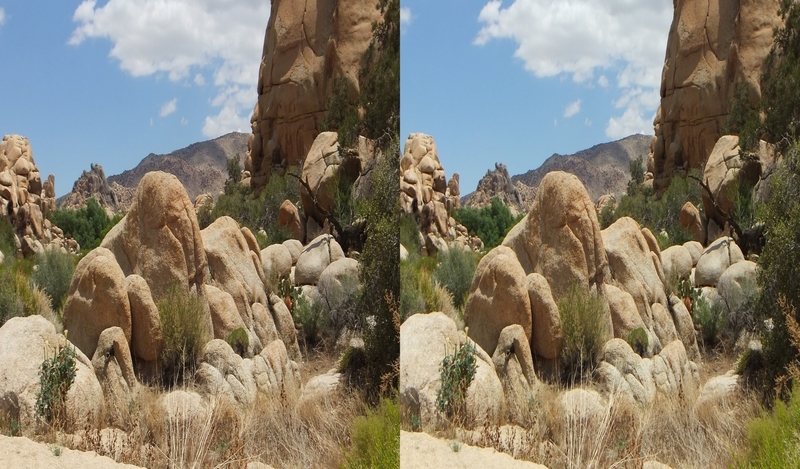 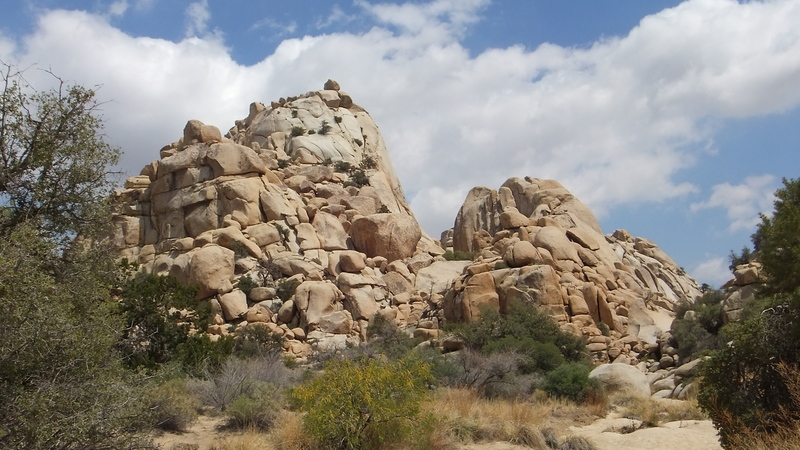 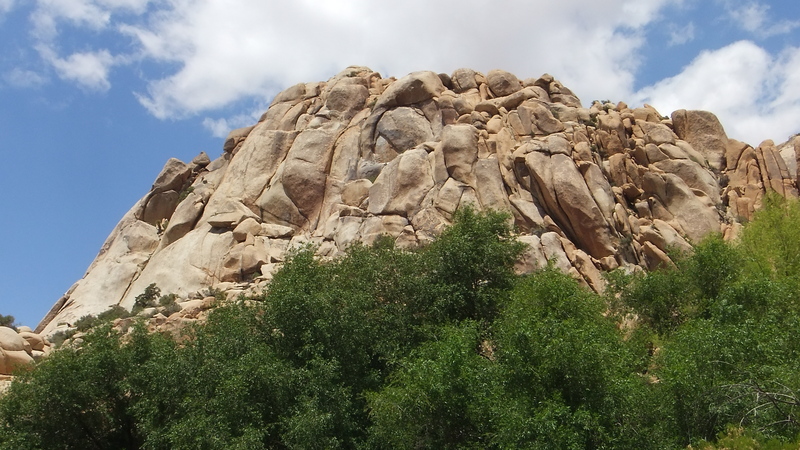 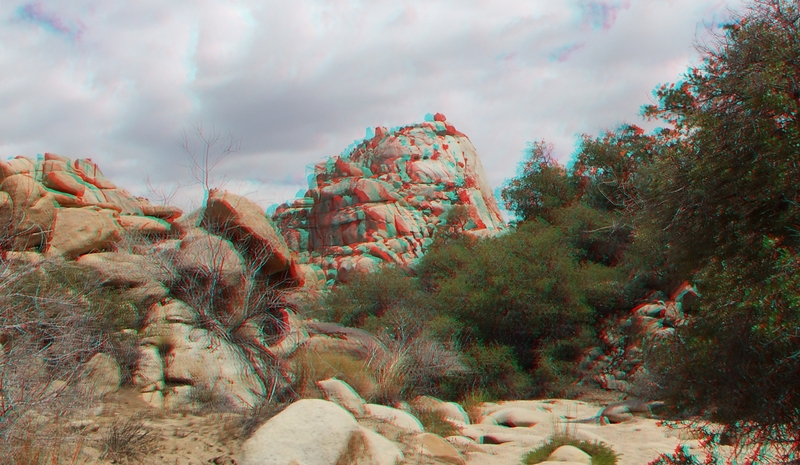 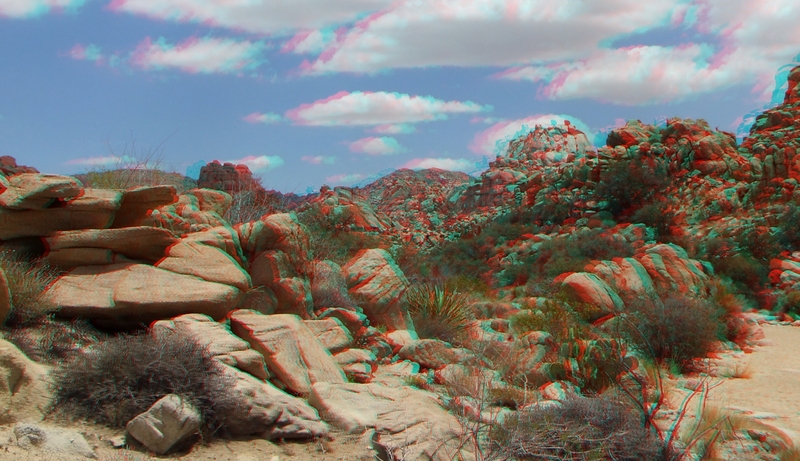 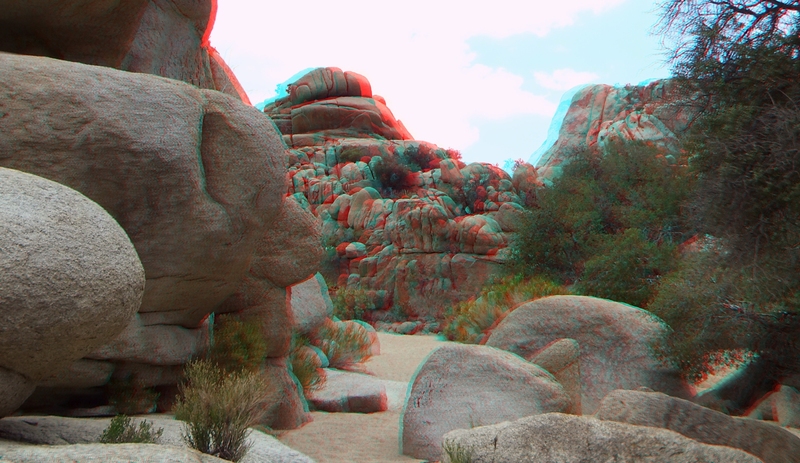 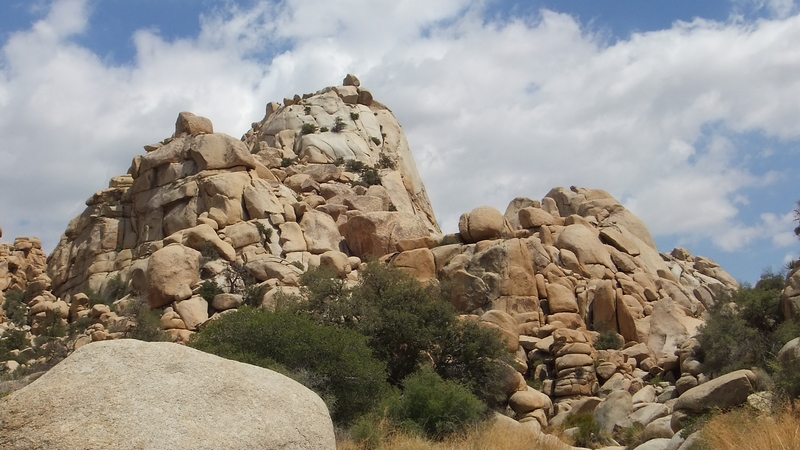 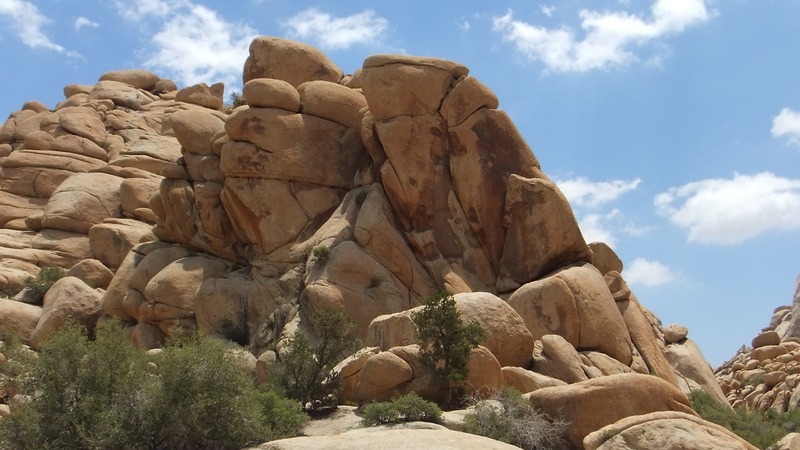 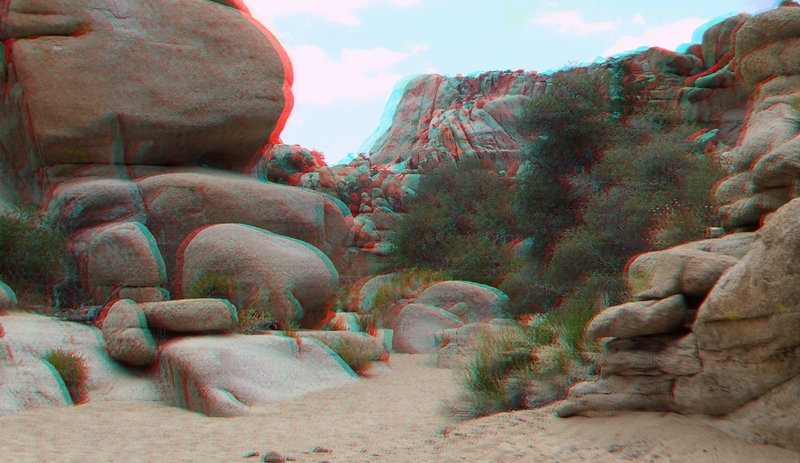 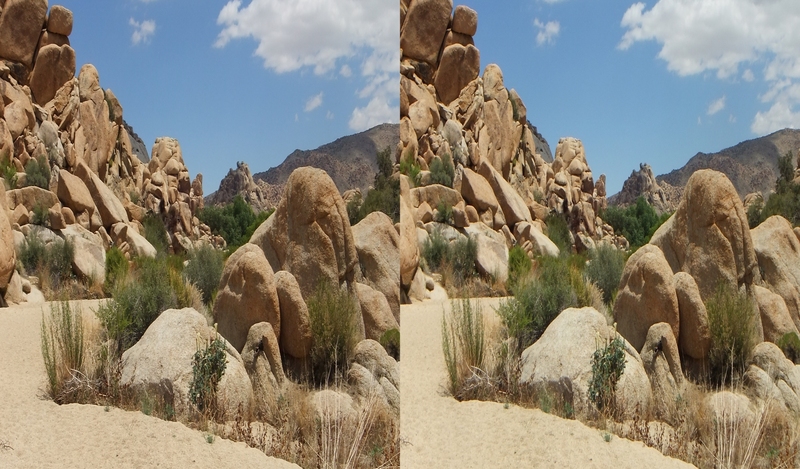 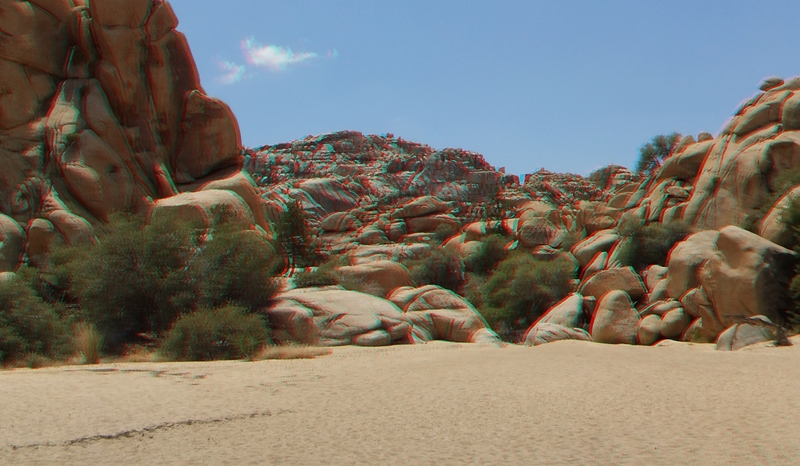 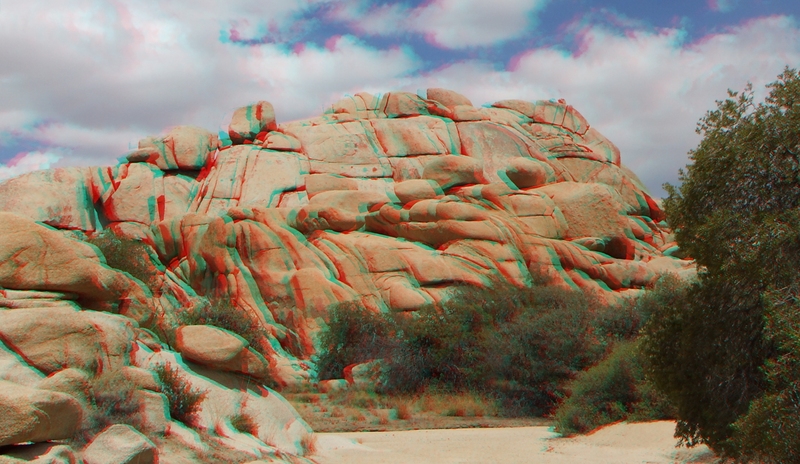 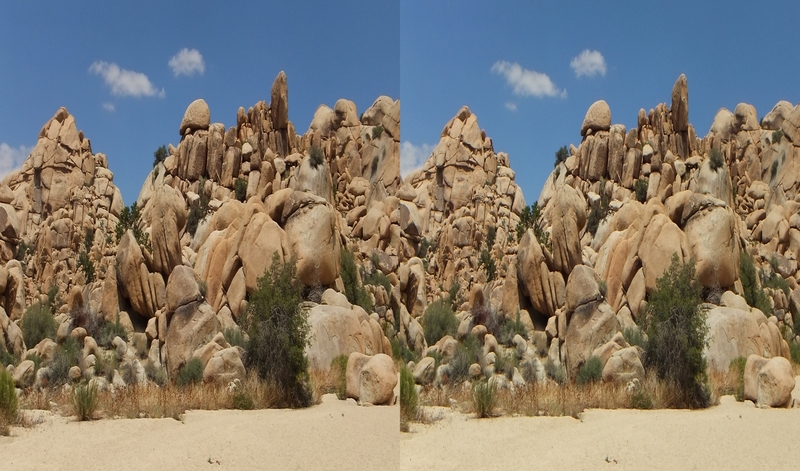 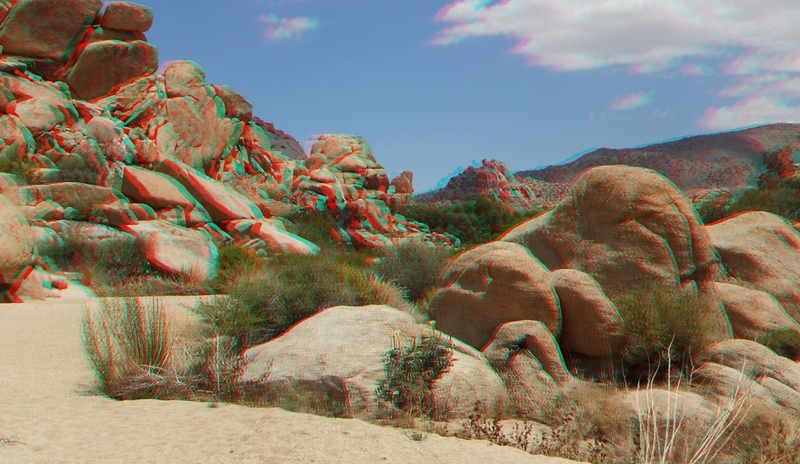 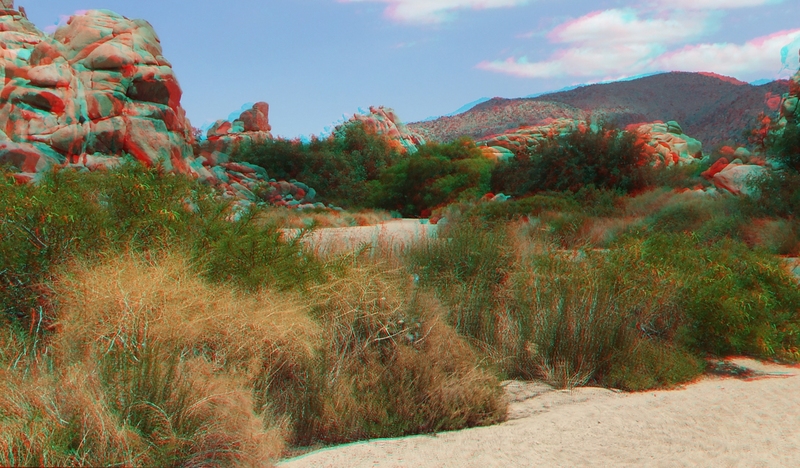 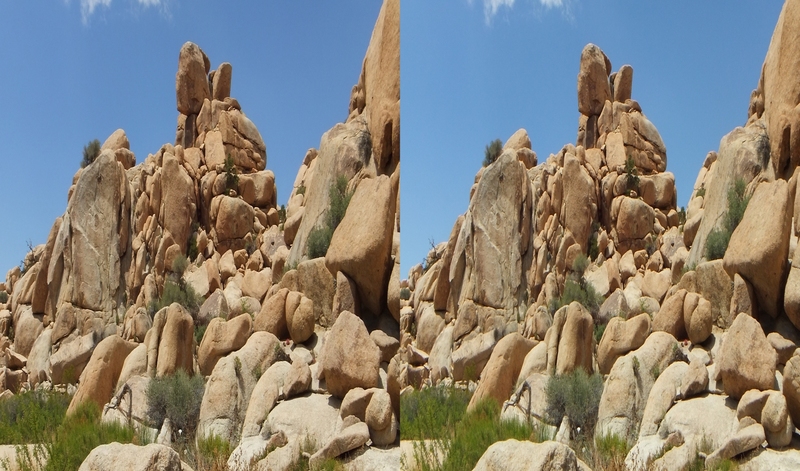 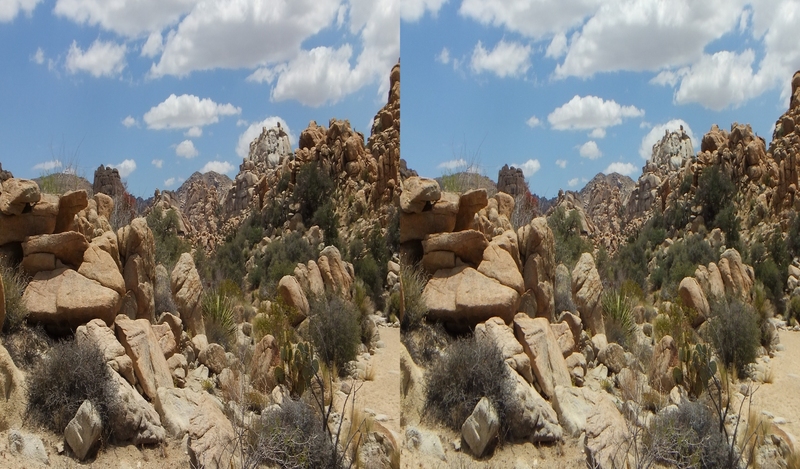 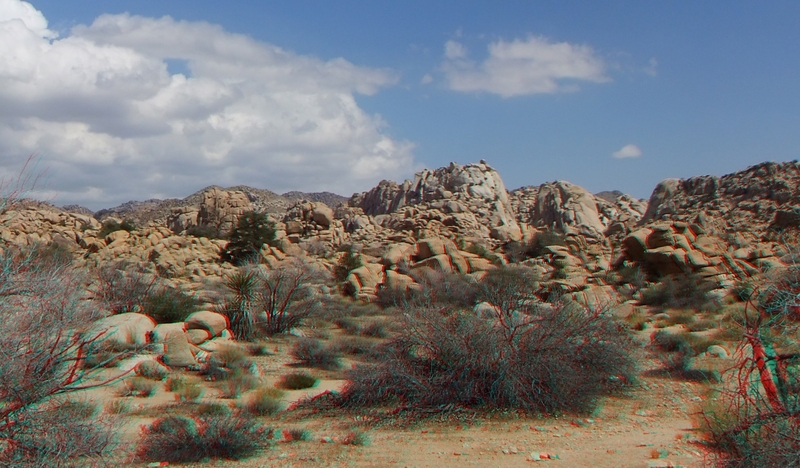 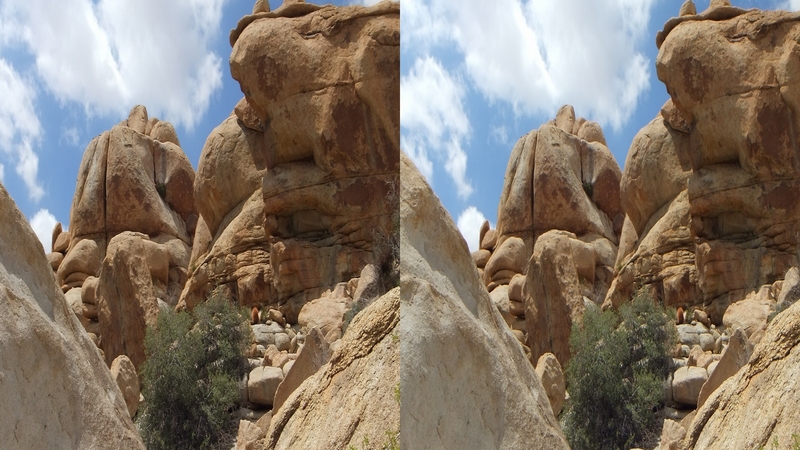 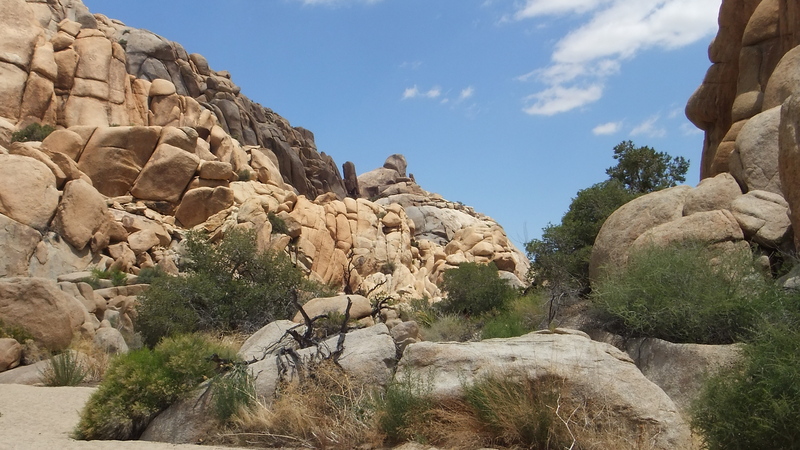 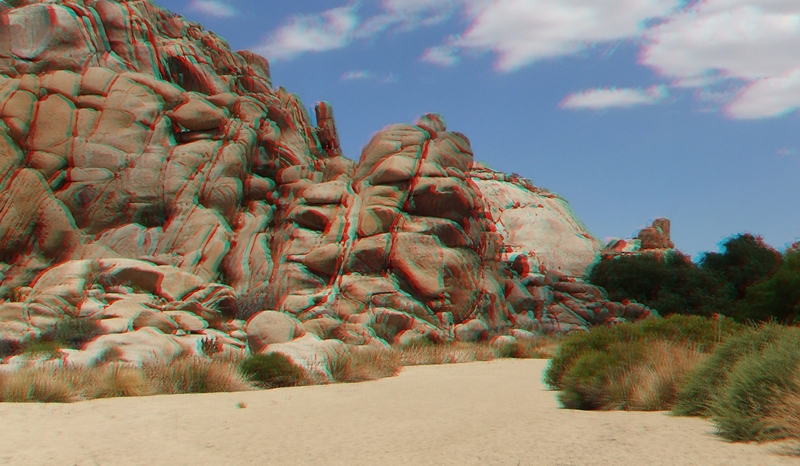 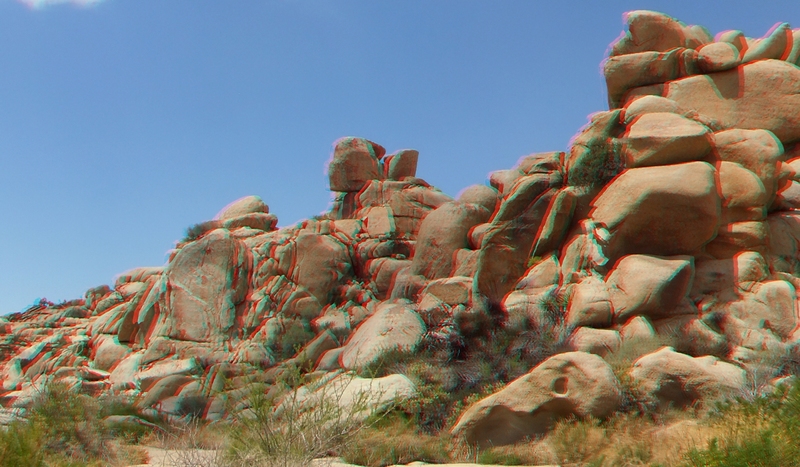 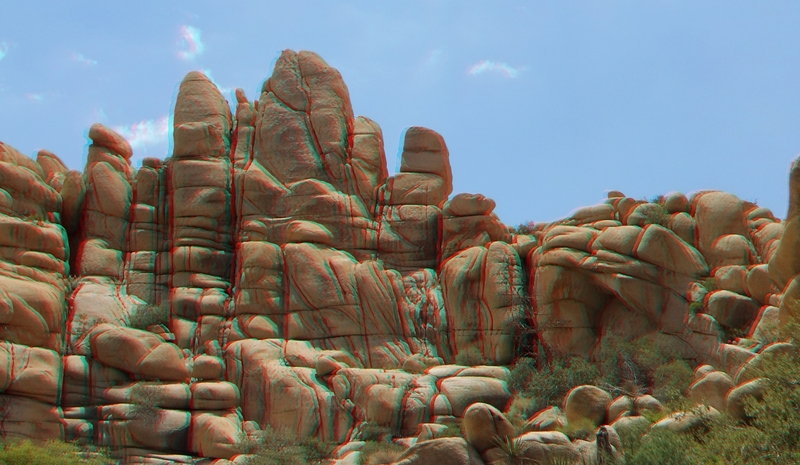 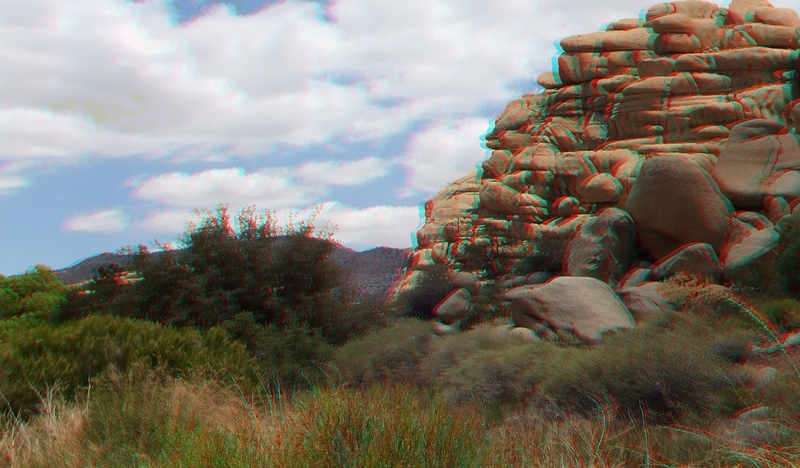 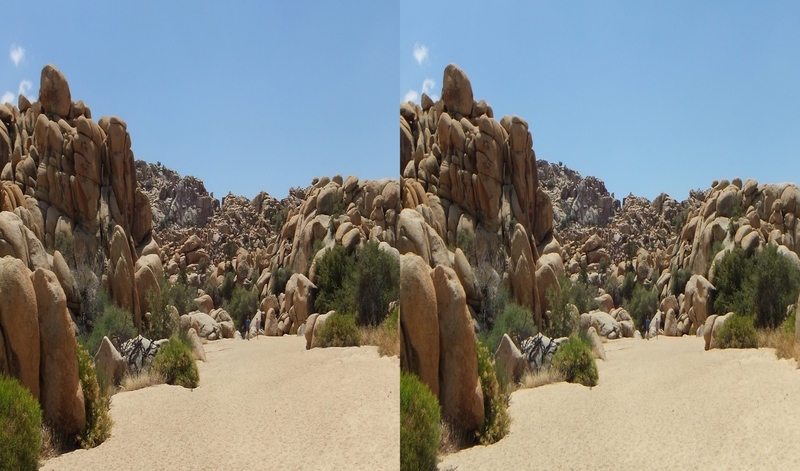 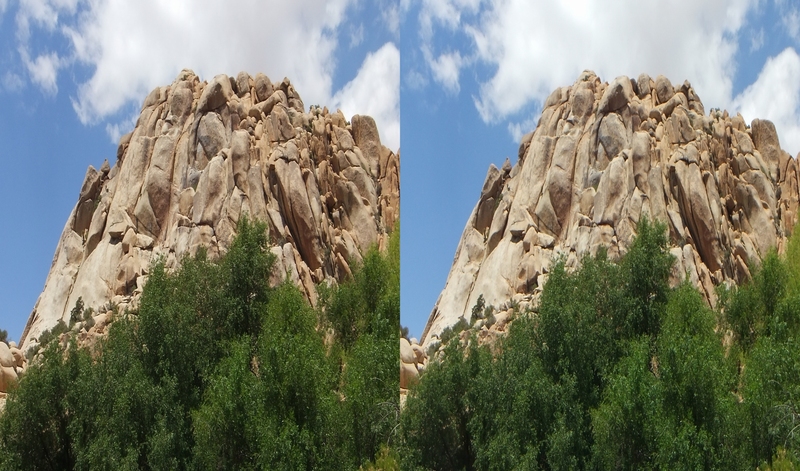 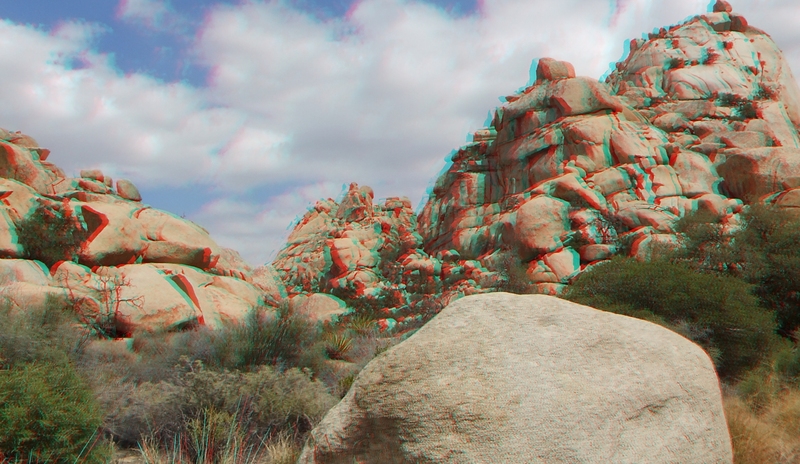 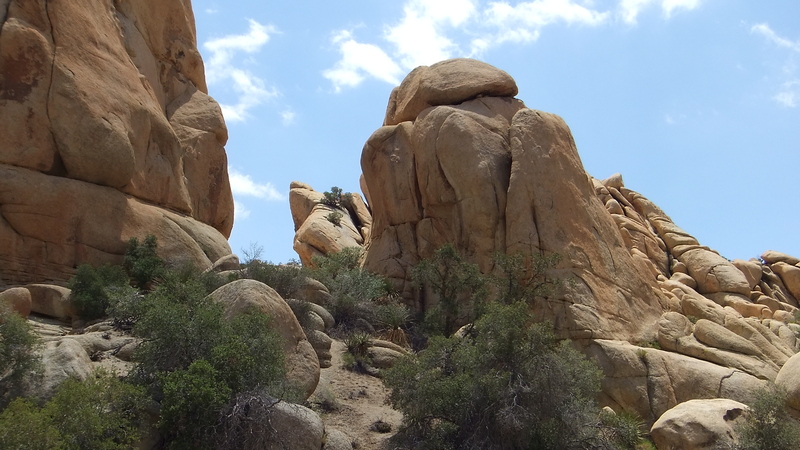 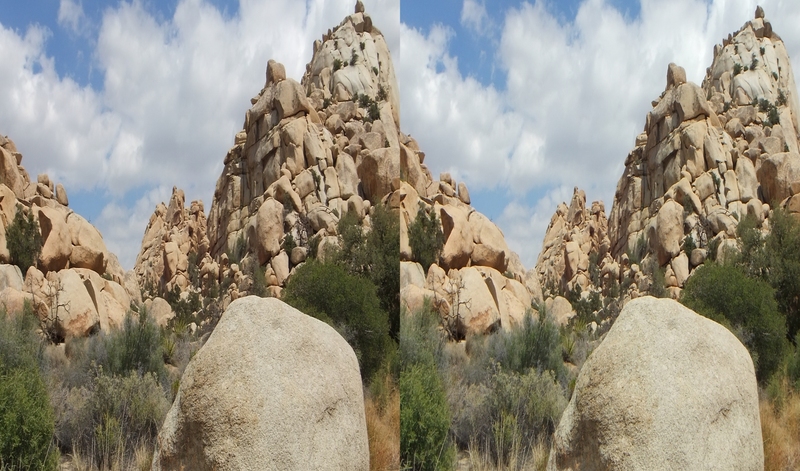 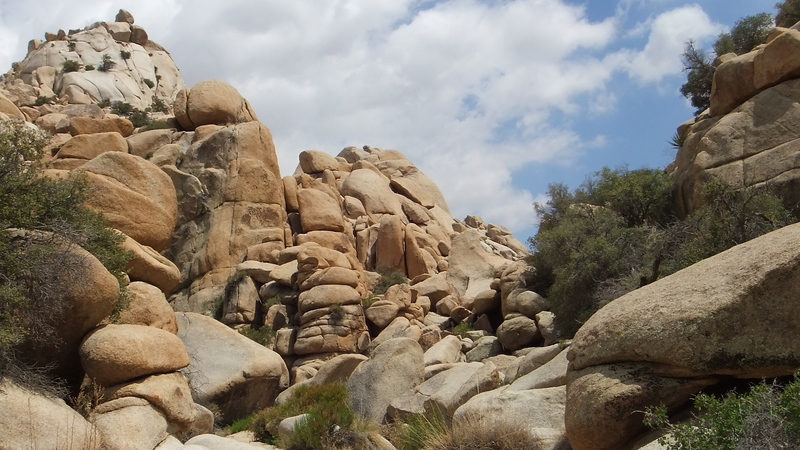 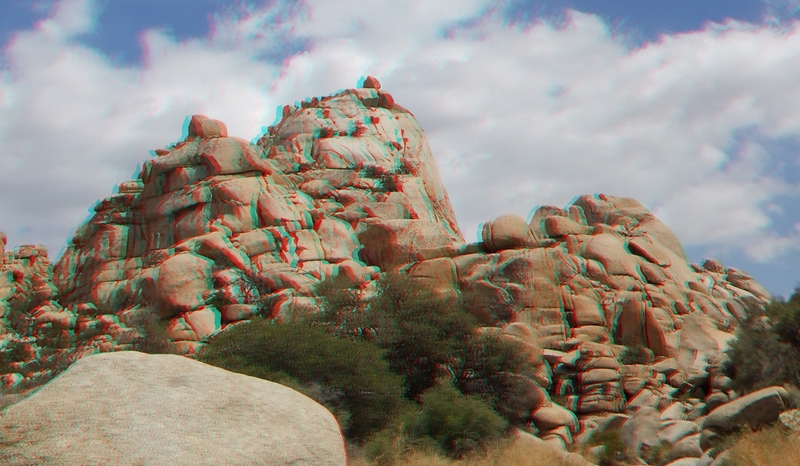 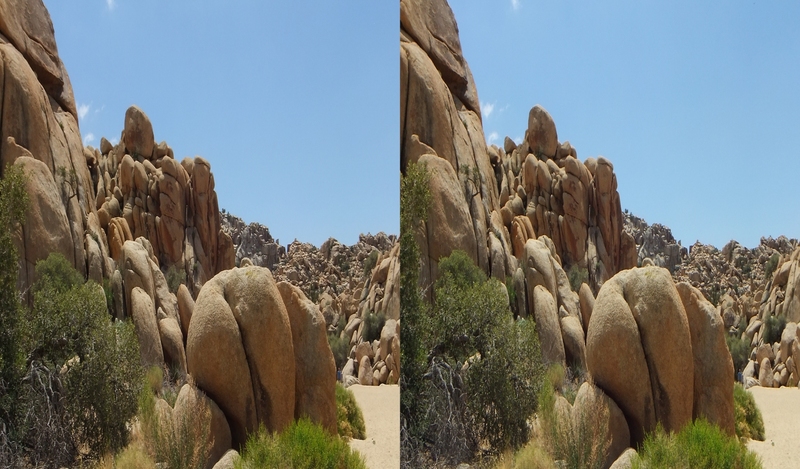 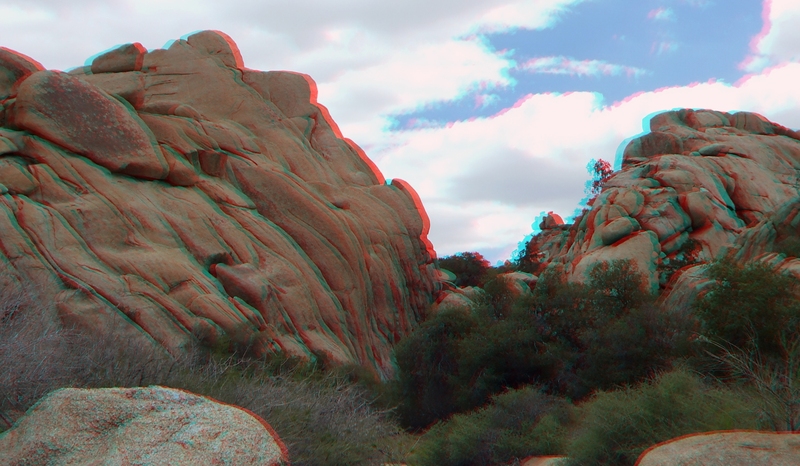 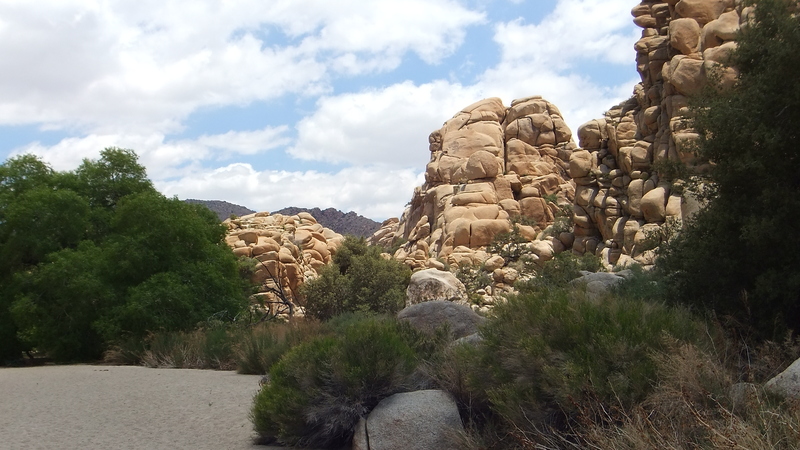 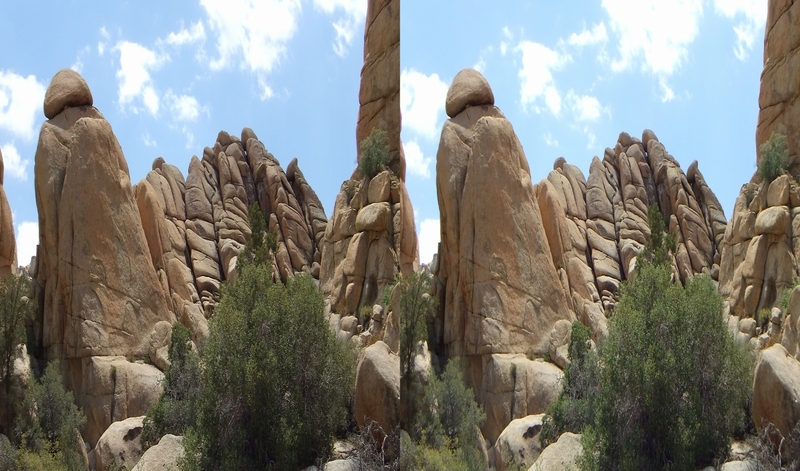 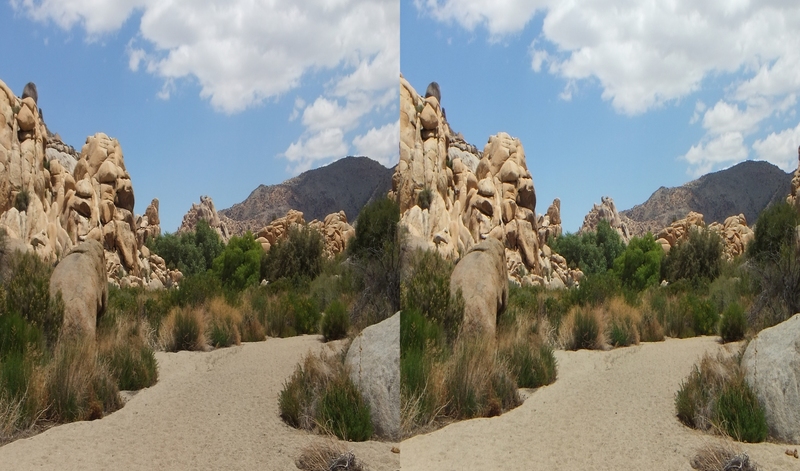 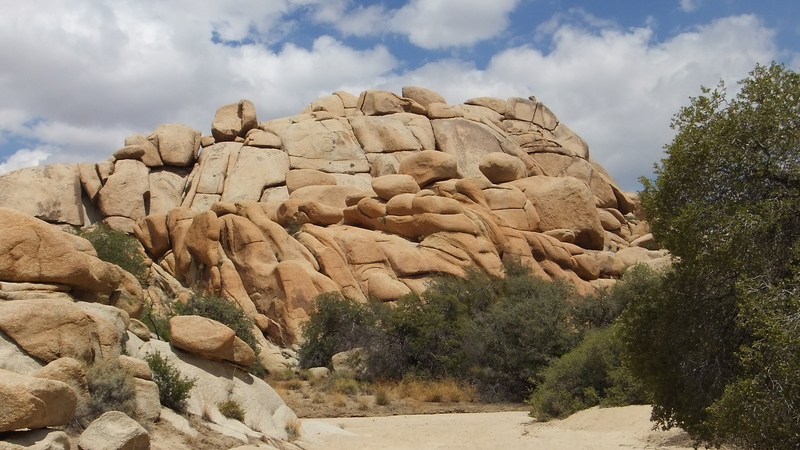 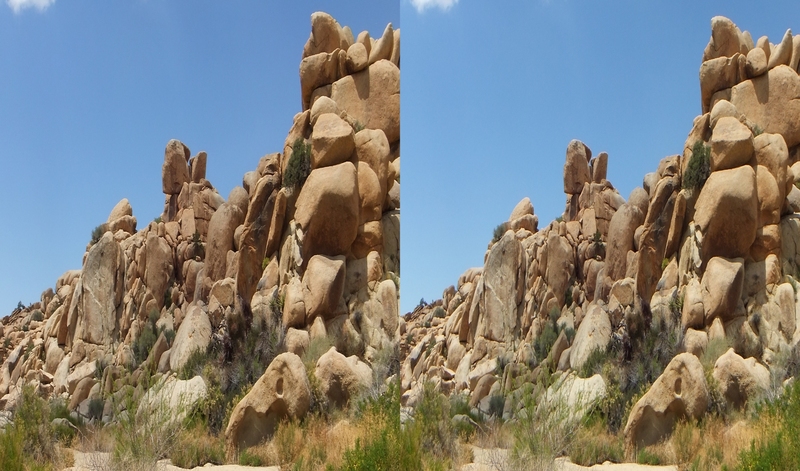 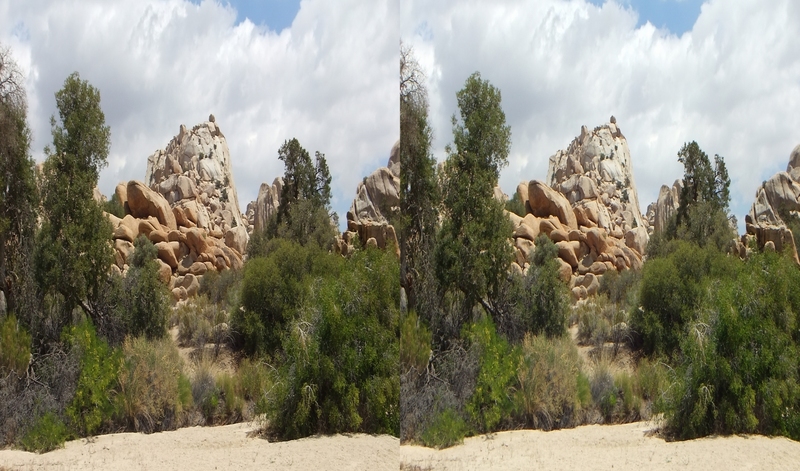 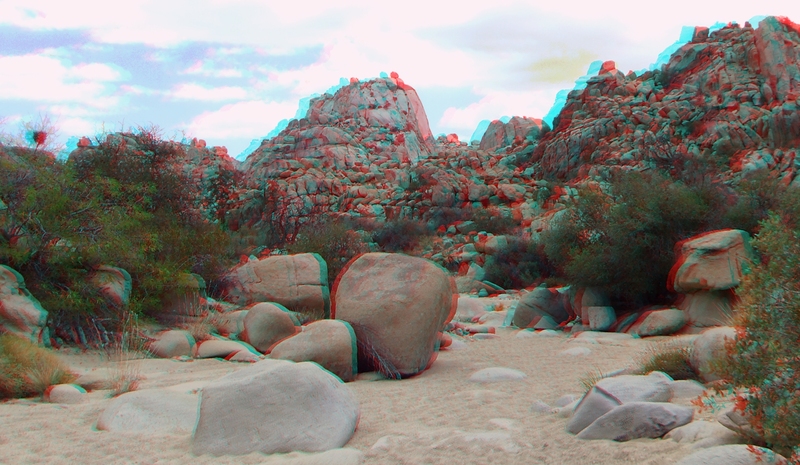 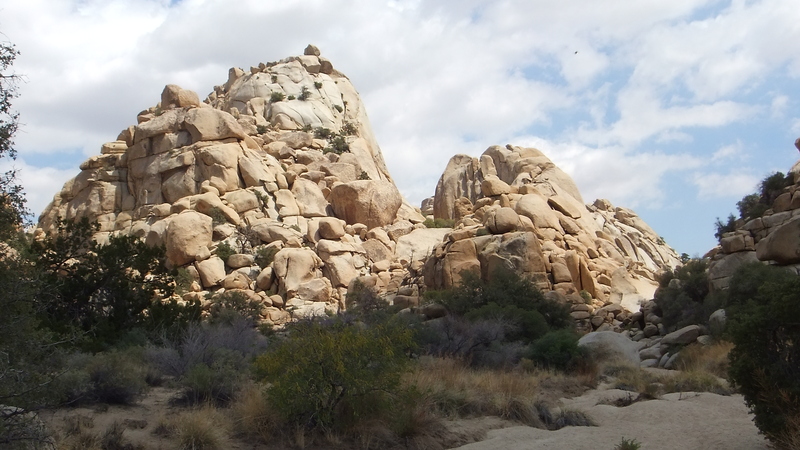 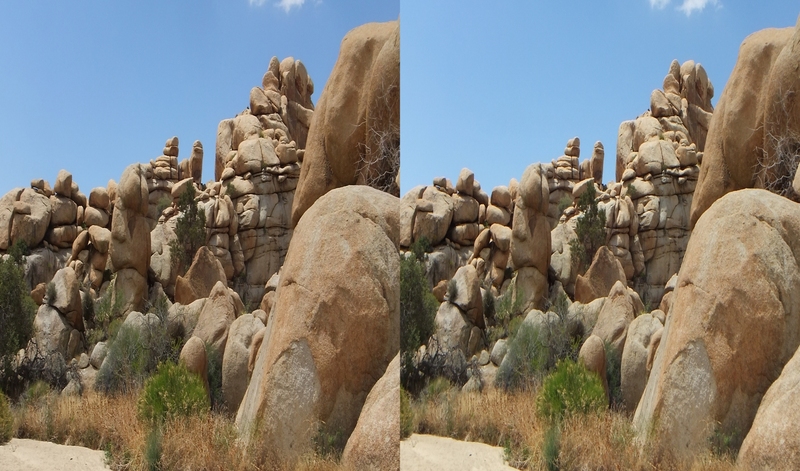 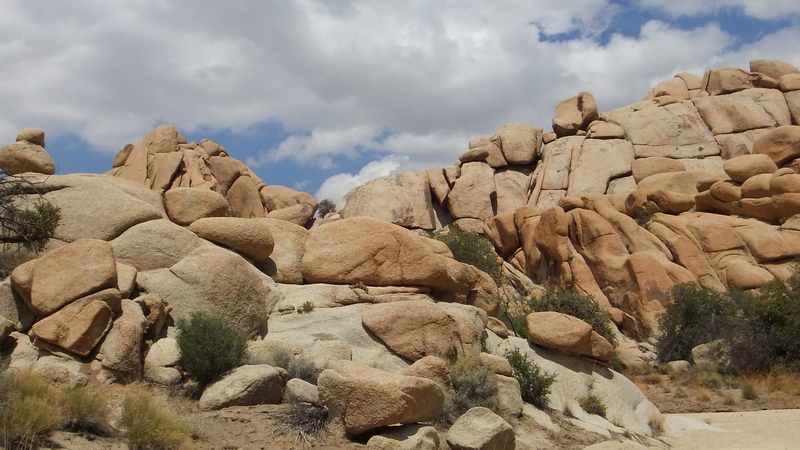 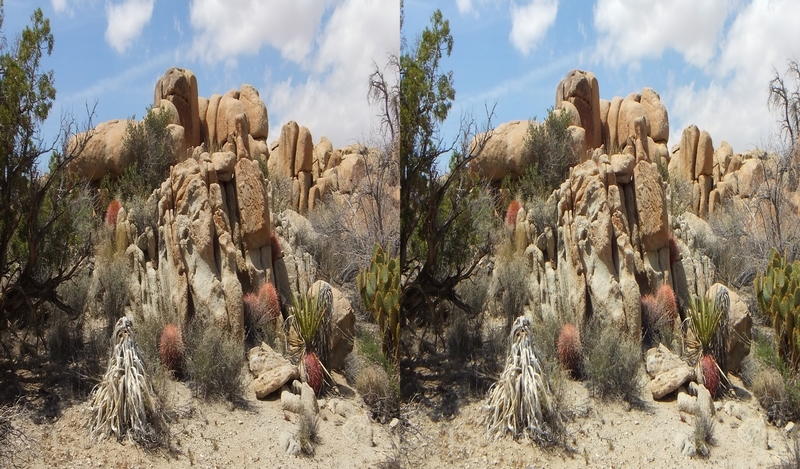 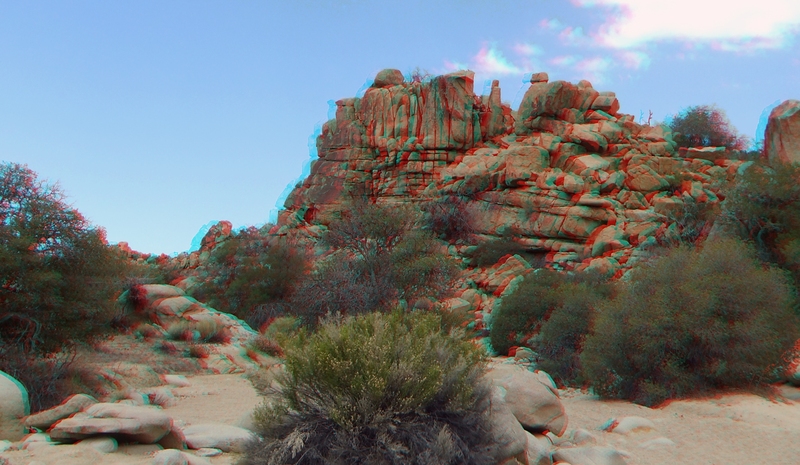 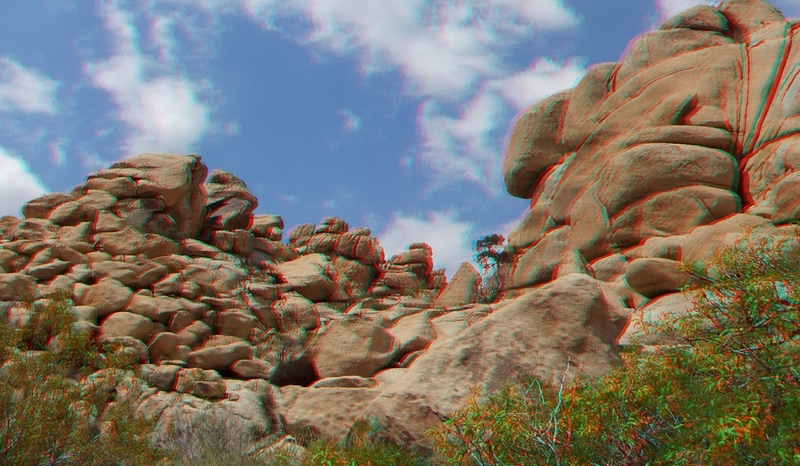 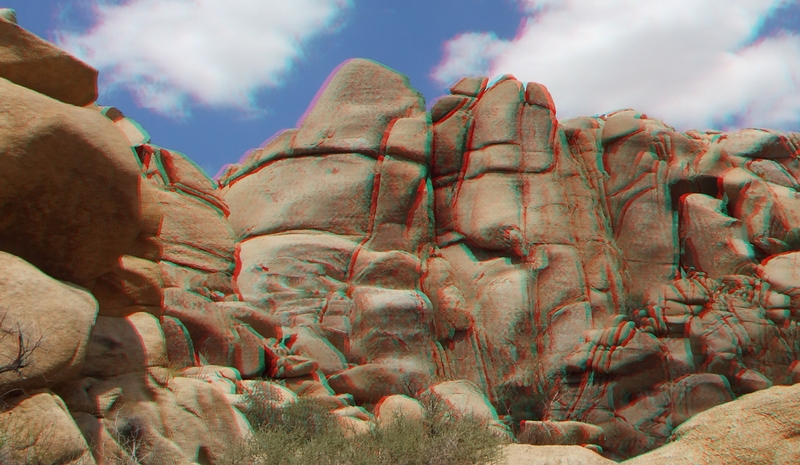 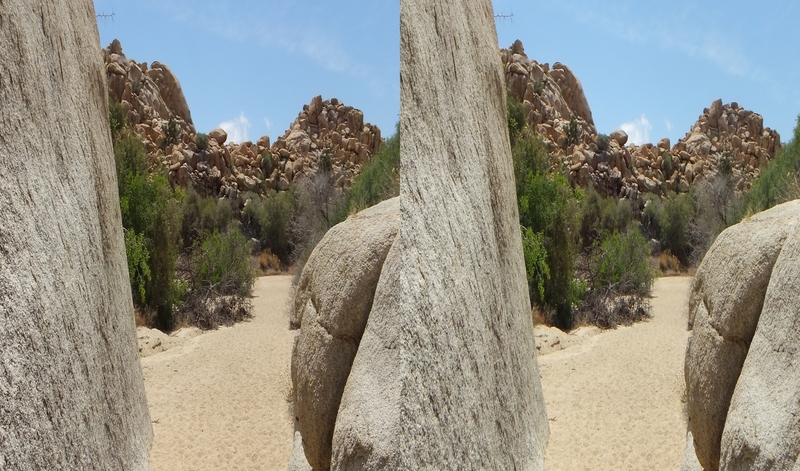 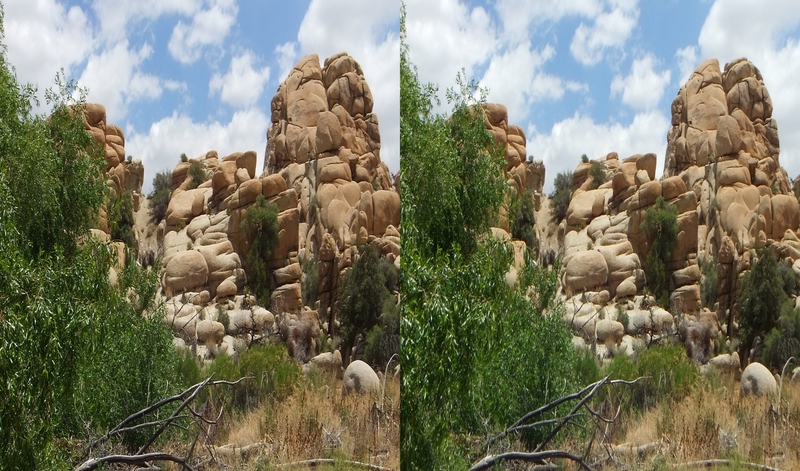 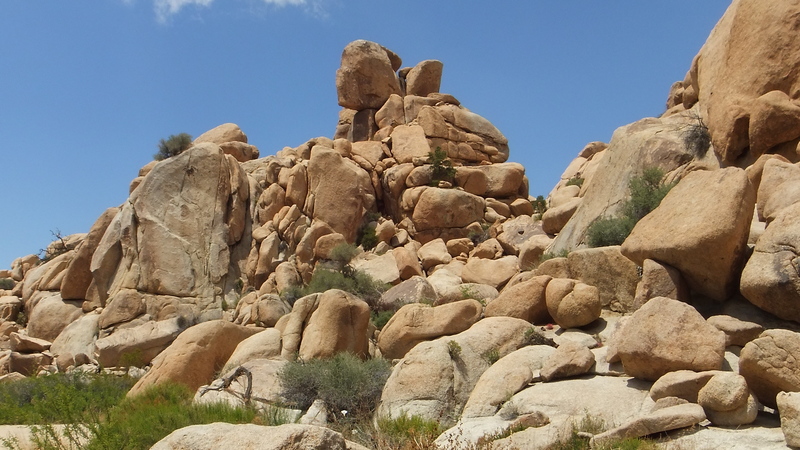 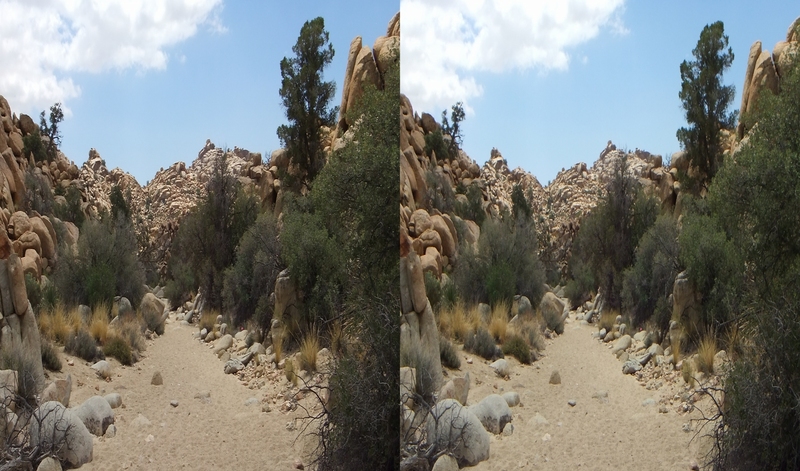 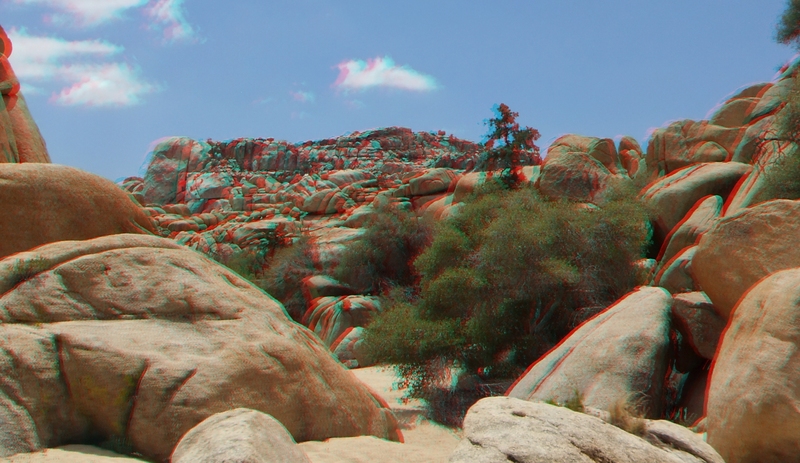 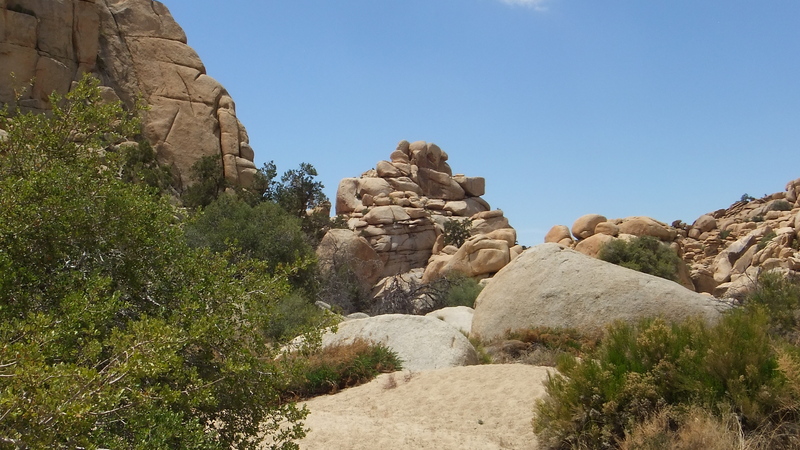 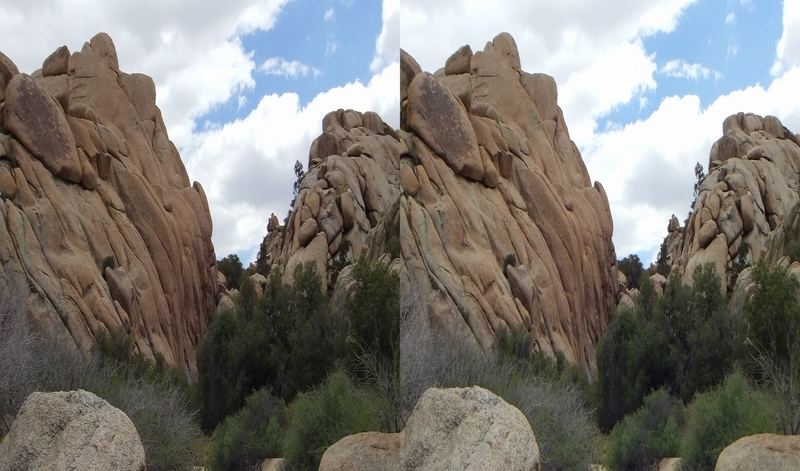 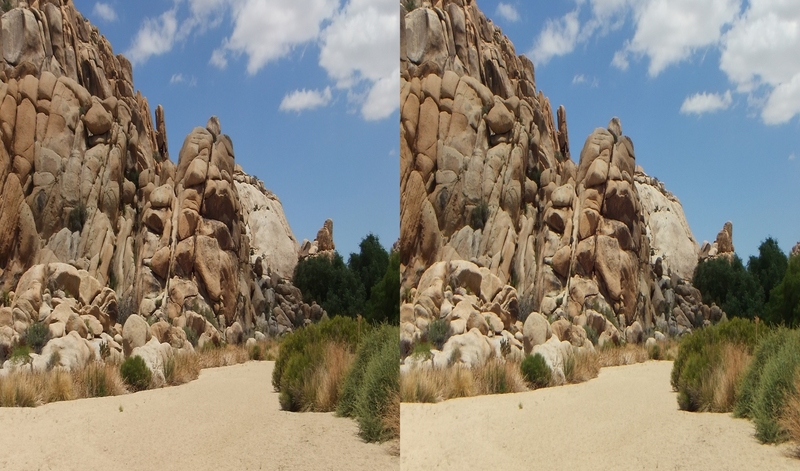 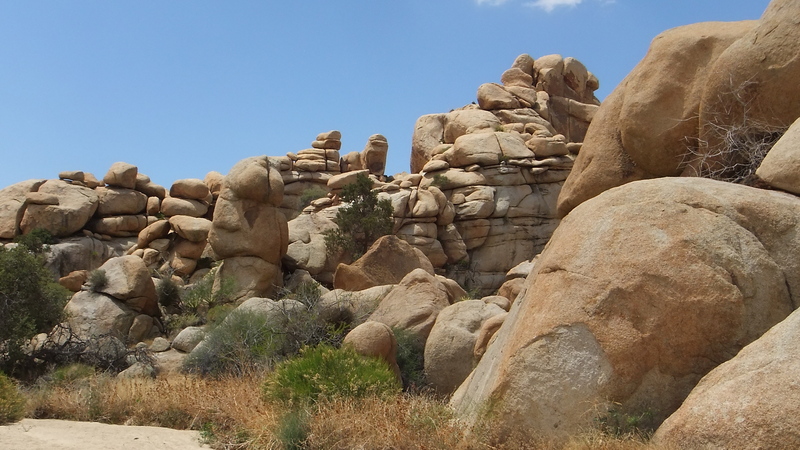 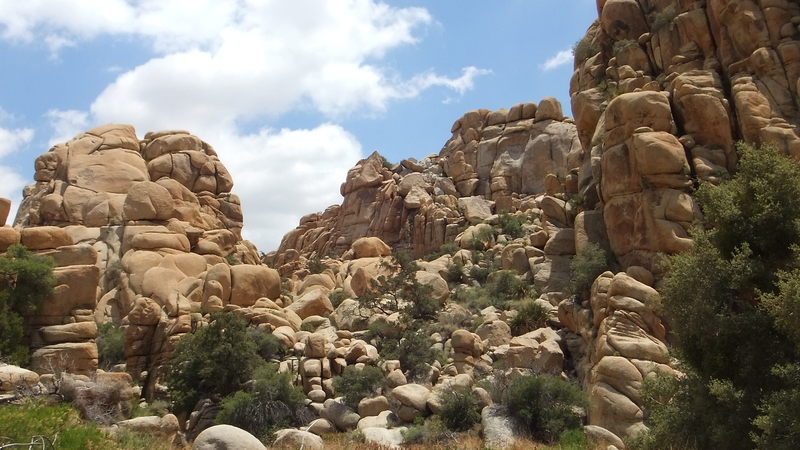 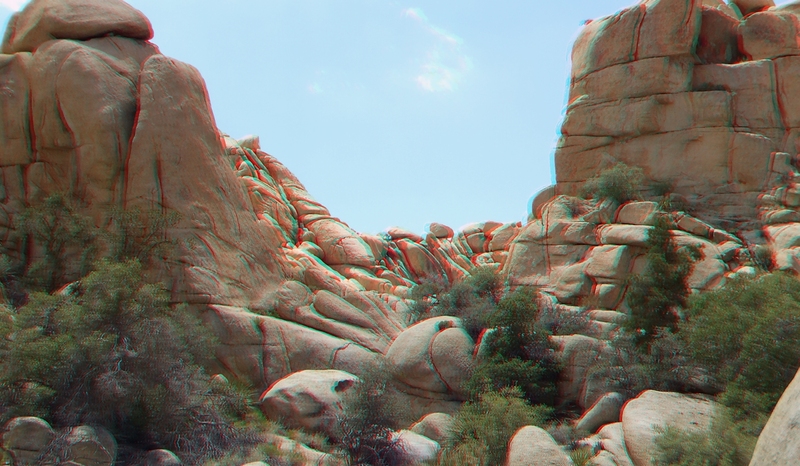 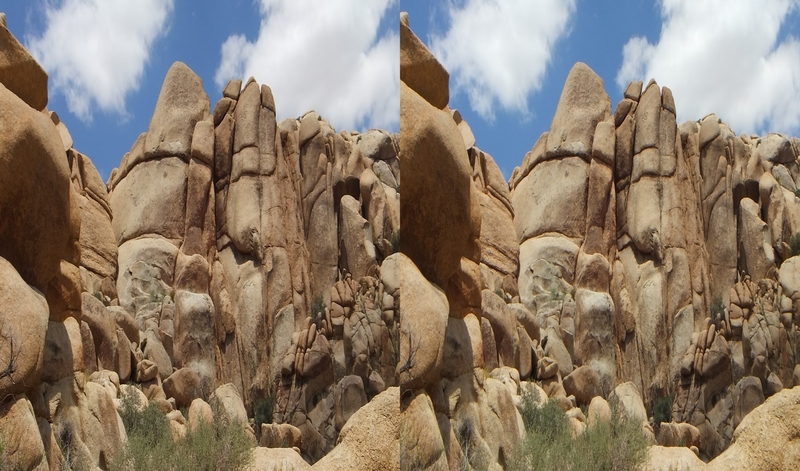 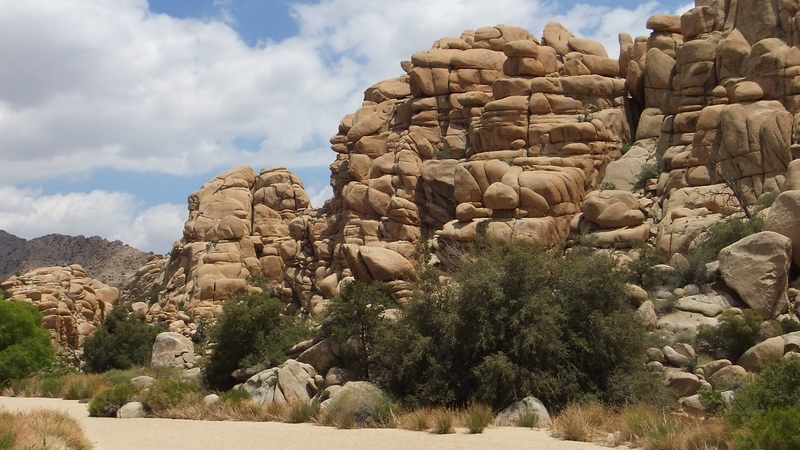 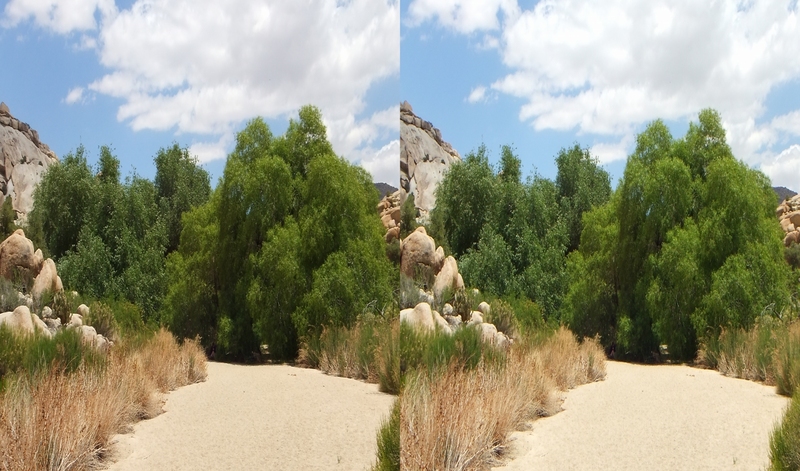 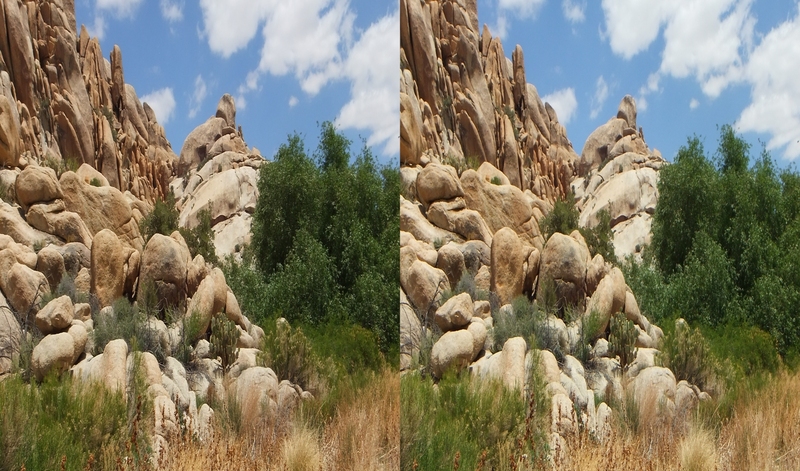 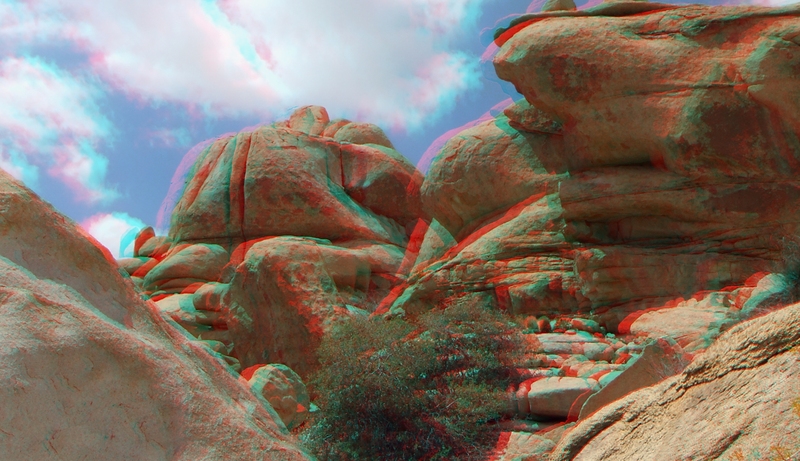 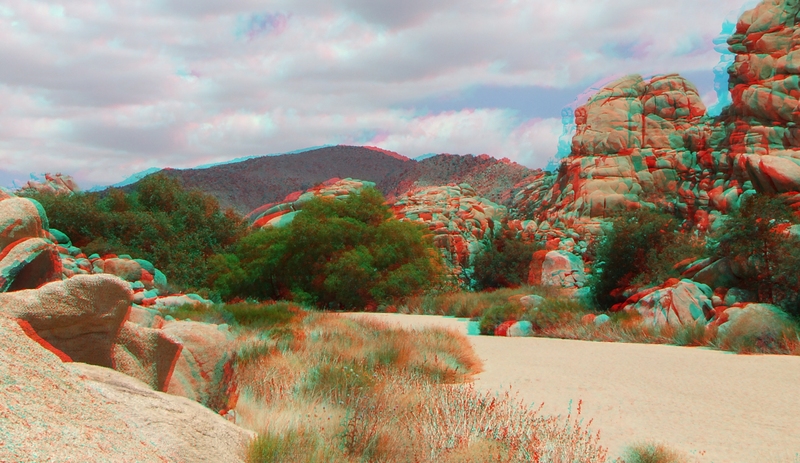 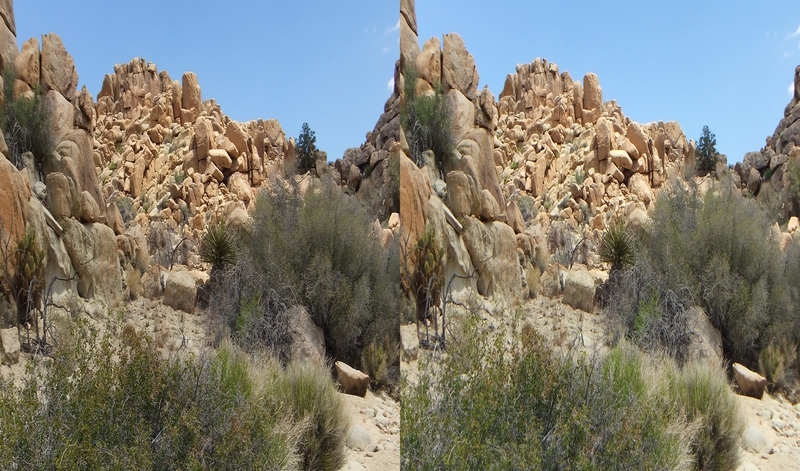 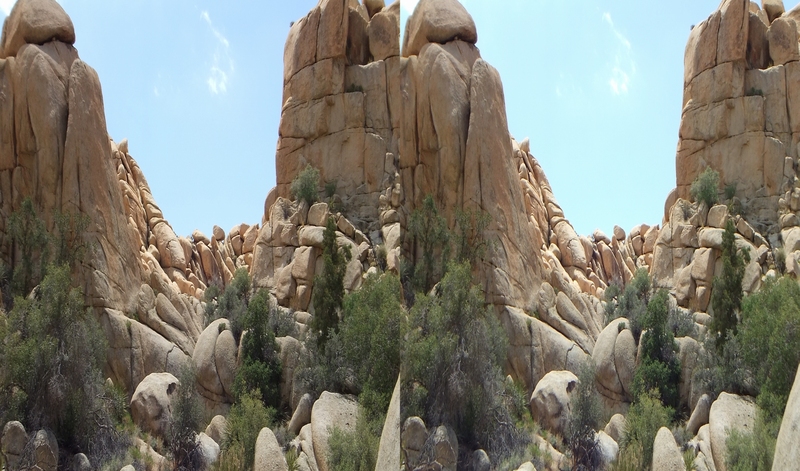 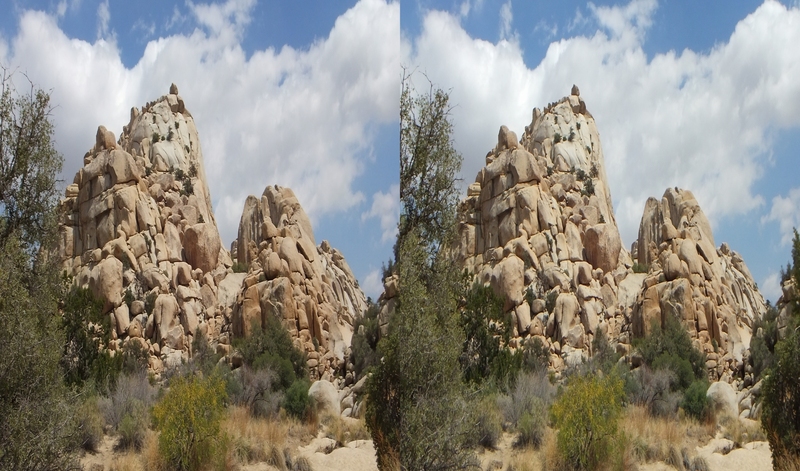 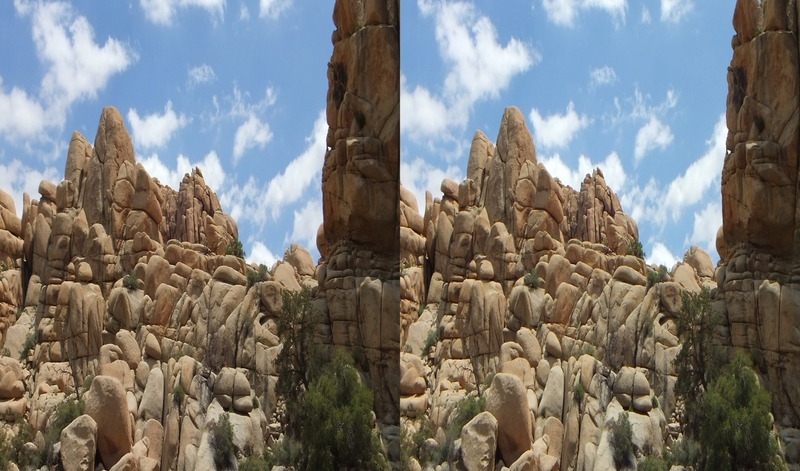 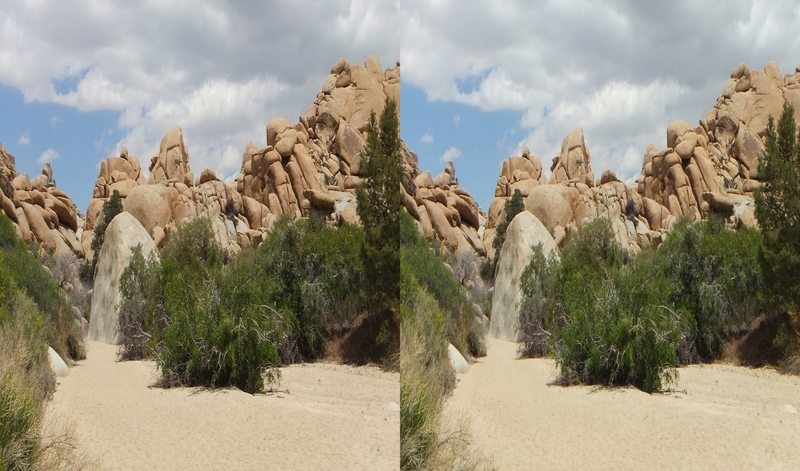 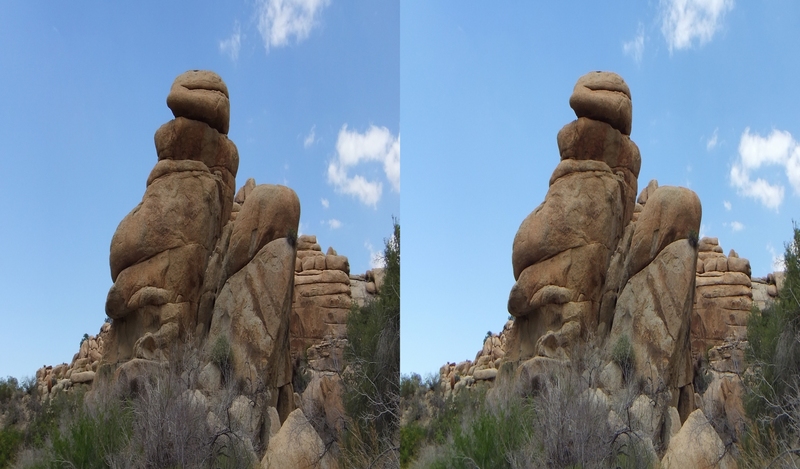 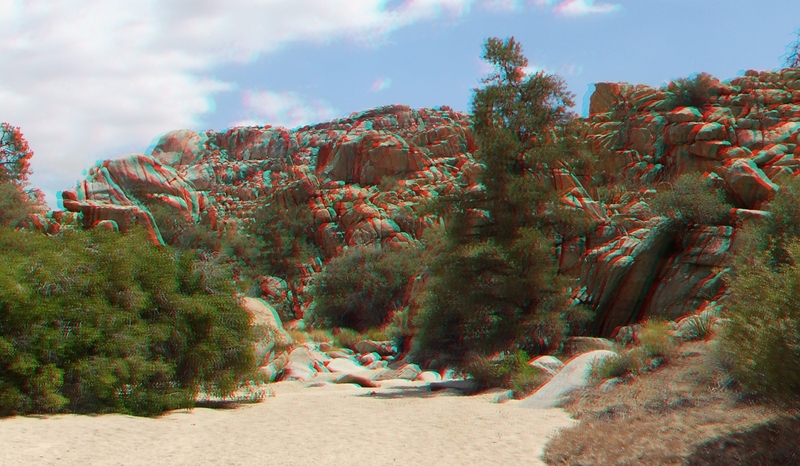 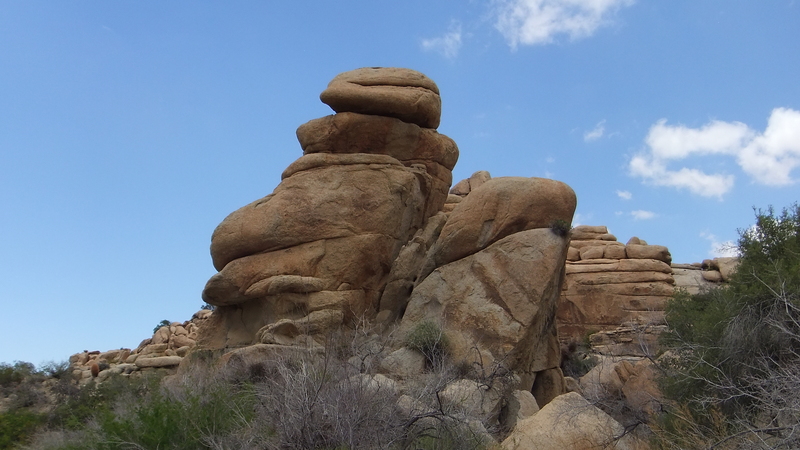 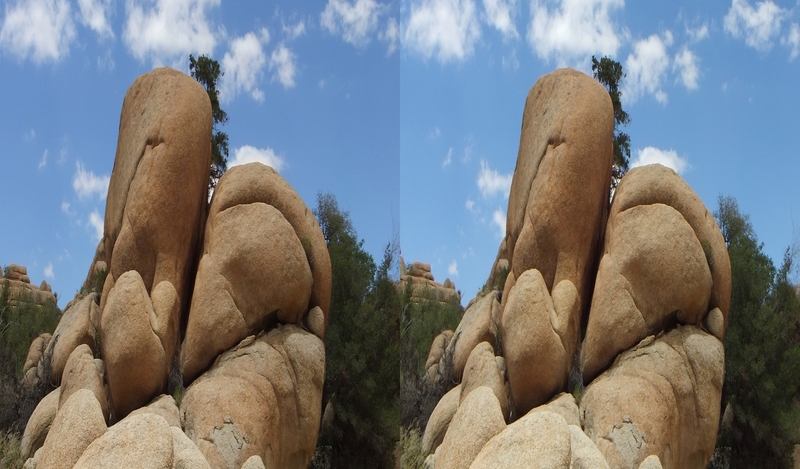 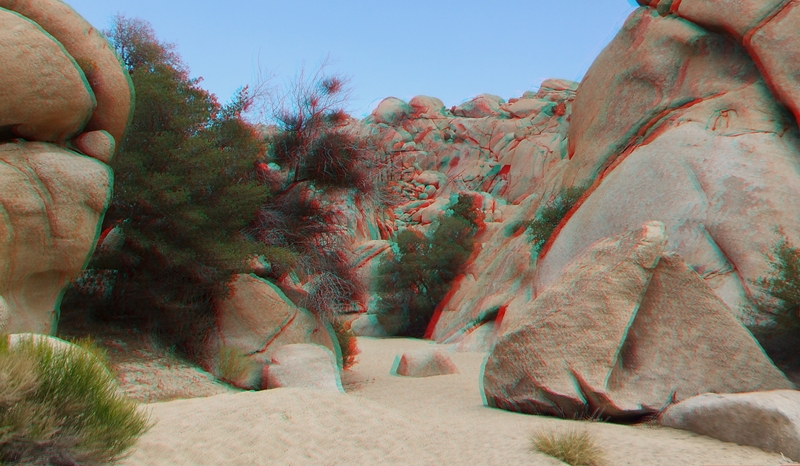 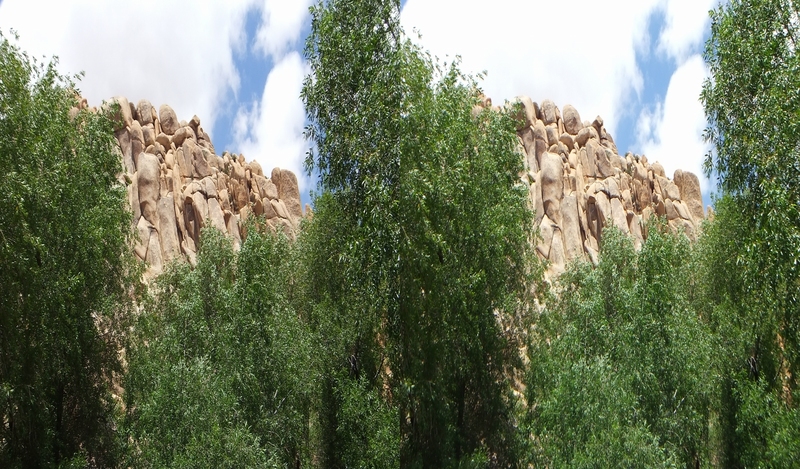 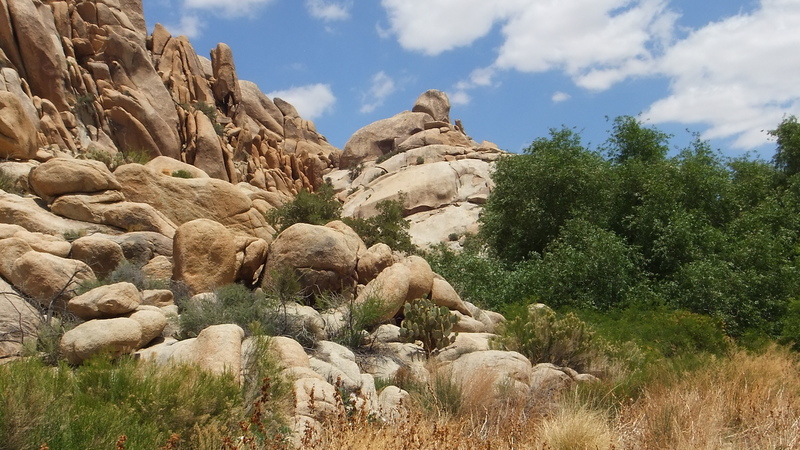 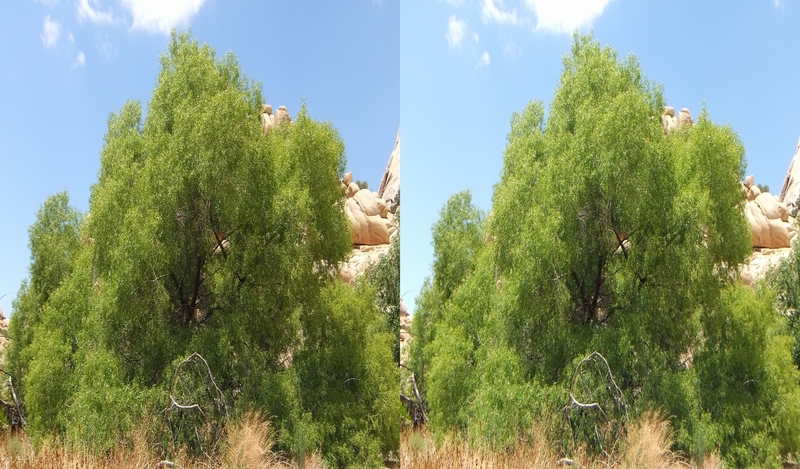 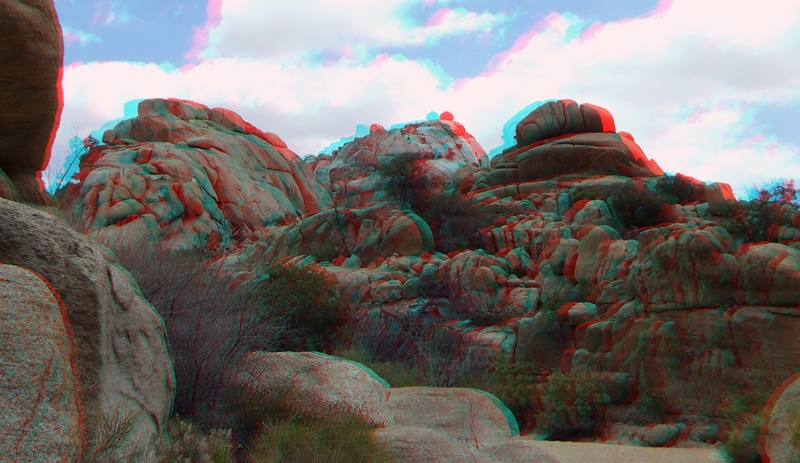 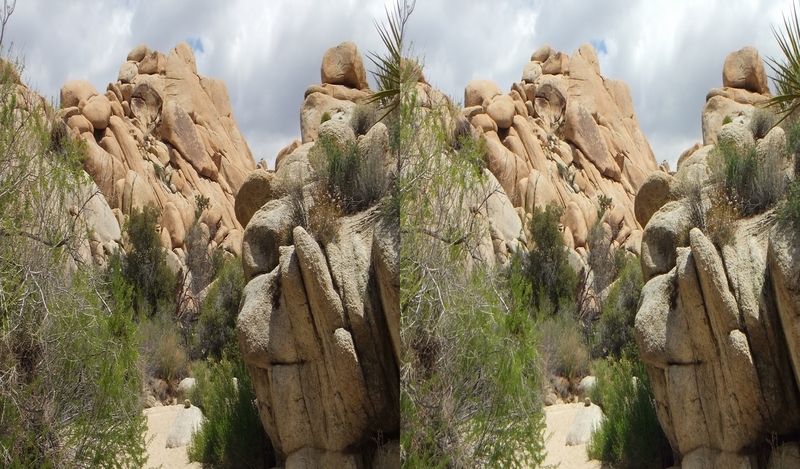 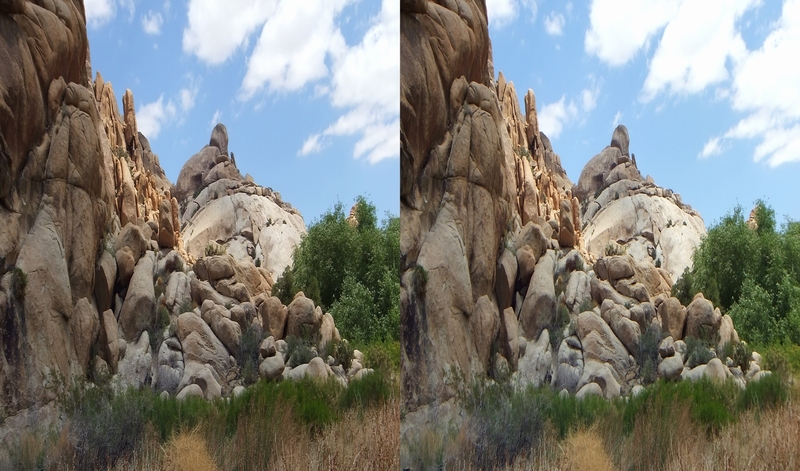 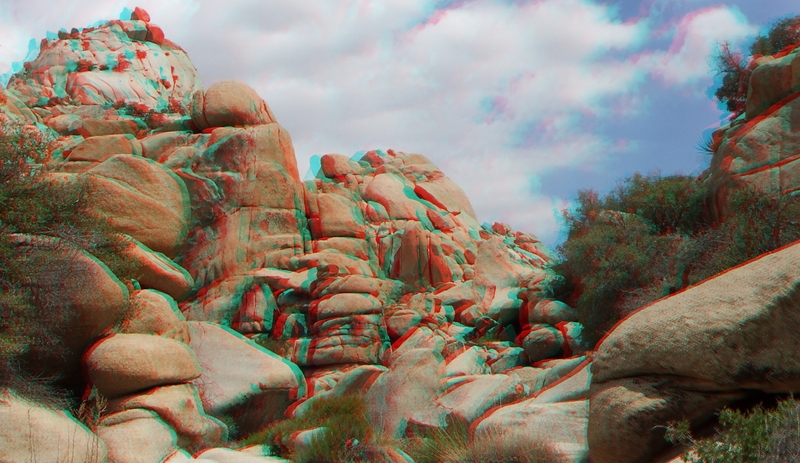 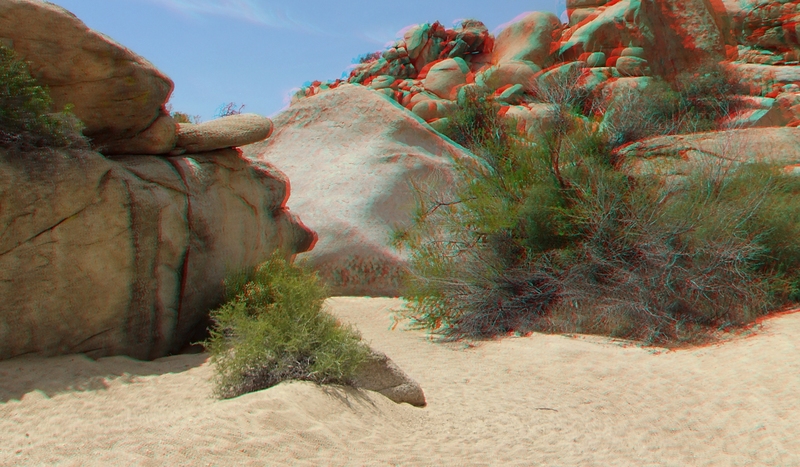 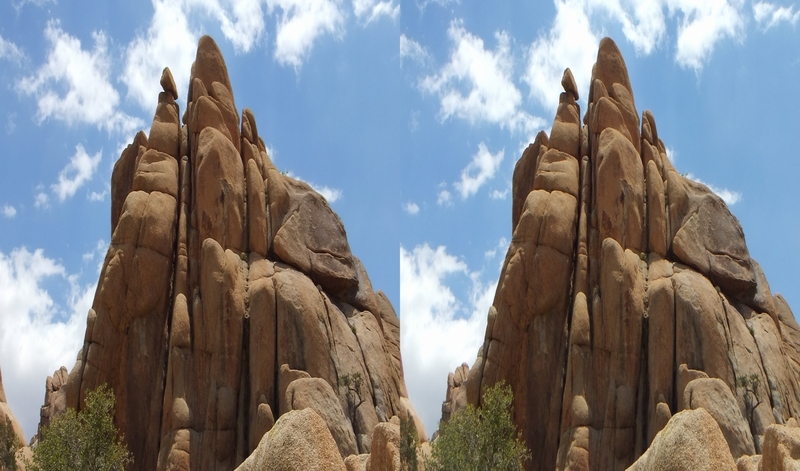 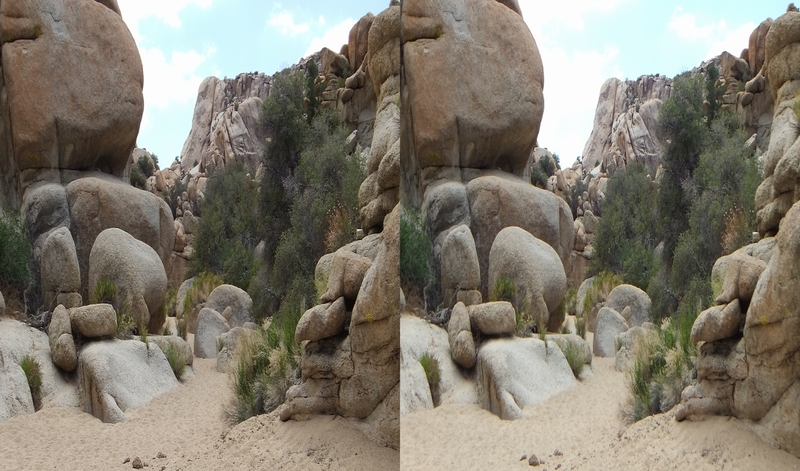 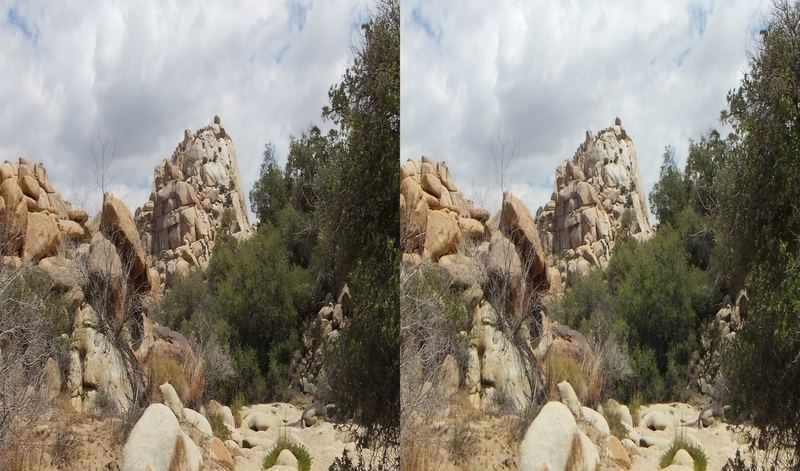 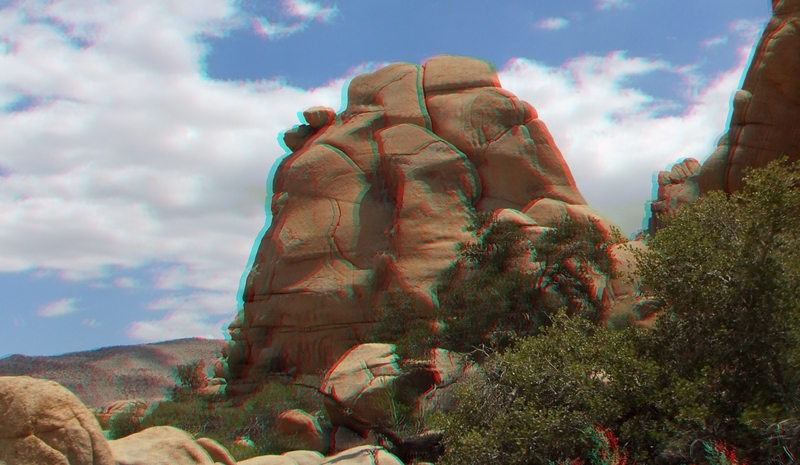 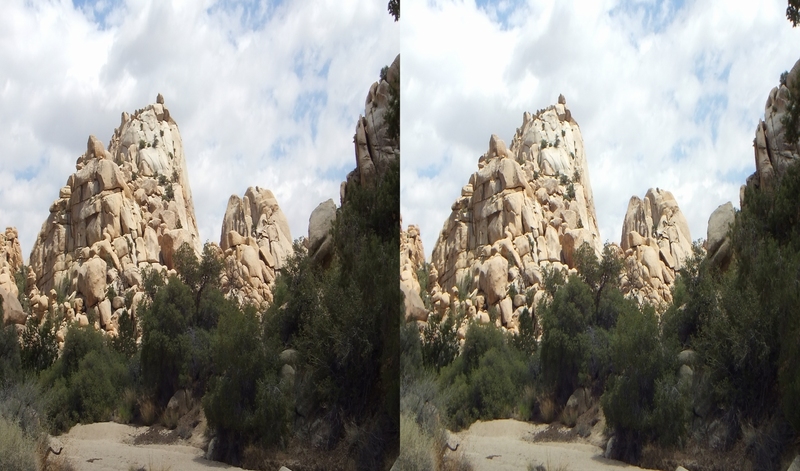 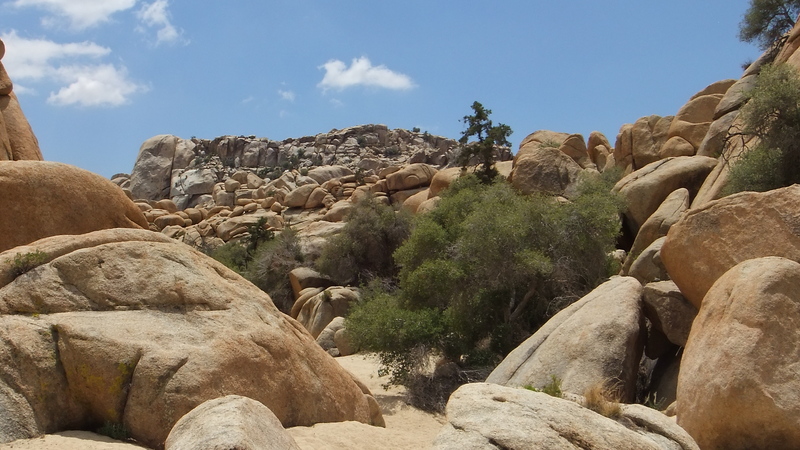 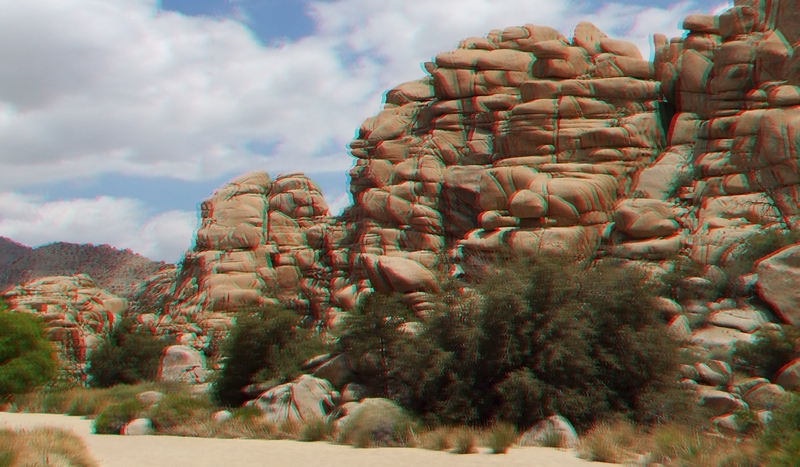 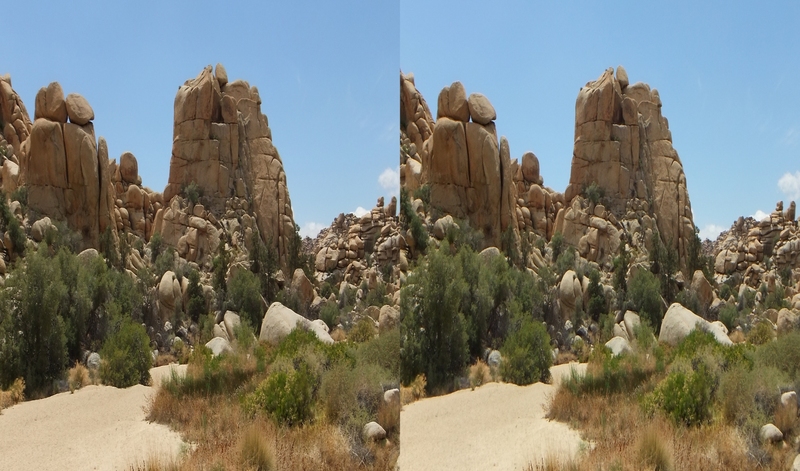 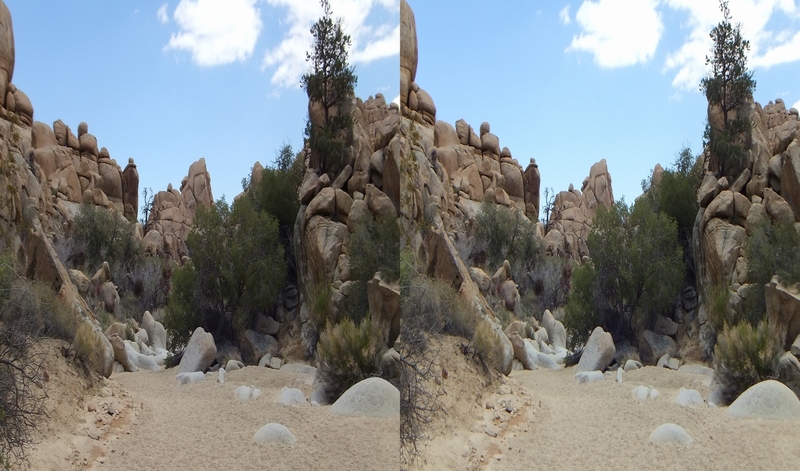 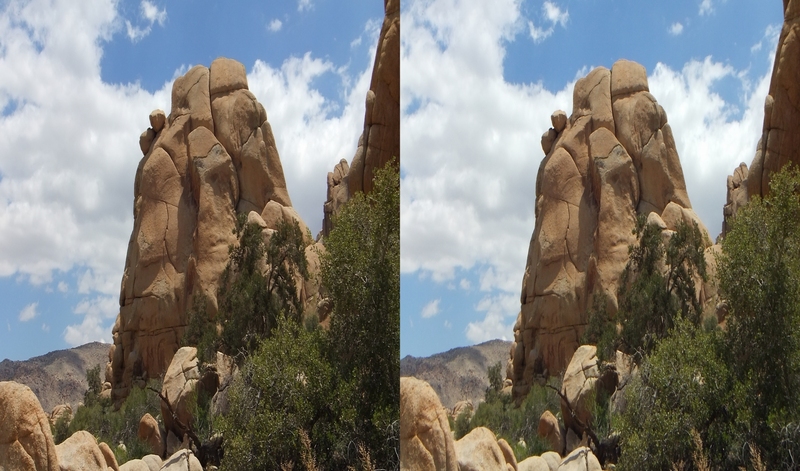 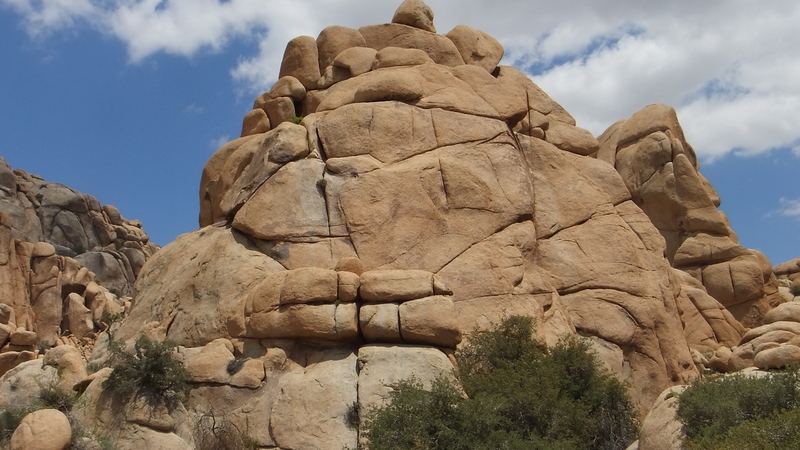 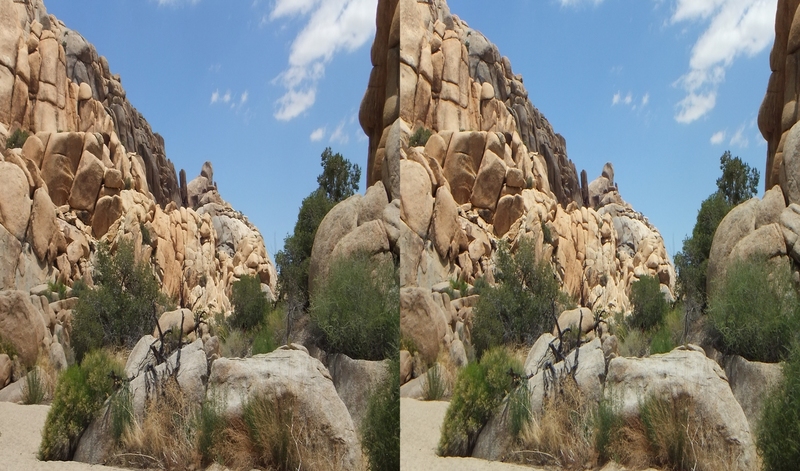 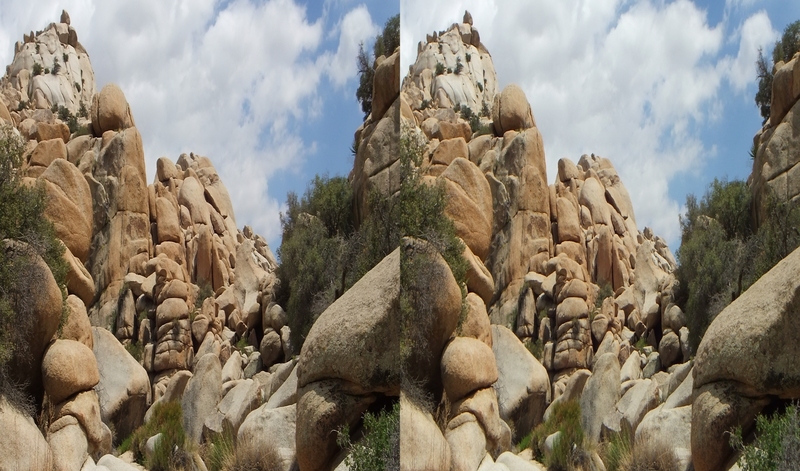 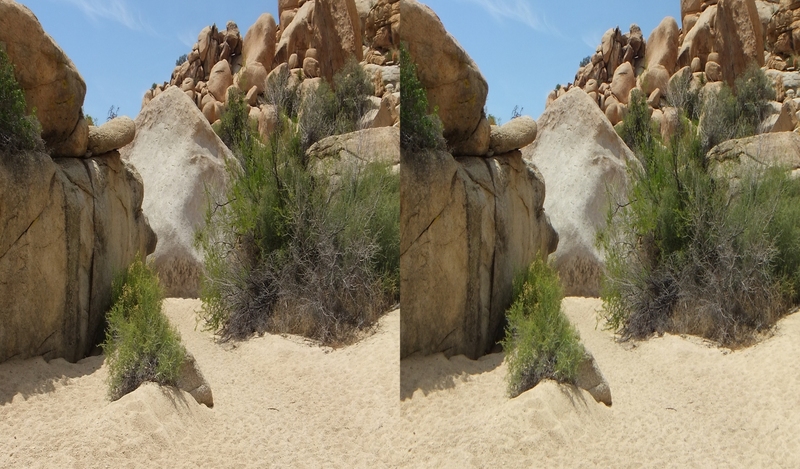 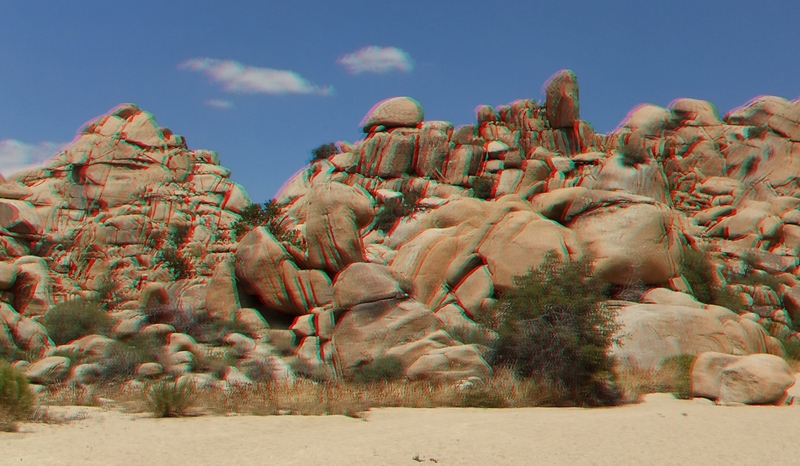 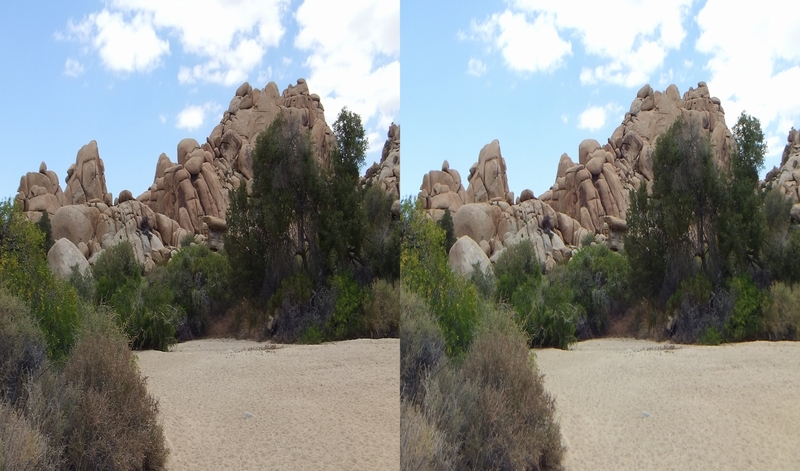 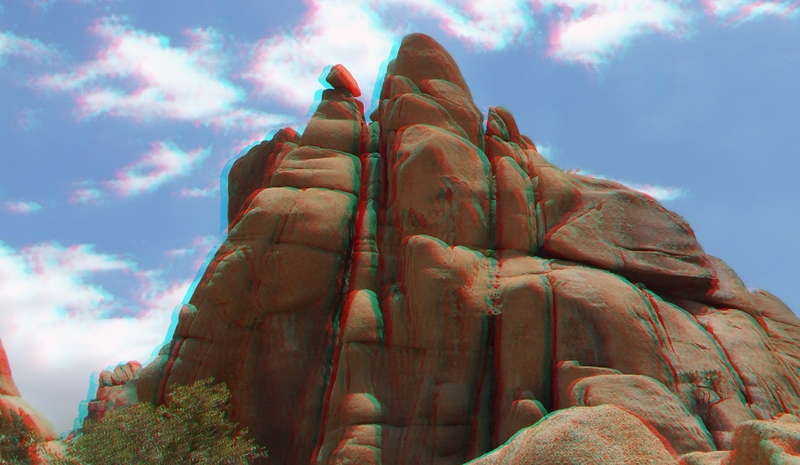 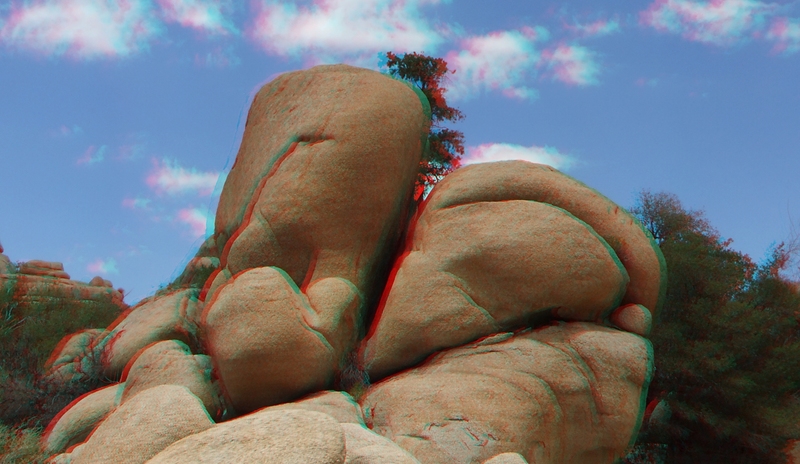 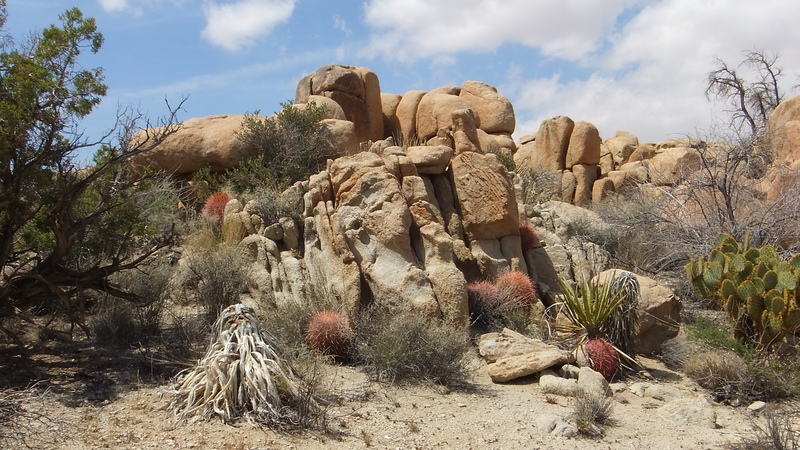 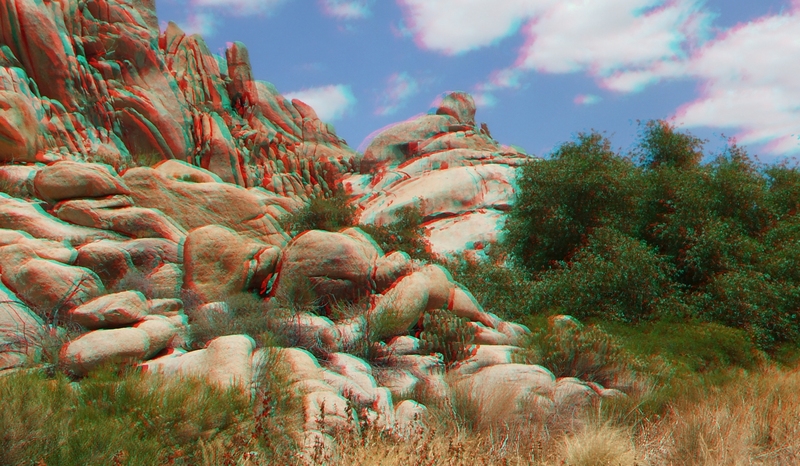 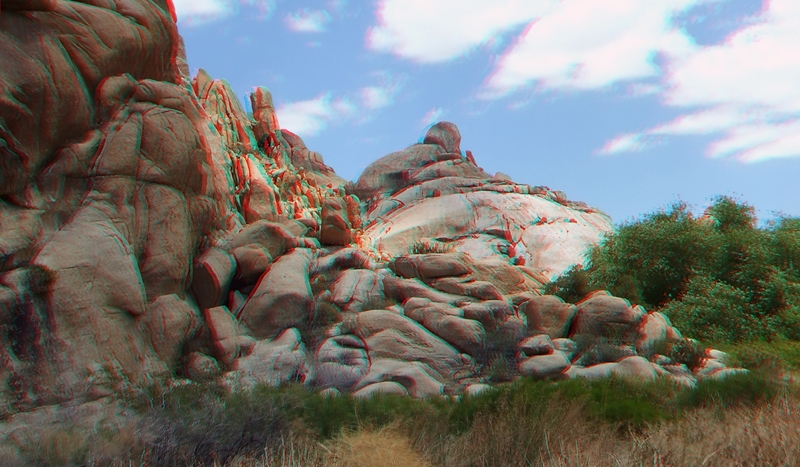 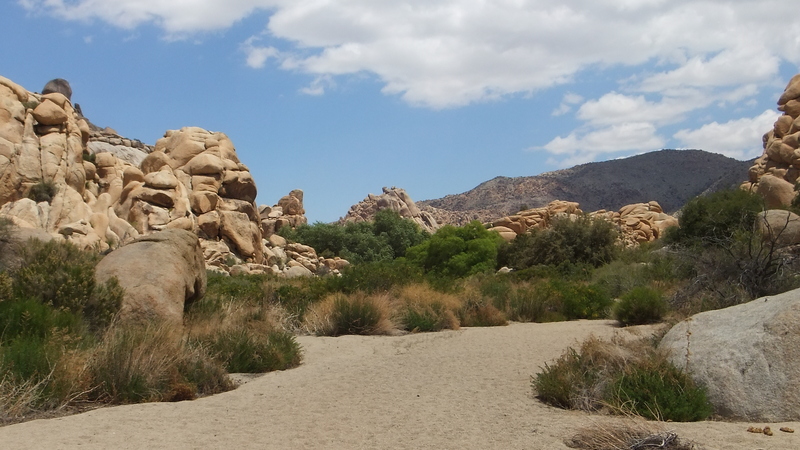 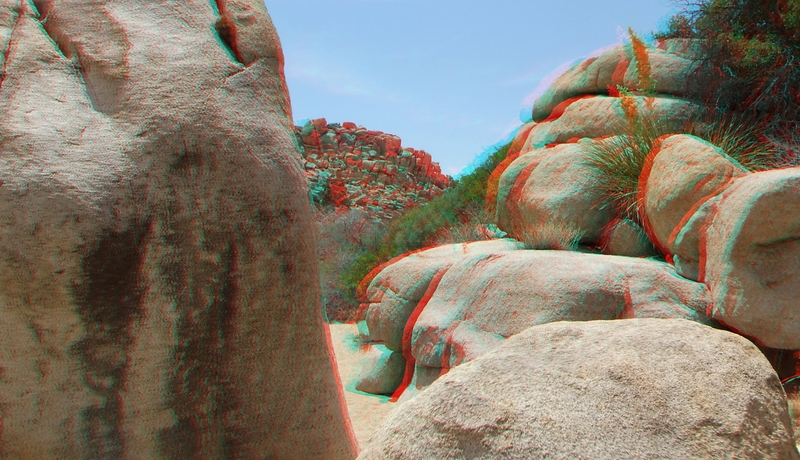 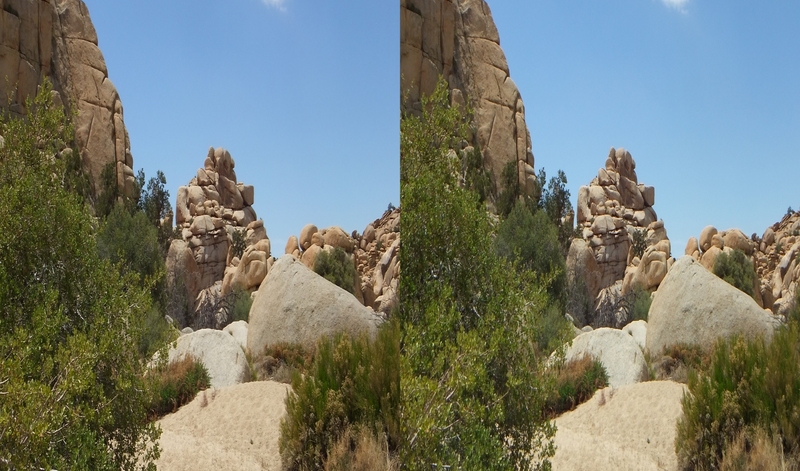 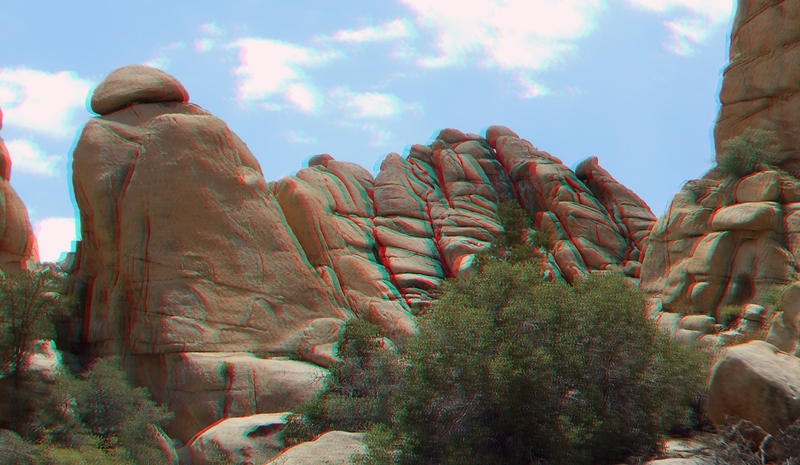 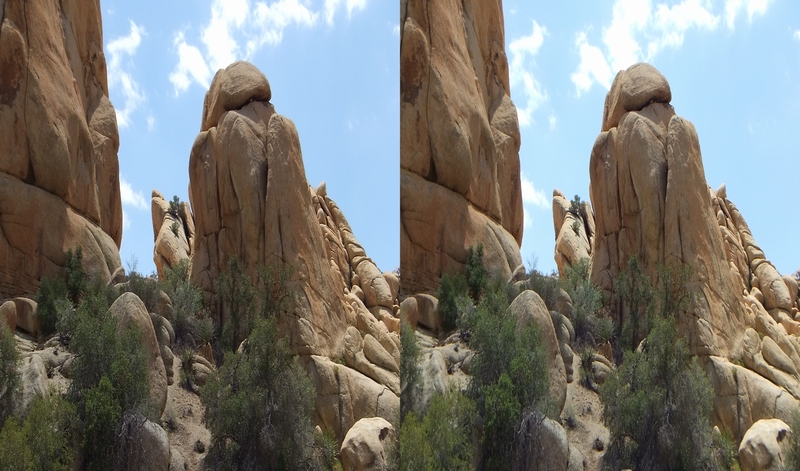 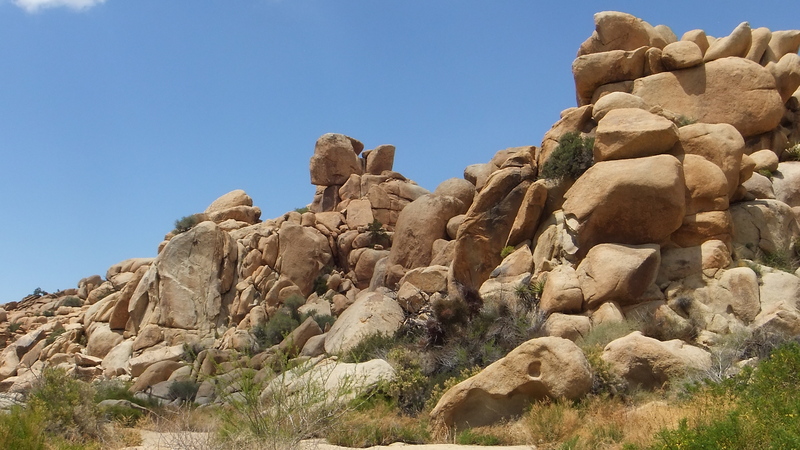 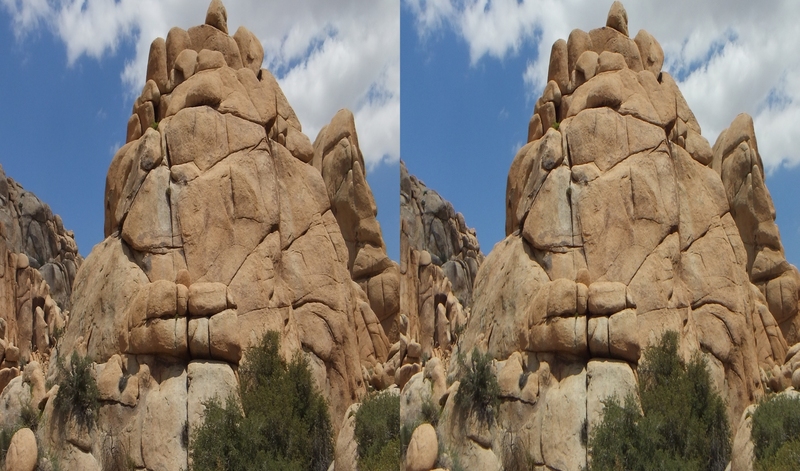 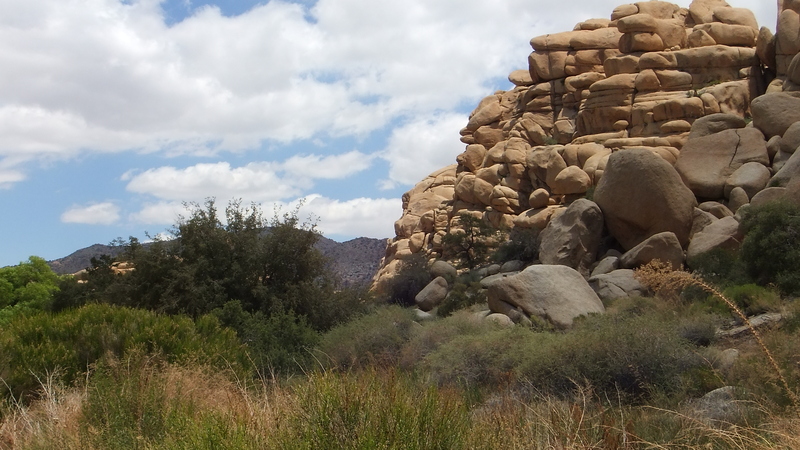 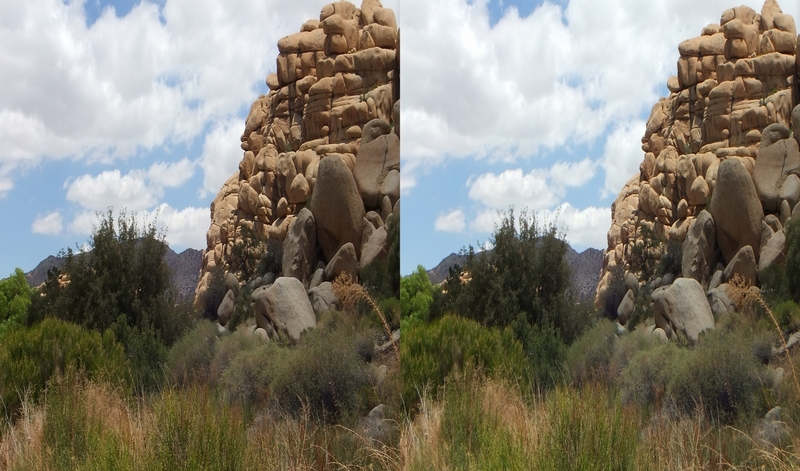 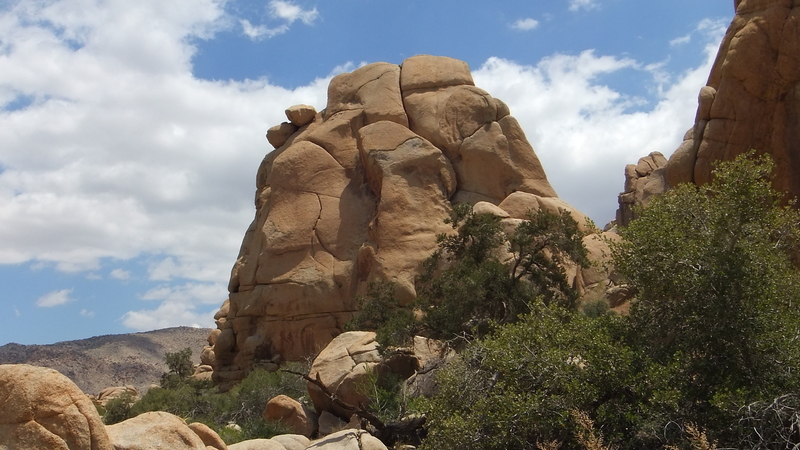 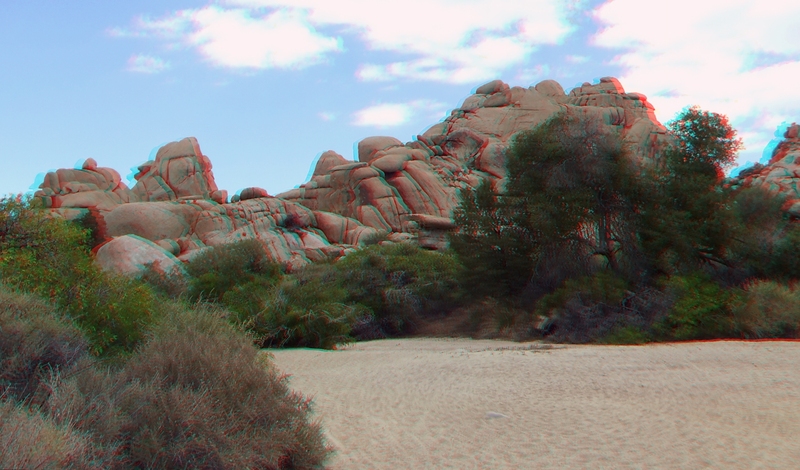 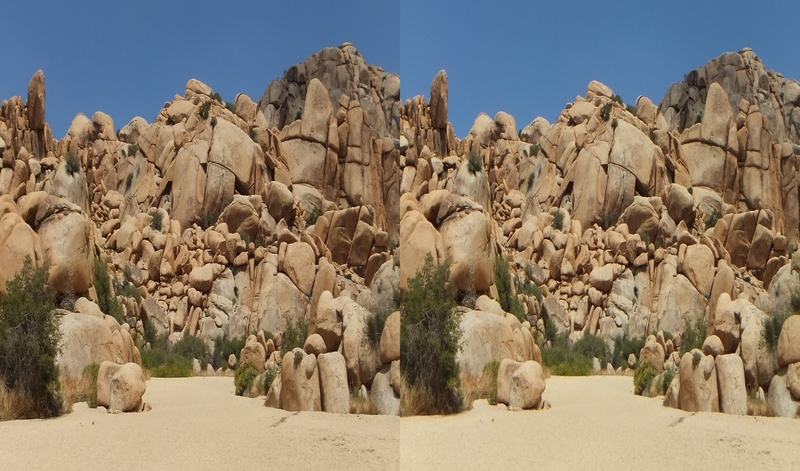 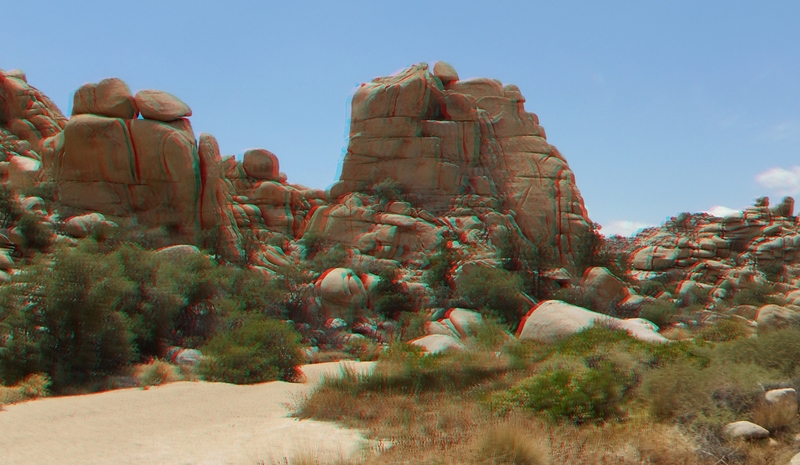 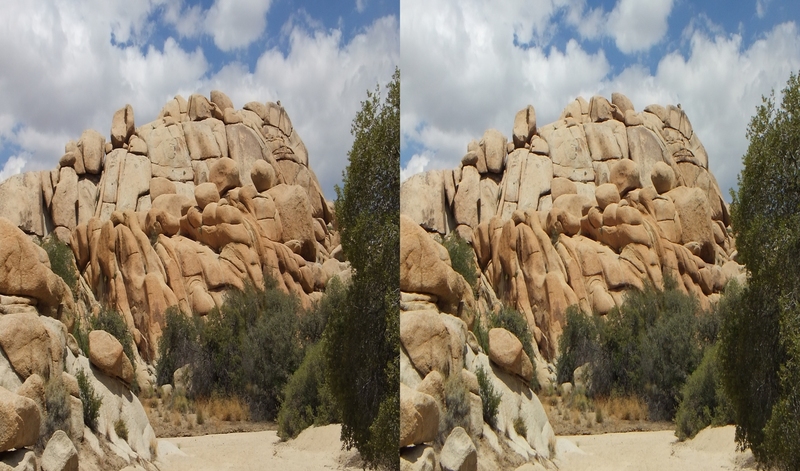 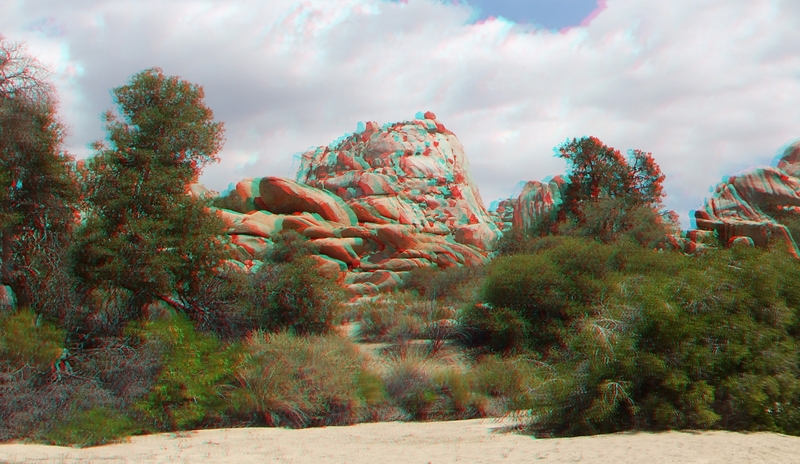 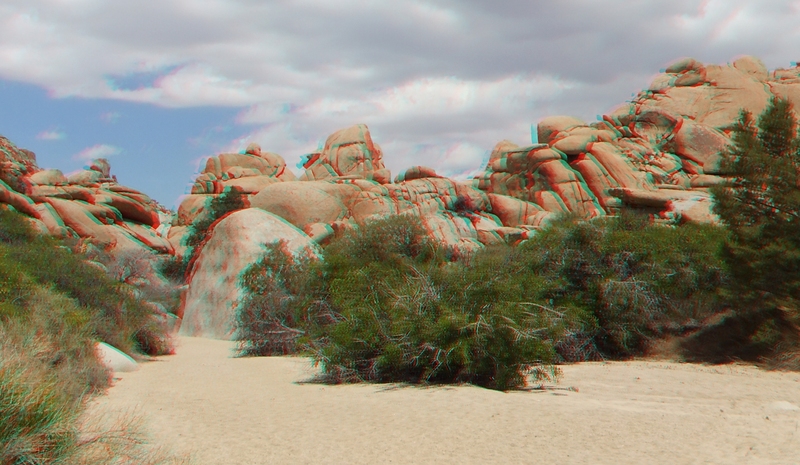 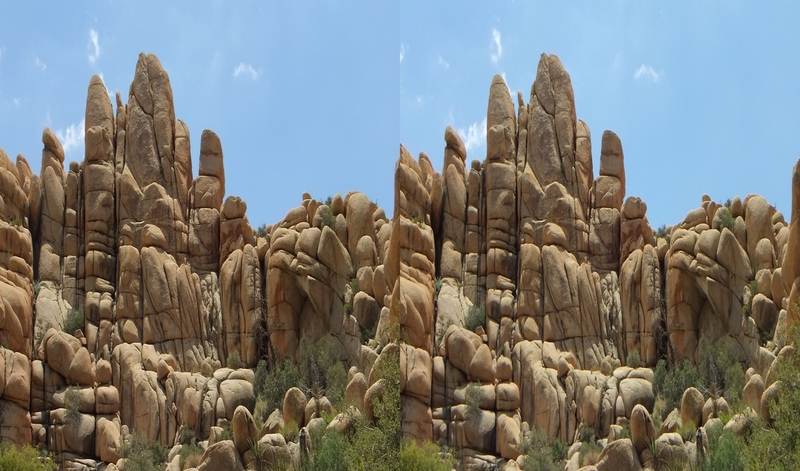 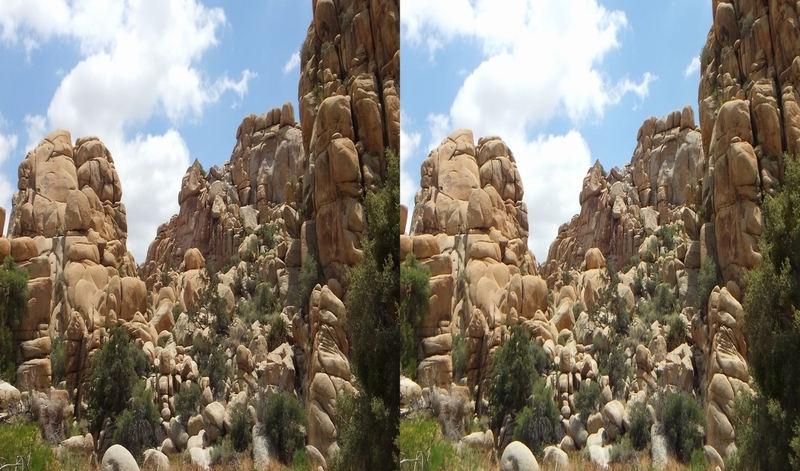 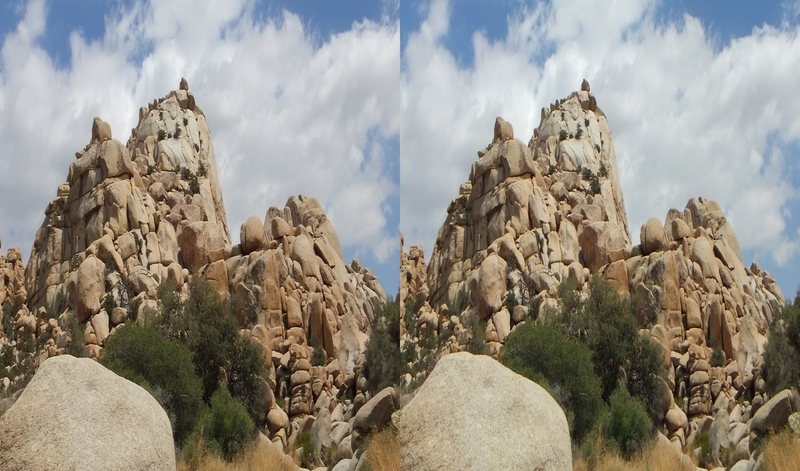 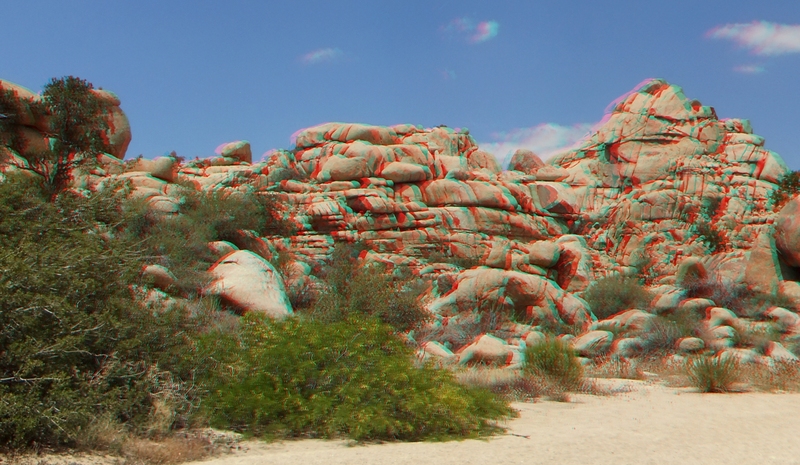 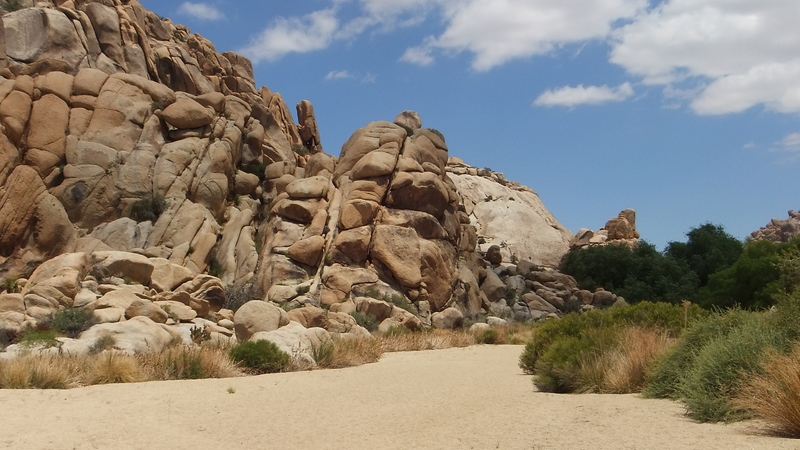 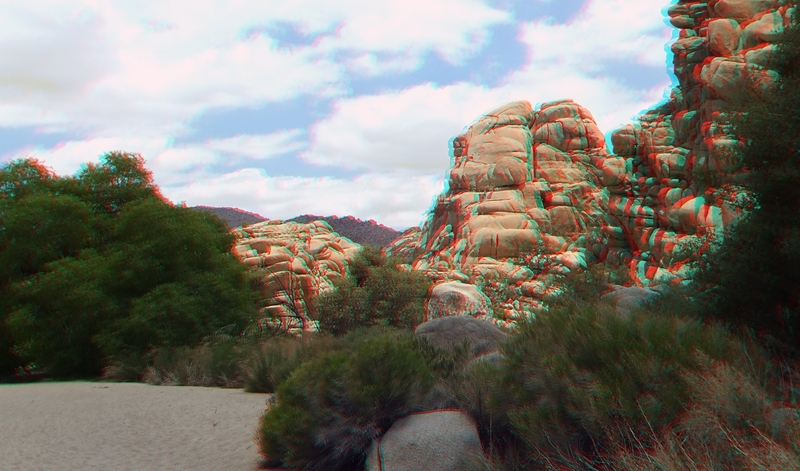 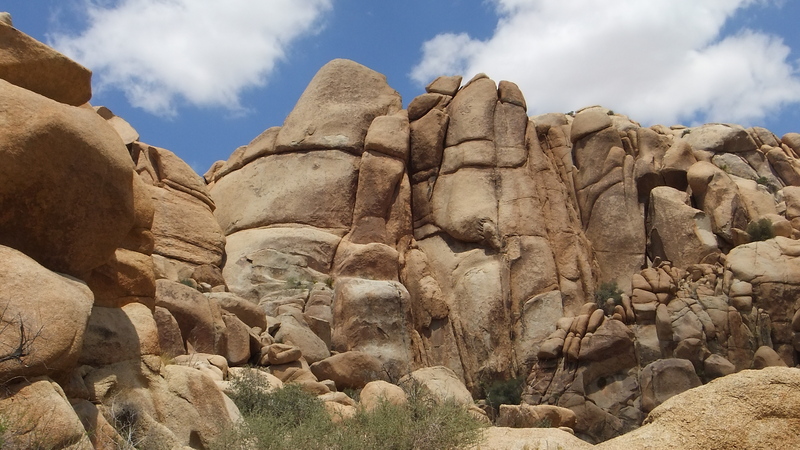 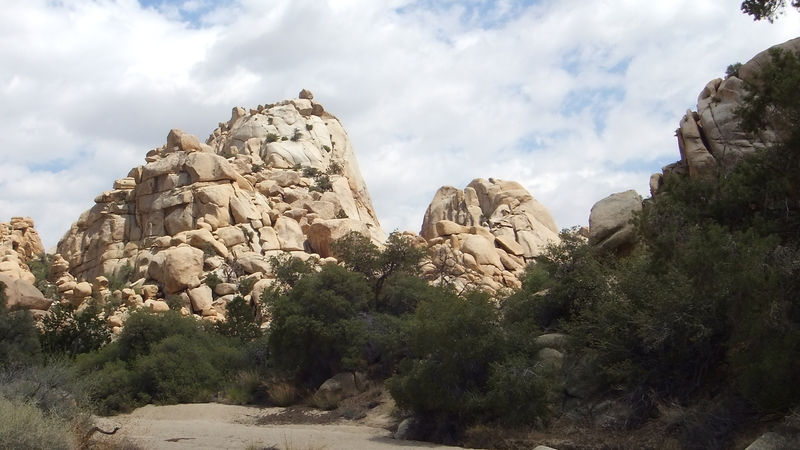 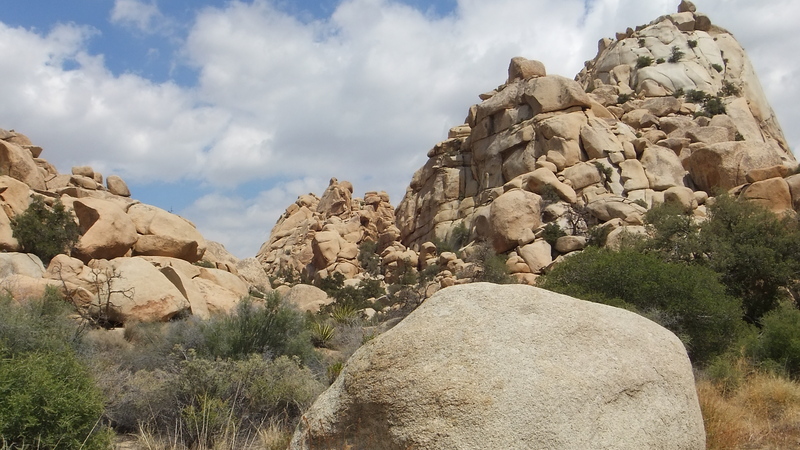 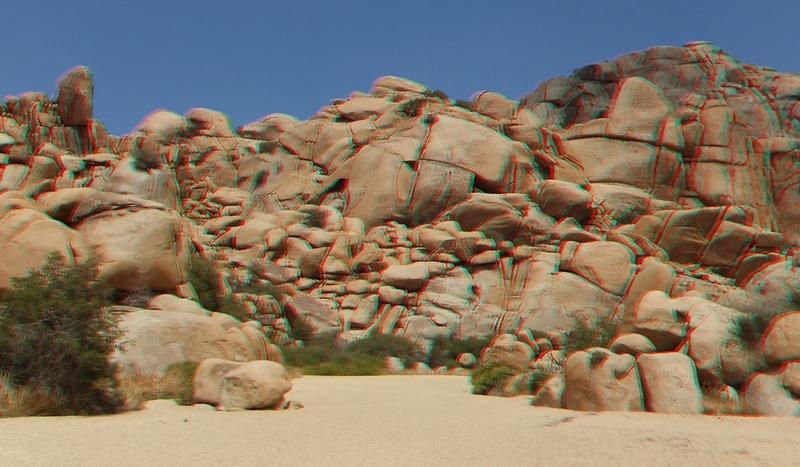 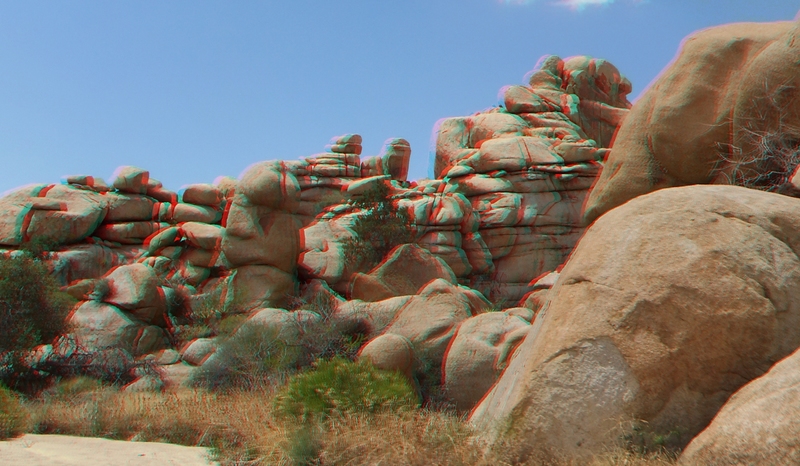 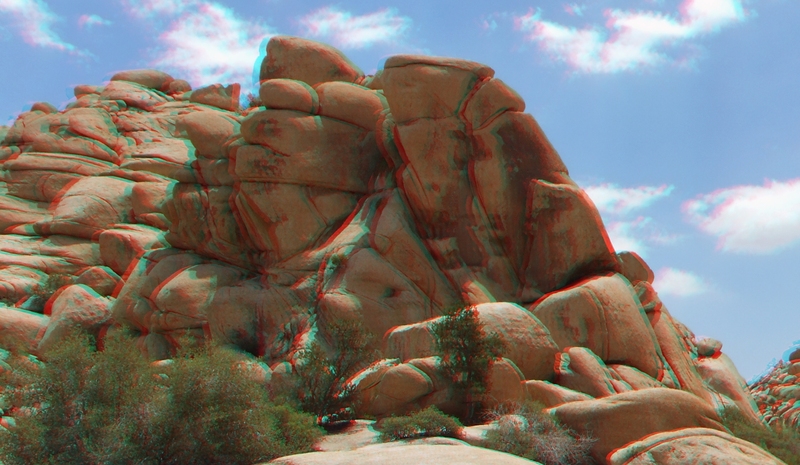 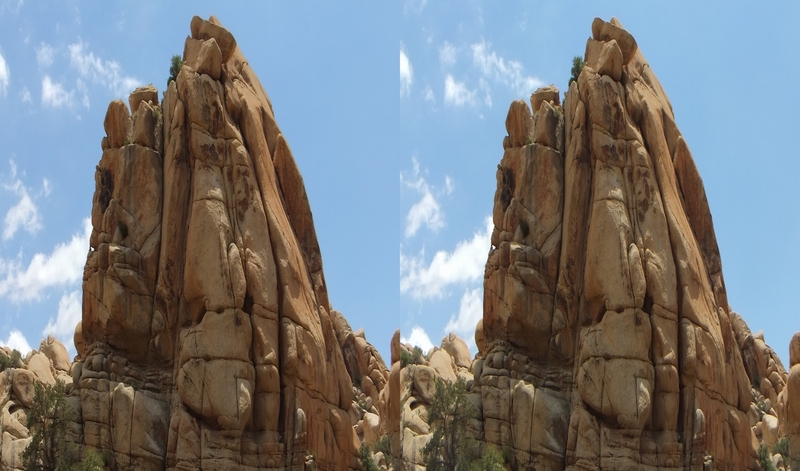 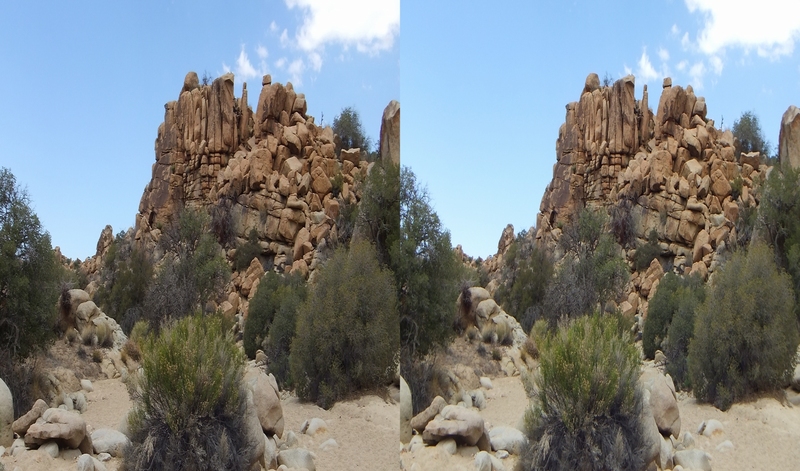 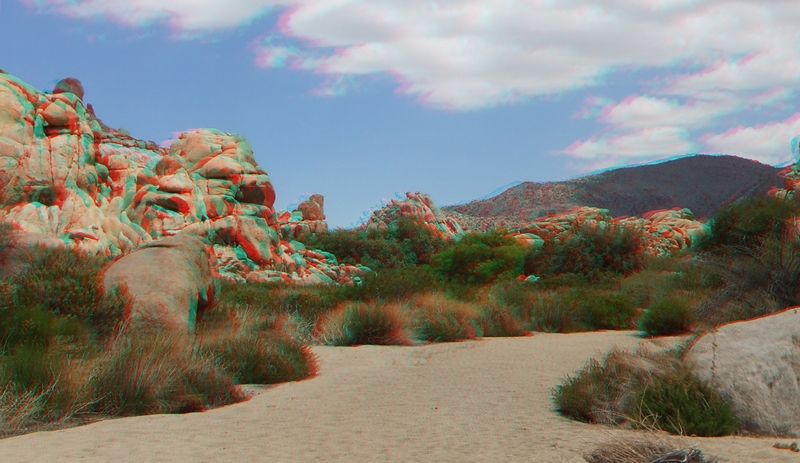 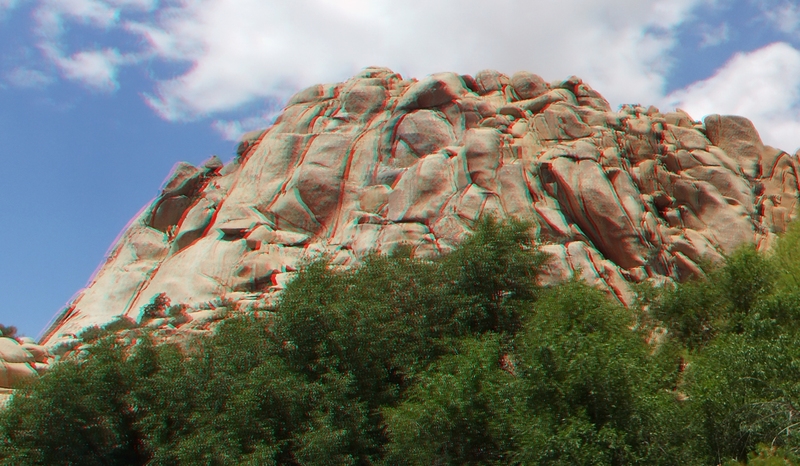 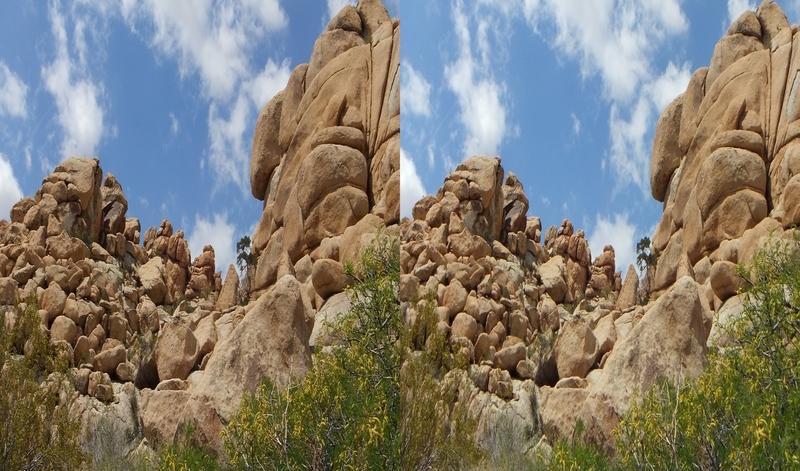 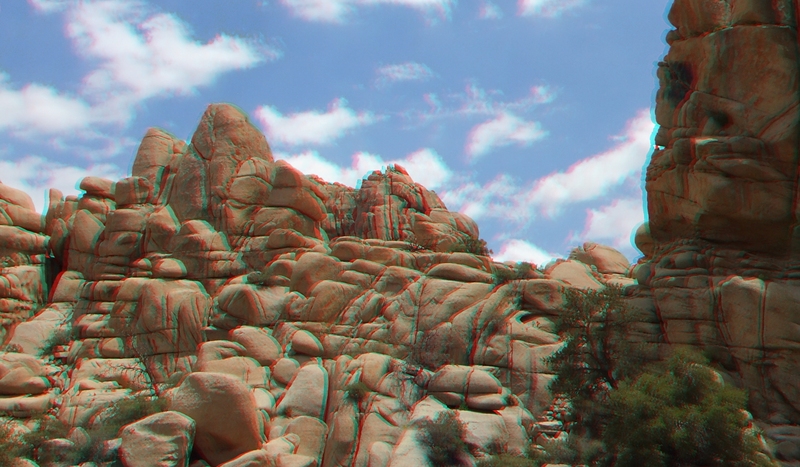 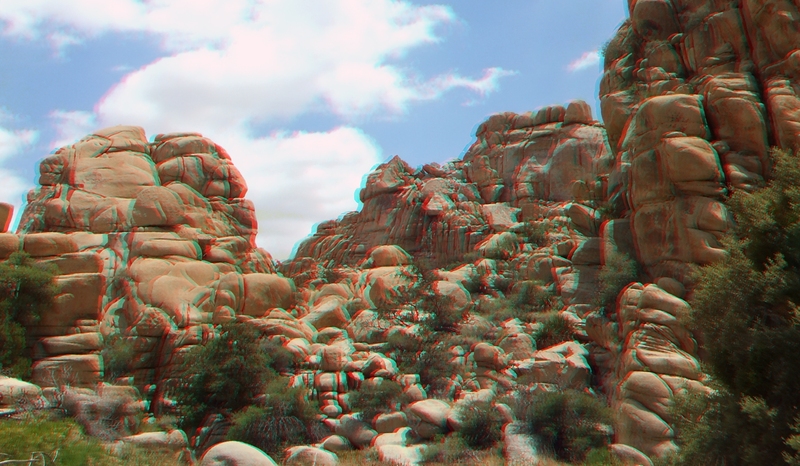 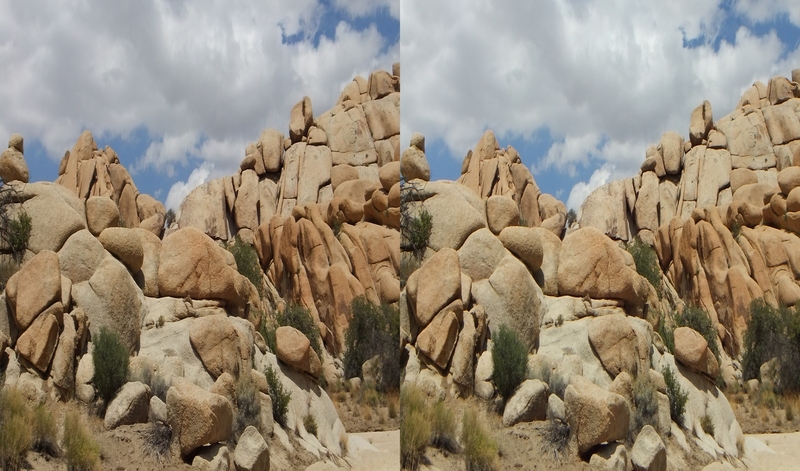 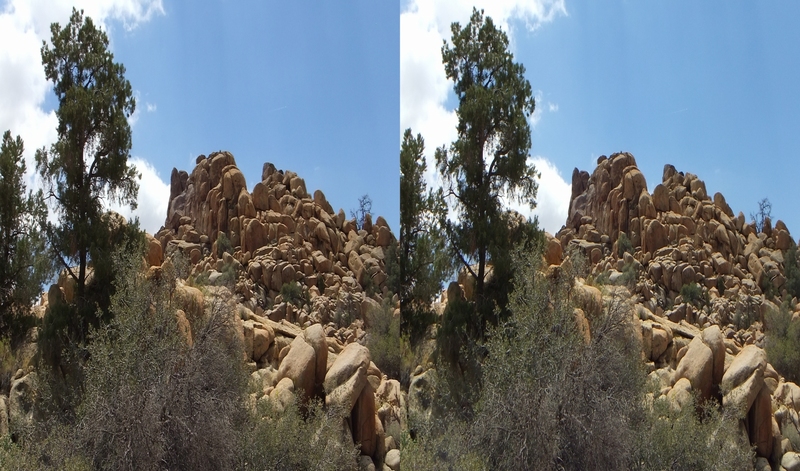 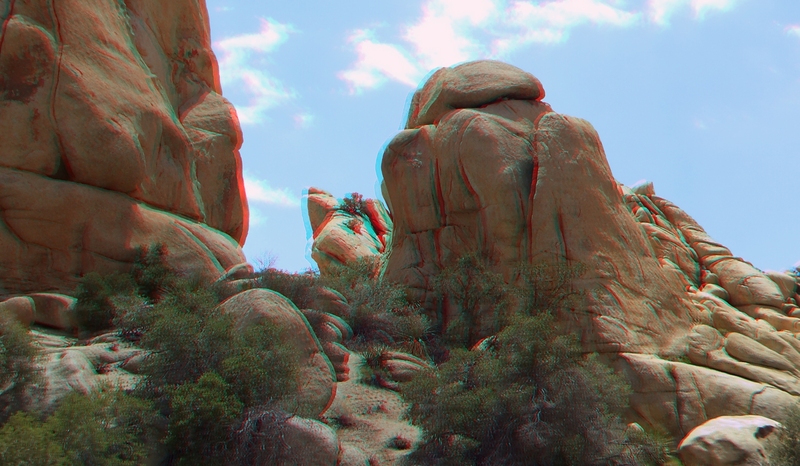 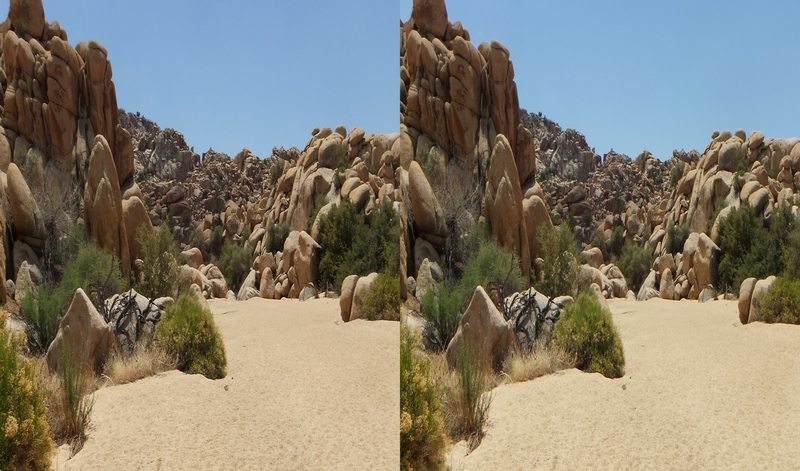 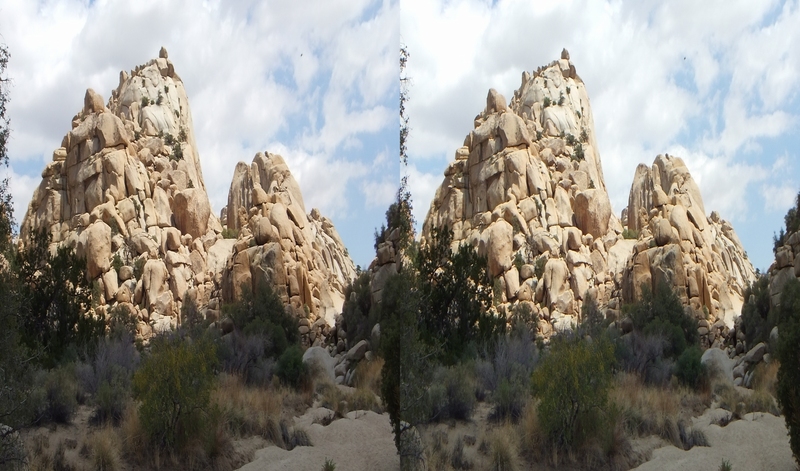 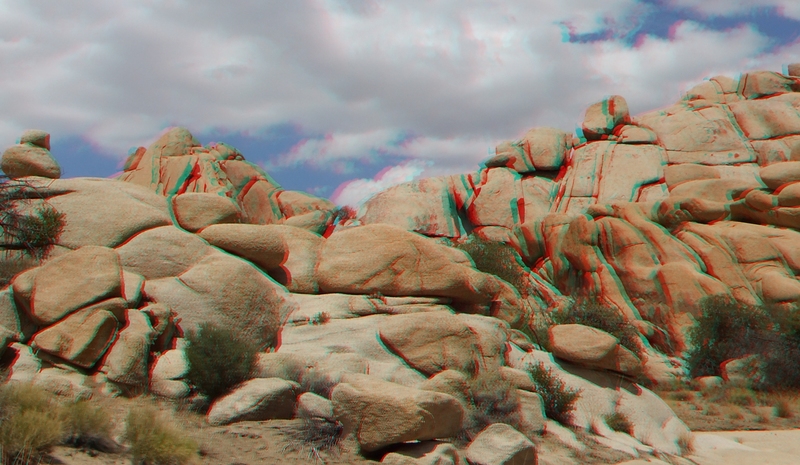 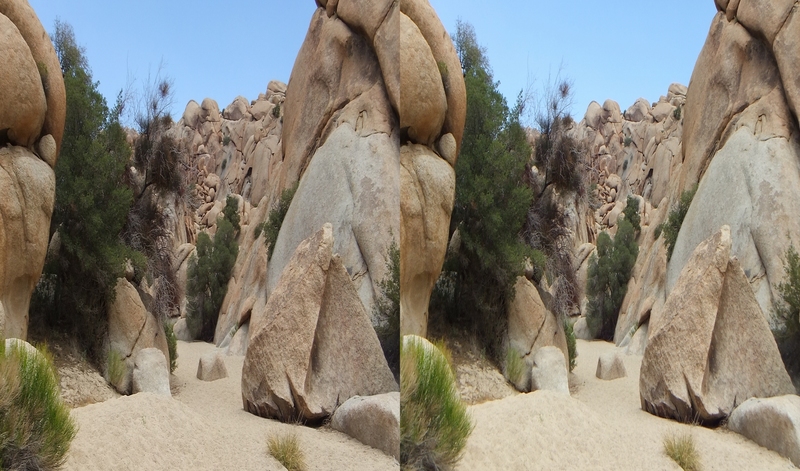 Thank you for visiting Joshuatree3D.com. 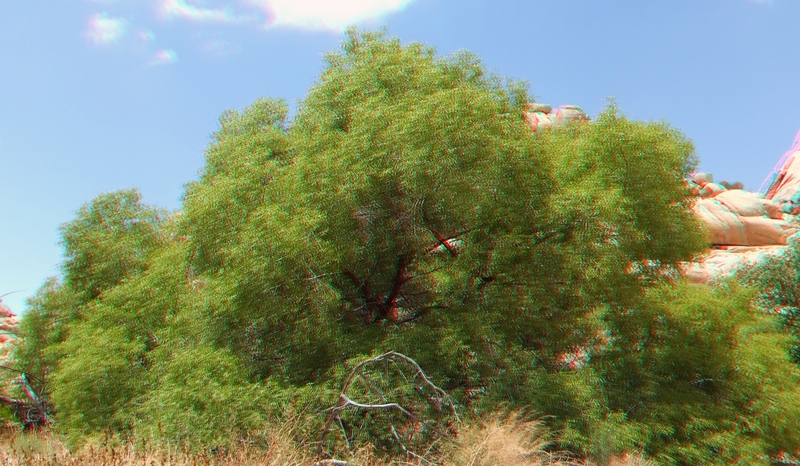 I hope you enjoyed the Willow Hole selections.